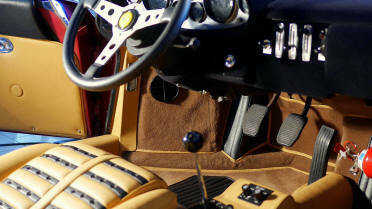 Ferrari 512 M, Final point.. 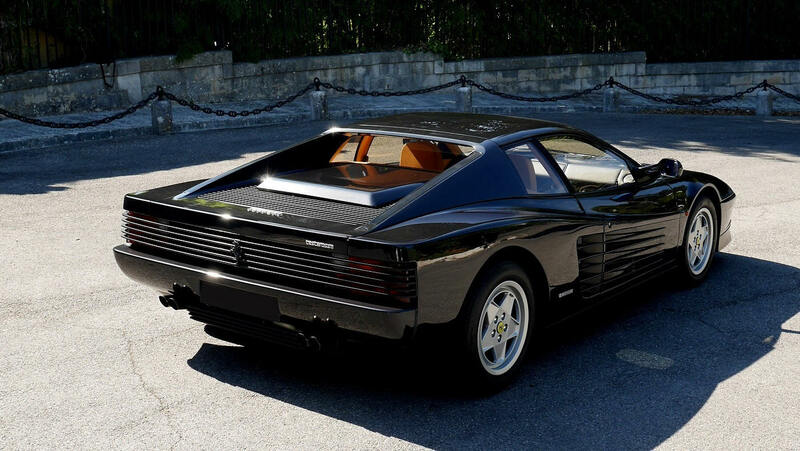 The Ferrari Testarossa has marked a whole generation, but to finish in style, the artists of Maranello go after the inspiration and complete their masterpiece, the 512 M is a dream car, they will not make than 501. 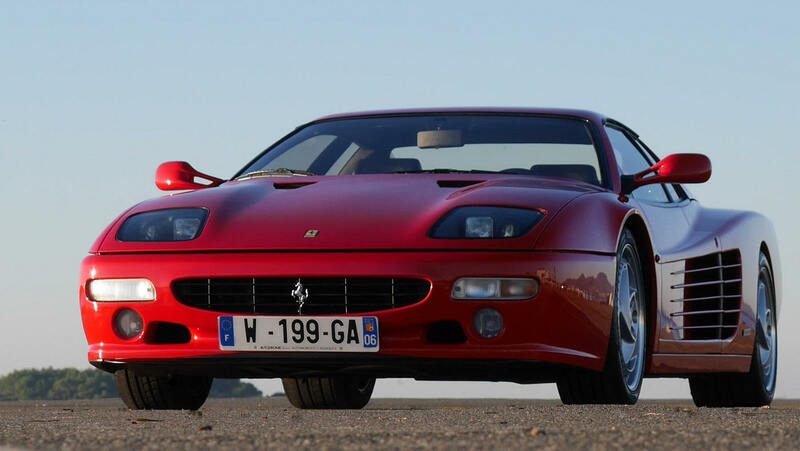 More powerful, lighter, a dazzling line, accomplished and provoking, it is simply the ultimate Ferrari with twelve-cylinder engine placed in central-rear position. 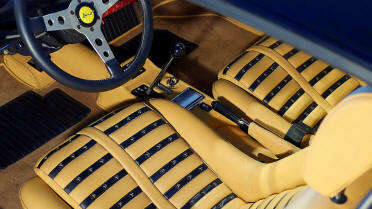 Historical and yet confidential, the 512 M will appear obviously in the most important collections. 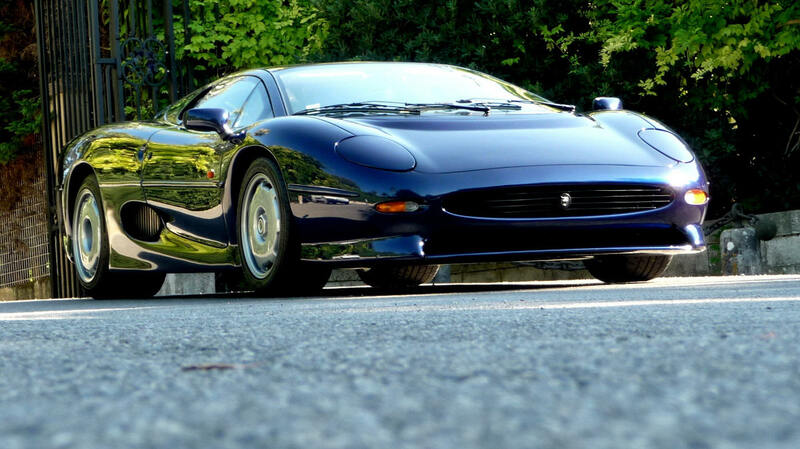 Its design is a perfection and our eye is captured by its fascinating beauty, the JAGUAR XJ 220 is not a simple automobile but an authentic work of art. 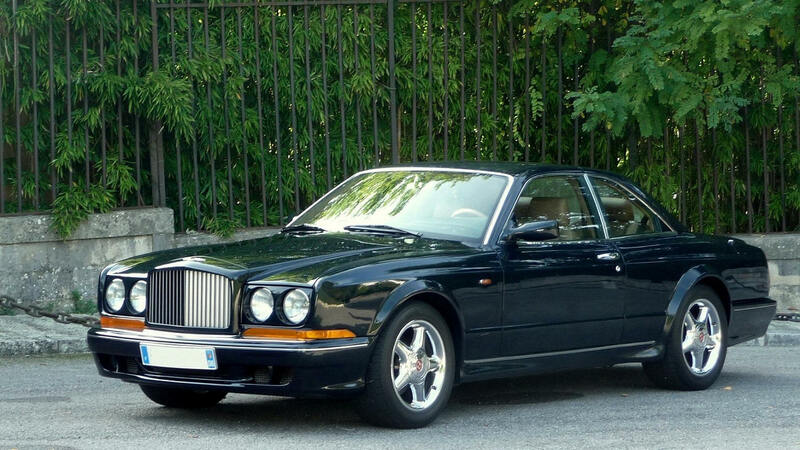 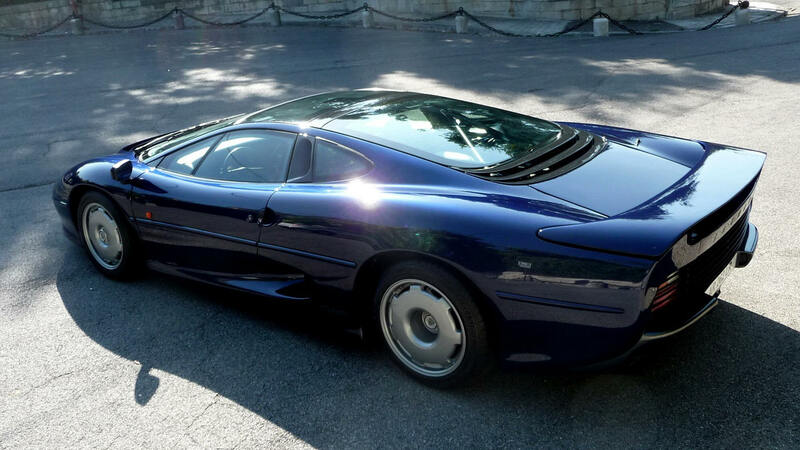 Only 280 units have been built, a number as limited as that of the Porsche 959 or Bugatti EB 110, and much lower than those of the Ferrari F40 and F50, which it surpasses all in performance, beautiful breathtaking, sovereign in its haute couture dress, the JAGUAR XJ 220 is the secret treasure of connoisseurs. 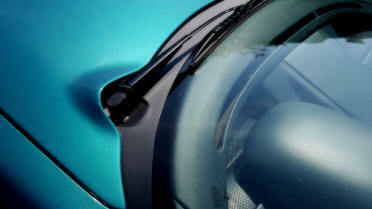 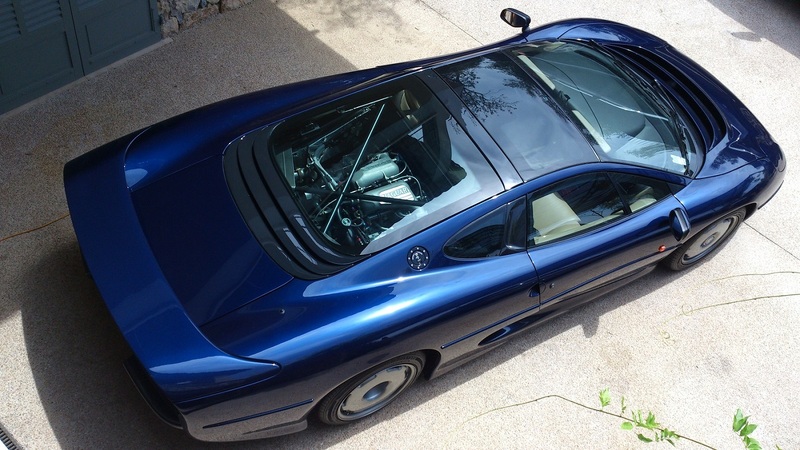 This XJ 220, is finished in its ideal color, Bleu Le Mans, covered only 1000 km. 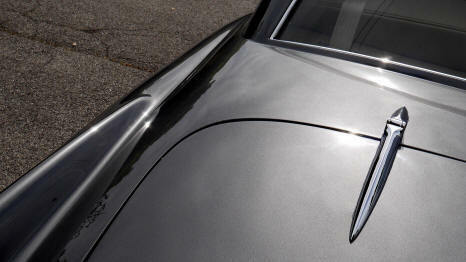 At the top of the legend of Aston Martin, we often quote the DB5, better known, and movie star, but for some, the "real", the reference, is the DB4, perfect design, lighter and shorter, more sport; and they were, in GT version, re-designed by Zagato or overdeveloped like the fabulous DP212, who challenged the Ferrari GTO, the 24 H of Le Mans and all the circuits of the world. She has always dreamed, for decades, a unique and impressive line; inside the cockpit, the feeling is strong and captivating, the small bakelite knob falls perfectly under the hand, the changes of speed, punctuating the revolutions of the six-cylinder mode provide a mechanical satisfaction difficult to describe. 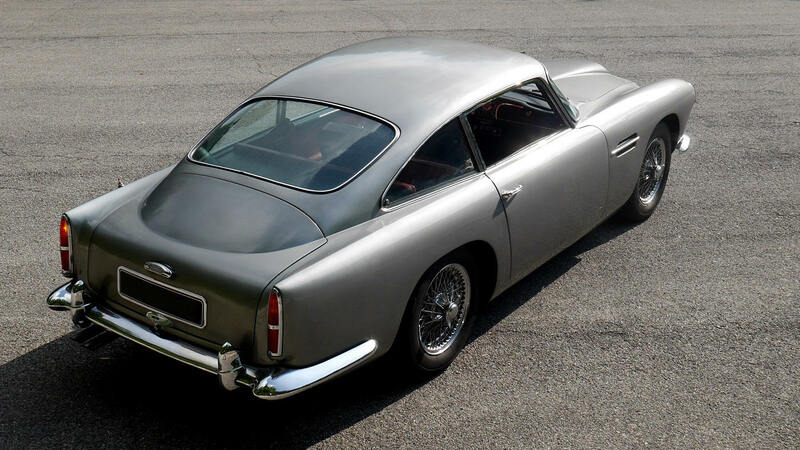 The DB4 Aston Martin are not all identical, this is one of those designated as "Series 2" one of the most sought after, covering 350 copies, of which only about forty in left hand drive. 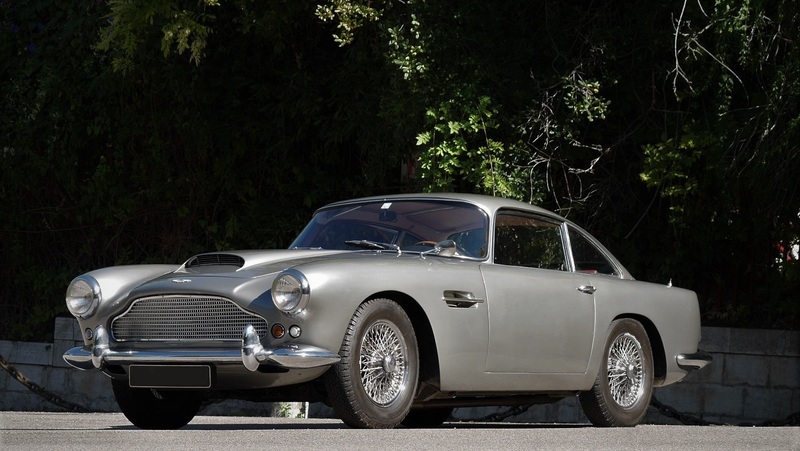 Offered, at a very attractive price, this extraordinary DB4 has an irresistible charm, an exceptionally simple history and an original condition almost impossible to find for such a rare and coveted collector's item. 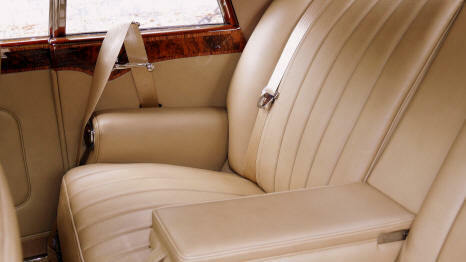 In almost sixty years she knew only two owners. 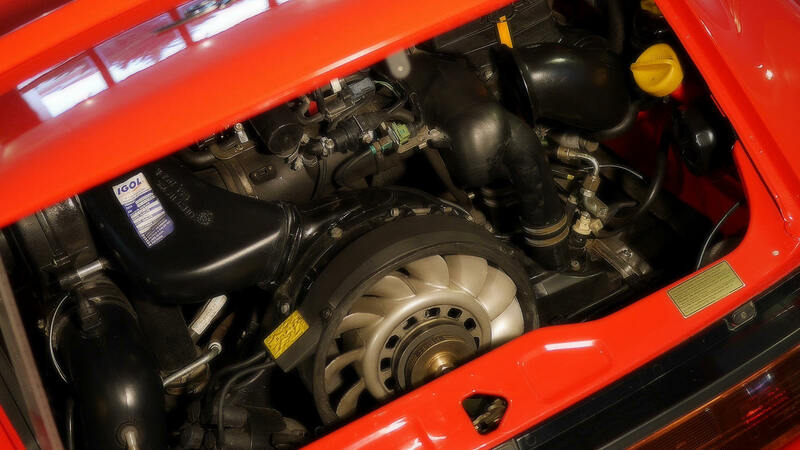 Still misunderstood by the general public, the 512 M is much more than the ultimate development of the mythical Testarossa. 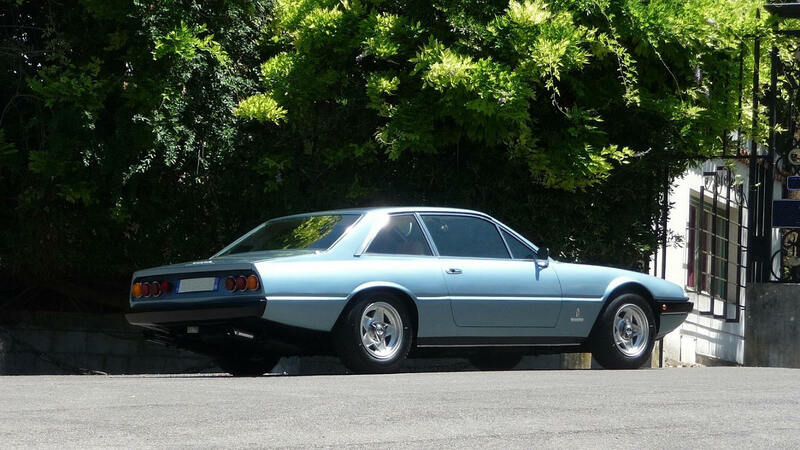 Combining beauty and extreme performance, this is one of the most extraordinary Ferrari Classics, currently still available. 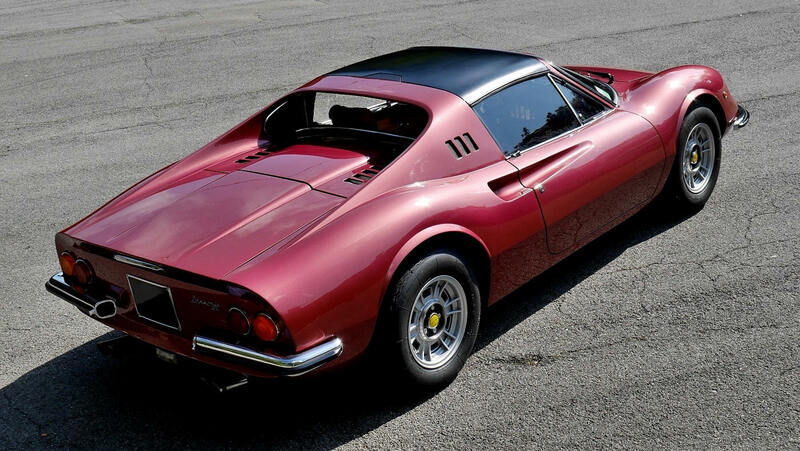 A fluid, low silhouette, a drawing of great art with assertive character with perfect lines and curves; this seems obvious for a Ferrari, but these sports proportions will disappear on the following models, the engine placed at the front, higher and conventional. 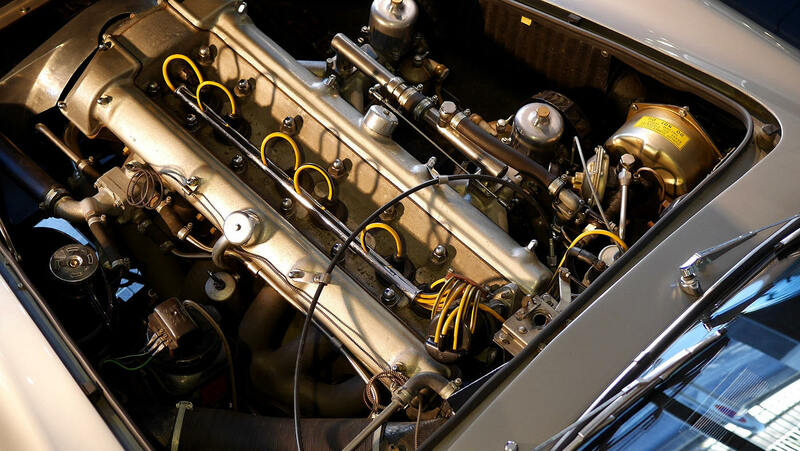 The engine of this magnificent machine, a twelve-cylinder arranged at 180 °, carries the genes of Formula 1 of the time, and its architecture is in line with the glorious BB, which was illustrated at 24H. 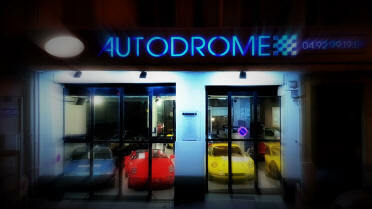 of Le Mans. 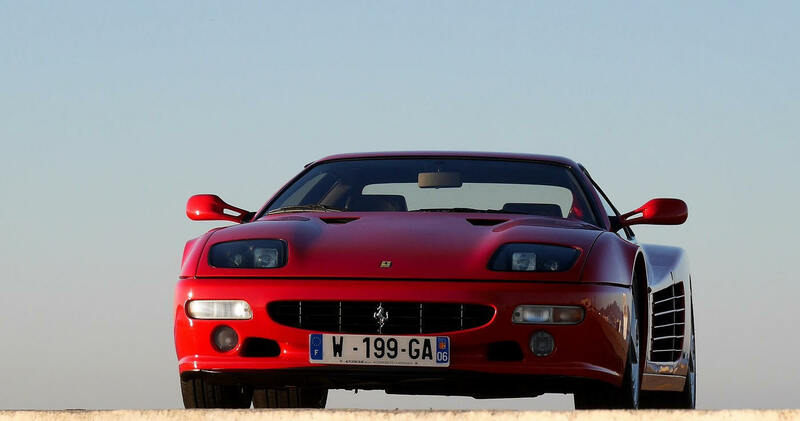 In the 512 M, 440 hp behind the driver, and 315 km / h, to savor on the road, a unique motoring pleasure. 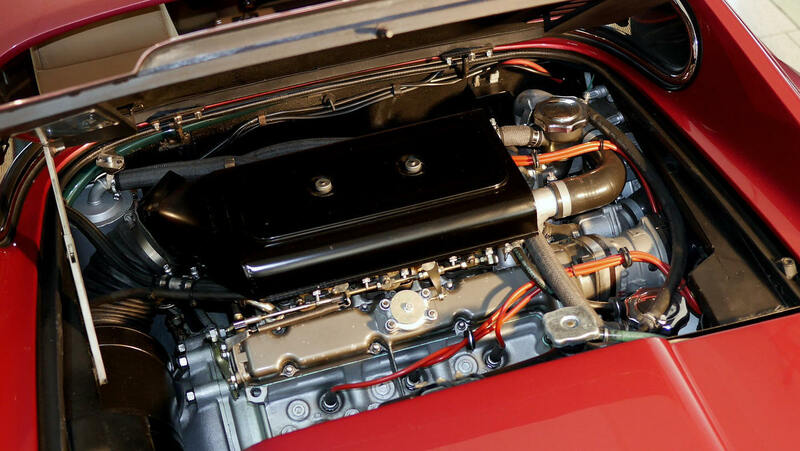 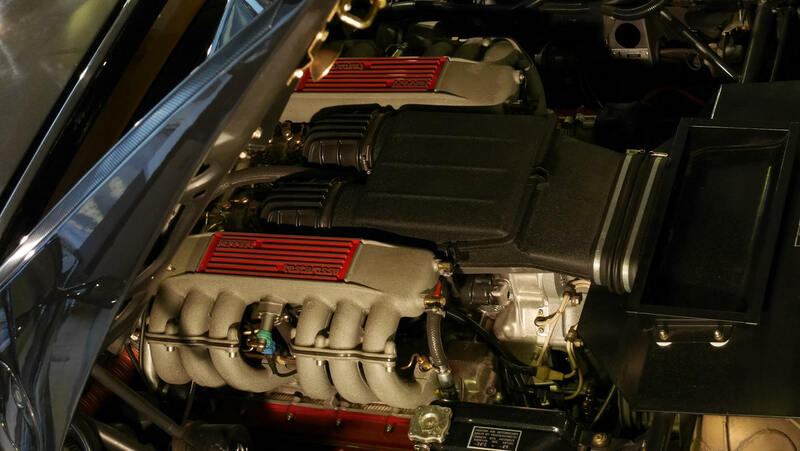 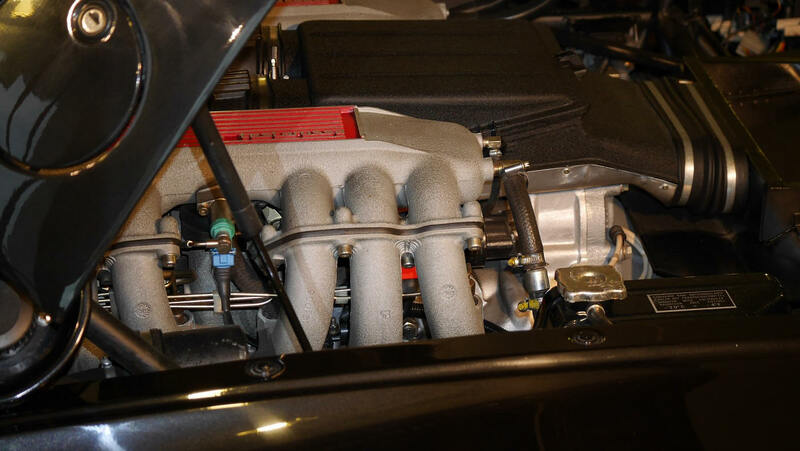 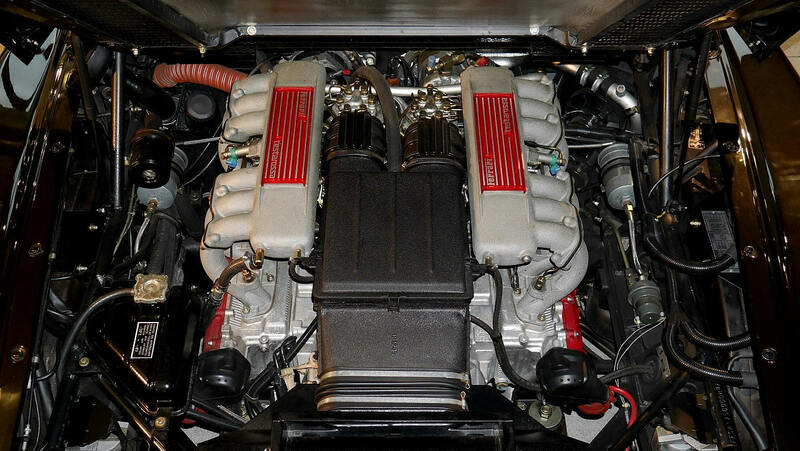 The Testarossa, eternal symbol of so many dreams of youth, is in fact the ultimate twelve-cylinder Ferrari engine designed and produced during Enzo's lifetime; here finally accomplished, it could make you forget all the others. 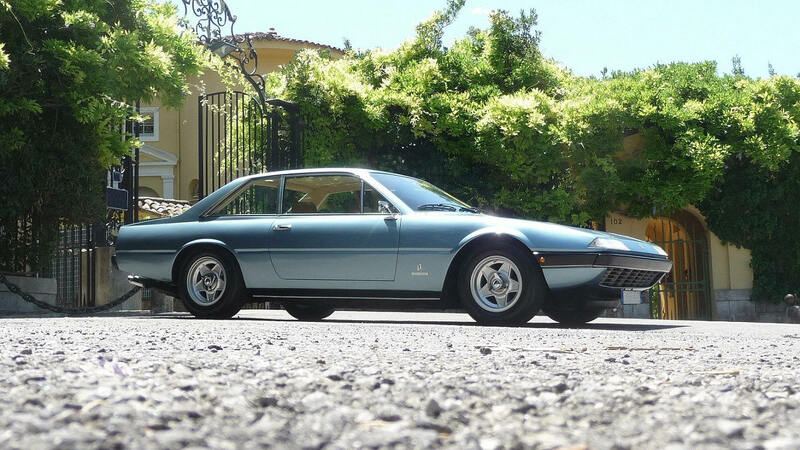 The 512 M, a beauty of Diva, and the bewitching twelve-cylinder Ferrari in an ideal racing prototype architecture, for some, this is the last of the real ones; an obvious choice. 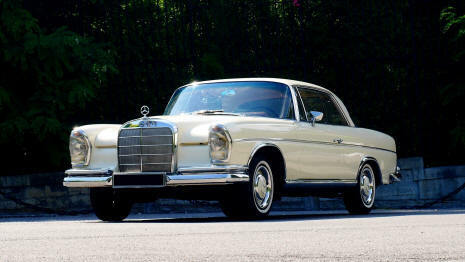 The Grand Coupé Mercedes are emblematic of the automobile excellence of the sixties, characteristics of this golden age, they were at the same time sign of good taste and fortune. 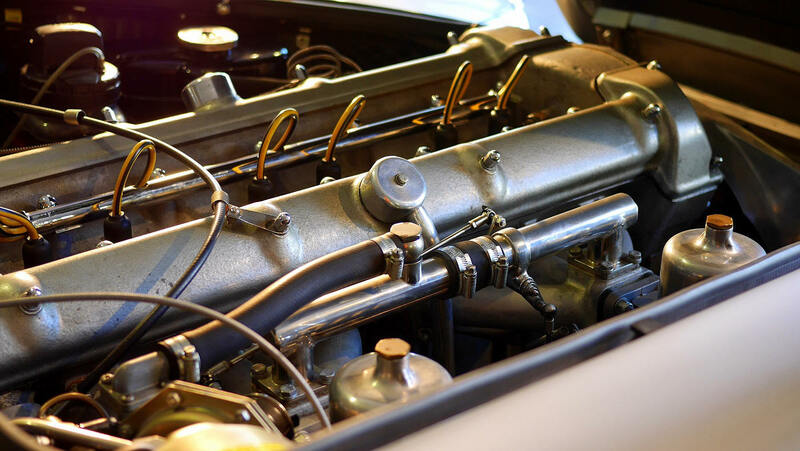 The elegance of their lines crosses decades as a perfection, the quality of manufacture and the refinement of their six-cylinder in-line mechanics, suffer no criticism. Few classic cars can convey this scent of the past with as much authenticity. 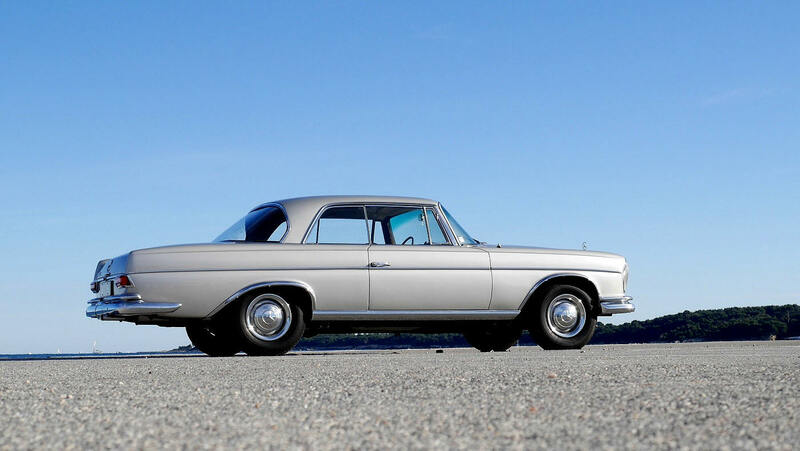 Different versions of these wonderful cars of extraordinary beauty were on offer, but the 300 SE Coupé, at the height of the automotive sophistication of its time, is in a class of its own and incomparable. Its air suspension, which it shares with the fabulous 600, its engine close to that of the 300 SL "Gullwing", its great rarity and luxurious finish place it well above other versions. 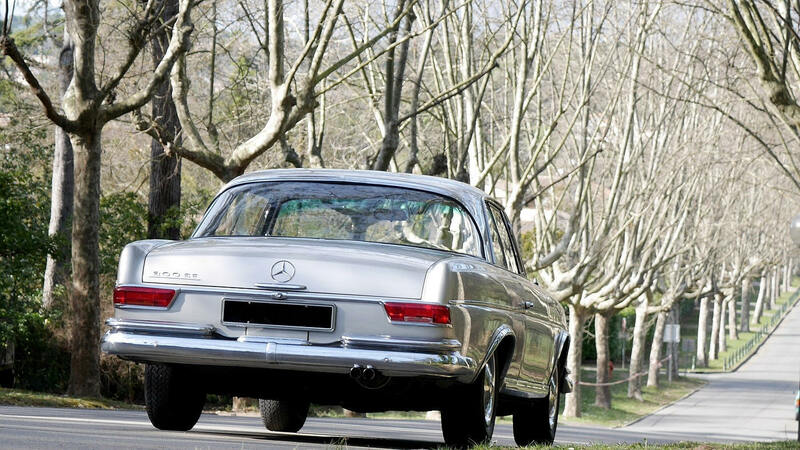 This beautiful car we propose, is in the hands of the same owner, on the Côte d'Azur, for more than thirty years, it has always been used regularly, perfectly maintained and almost completely restored over the years, engine, gearbox , suspension, bodywork, interior. 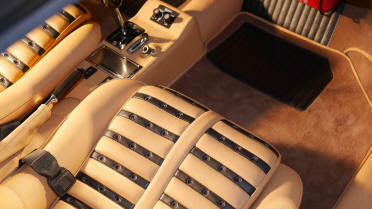 She is equipped with an automatic transmission and air conditioning. 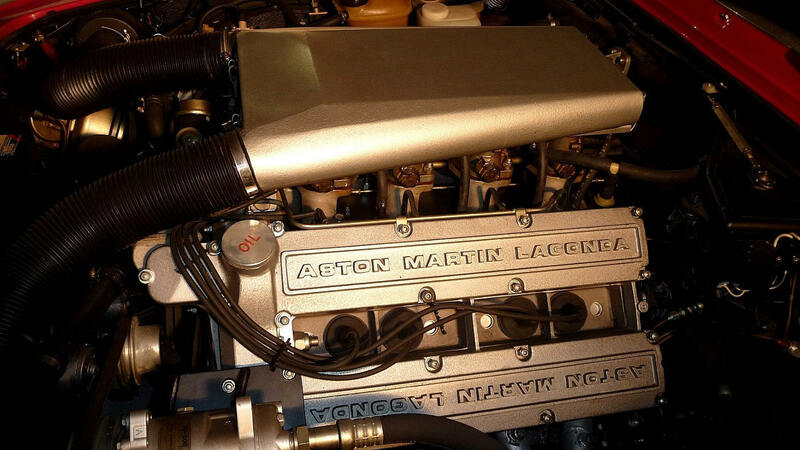 Such an automobile is not for everyone. 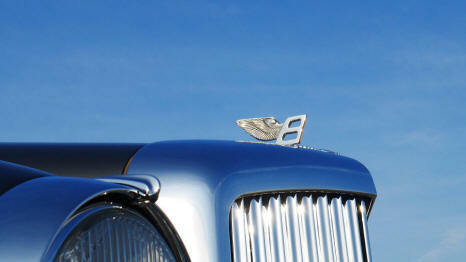 A BENTLEY Continental is a jewel for initiates, a territory apart, where meet those who dream of absolute. 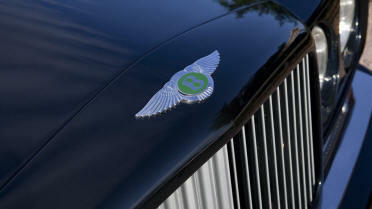 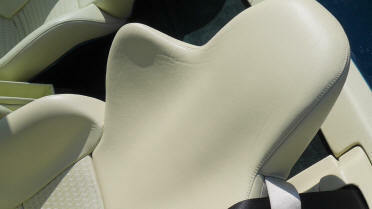 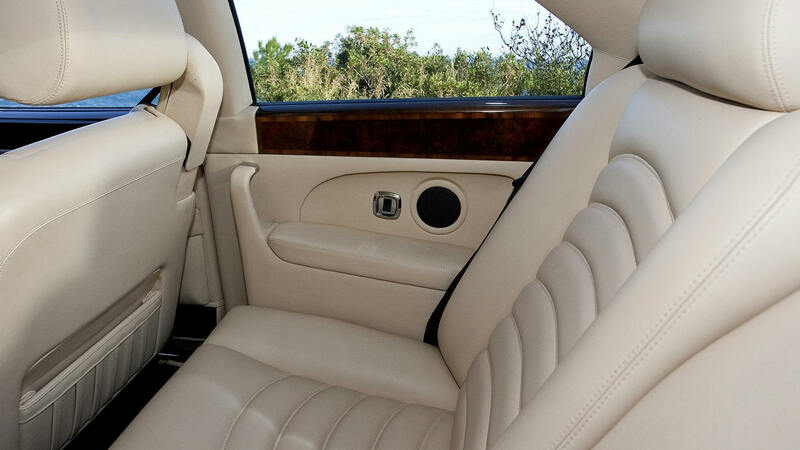 Materializing the timeless spirit of Bentley, it is comparable to no other. His presence is physically impressive, extraordinarily handmade, we can only feel admiration for the majesty and serene power that emanate from it. It's more than a machine. 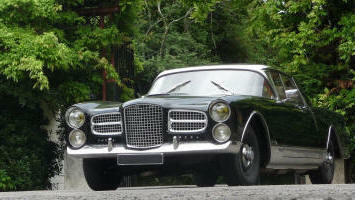 This splendor is a Continental Coupé S1, about thirty copies only in left hand drive would have been signed by Park Ward. In the tradition of automotive haute couture, it is a rolling assembly, delivered by the factory, which was dressed by the bodybuilder. Forms and proportions defy time, it is an automobile sculpture shaped of aluminum, animated by the marvelous six cylinders engine, fited for its last time, it will take its passengers up to almost 200 km / h in a muffled silence ,. 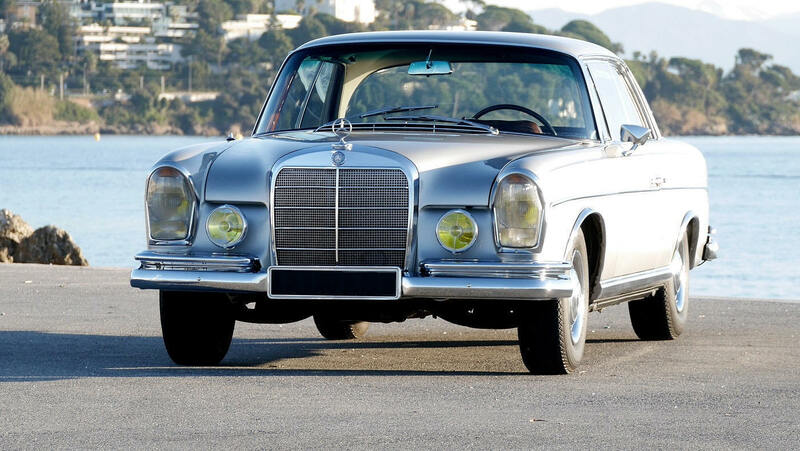 Delivered new to its first owner in Paris, in 1957, it was recently fully restored, and at a dream level, in its original colors, by one of the most famous brand specialist workshops. 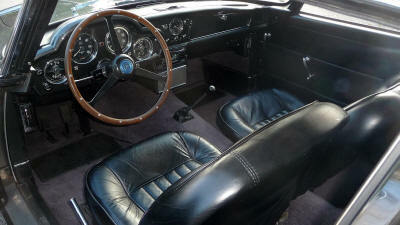 It was a meticulous job of several years, aiming for perfection, for a very high investment. 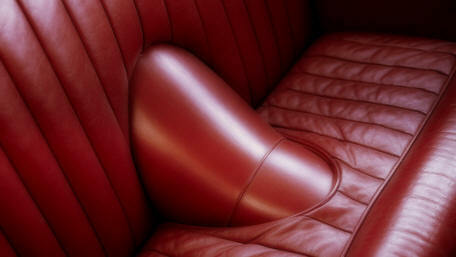 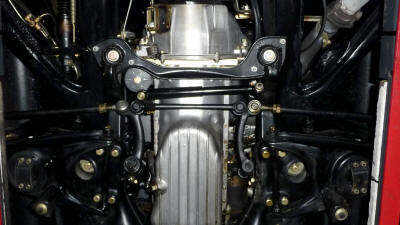 One of the most sumptuous automobiles of the twentieth century; an aesthetic and mechanical revelation. 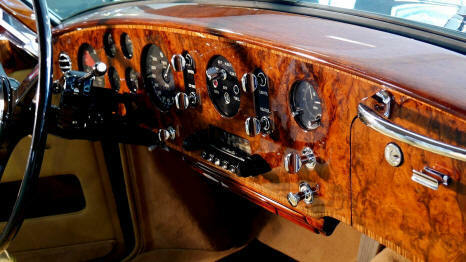 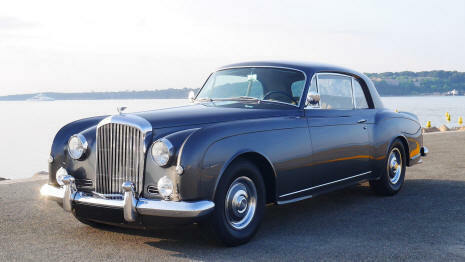 Classic Bentley Continental Coupe is The Queen in elegance, they are treasures. This model is one of the most admirable, succeeding the legendary Continental R Fastback, it is rare in left hand drive, it will be the choice of an esthete and connoisseur. The condition of this wonderful specimen, finished in its original shades, in Tudor Gray, and beige leather Connolly, is irreproachable. 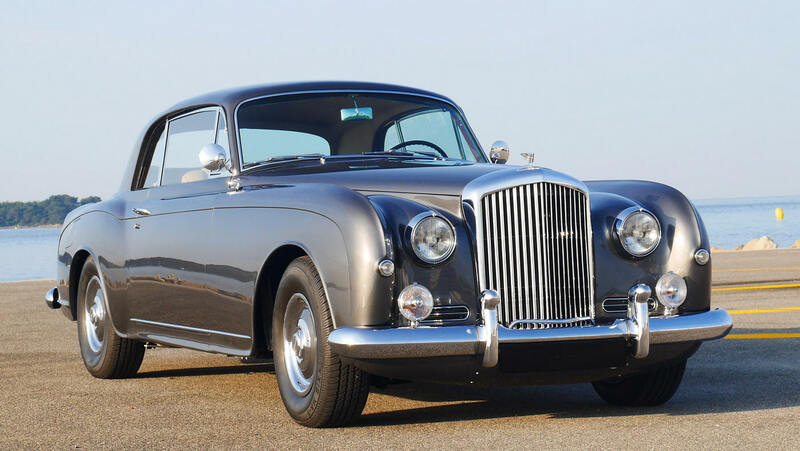 One of the most beautiful classic Bentley, to keep forever, unsurpassable. 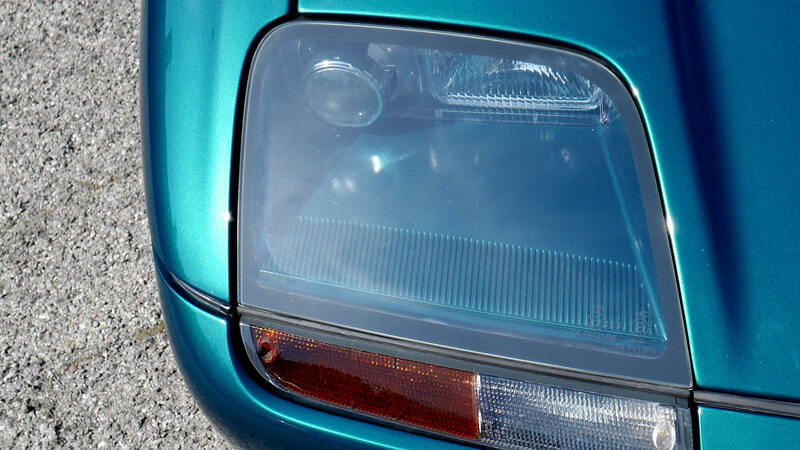 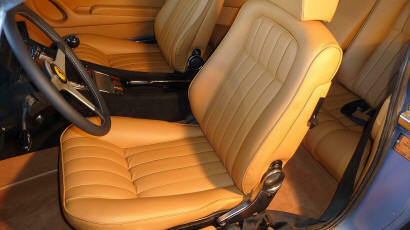 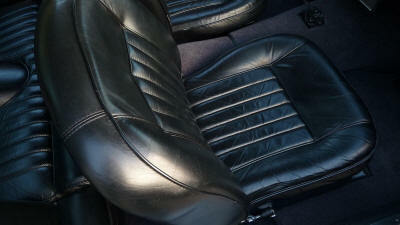 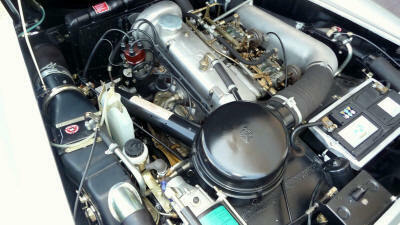 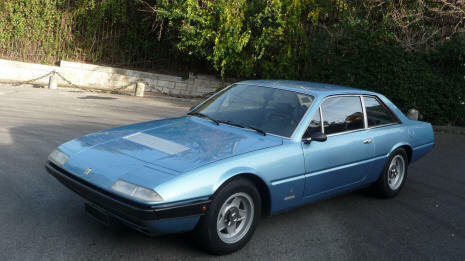 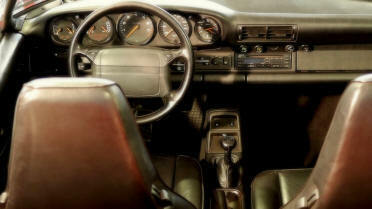 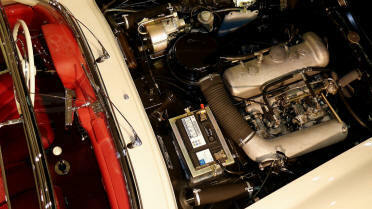 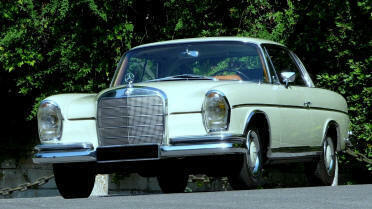 Classic cars with a very low original mileage, are extremely rare, they are in a class apart. Their absolute authenticity, dreamed by all collectors, ensure the greatest value. 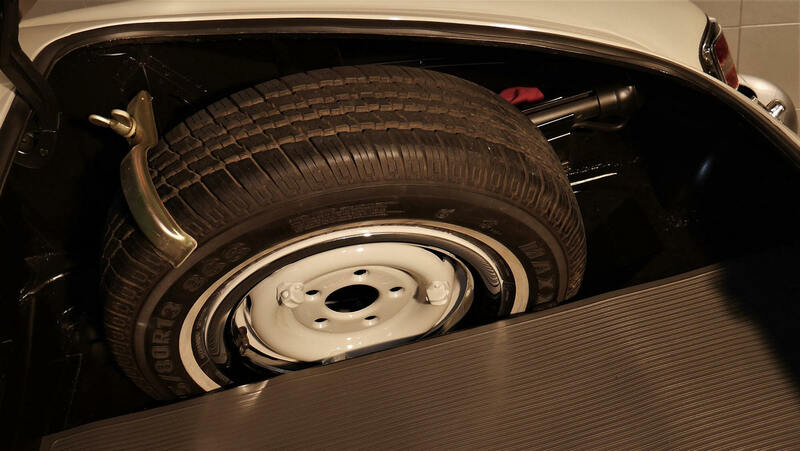 Preserved and intact, these exceptional automobiles stand out as References. 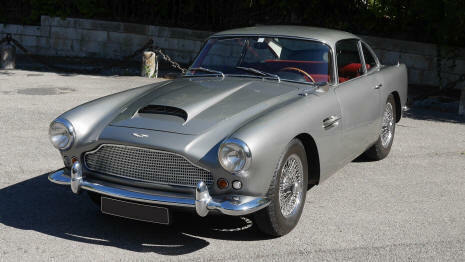 Unquestionably, each time such an ideal collector's item is offered at auction, it sets a new record. 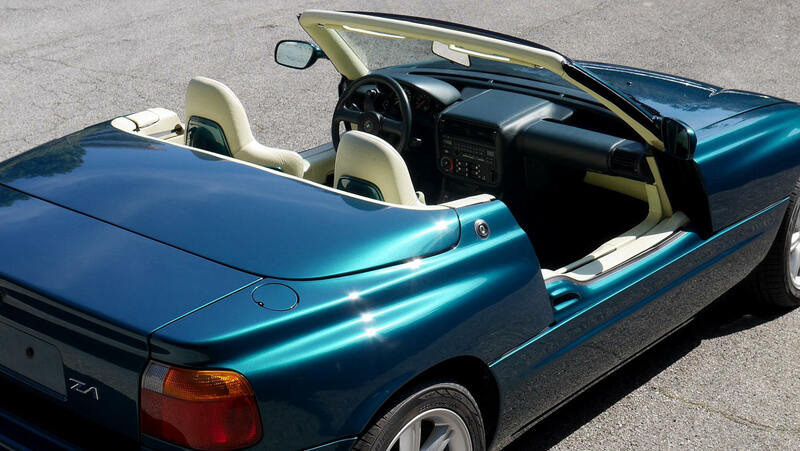 Time has no hold on its beauty, the purity of its design appears even more striking, the Z1, a true experimental car homologated, is also the most beautiful BMW. 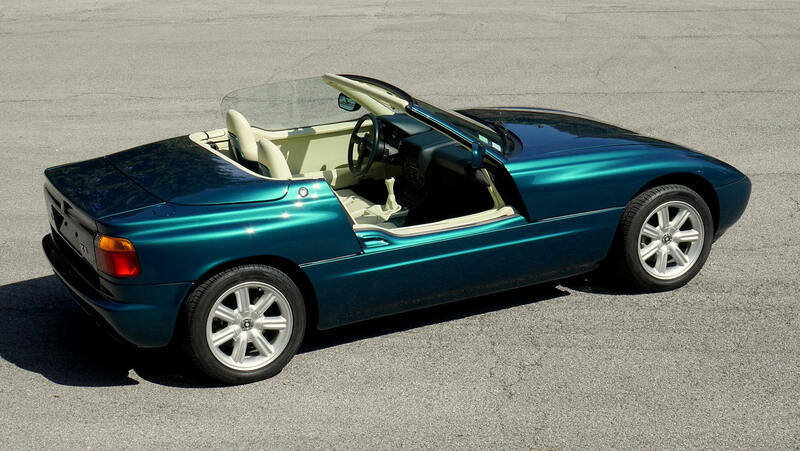 This extraordinary roadster, concept car presented in 1987 and delivered in limited series, is really a special car, it is not comparable to any other. 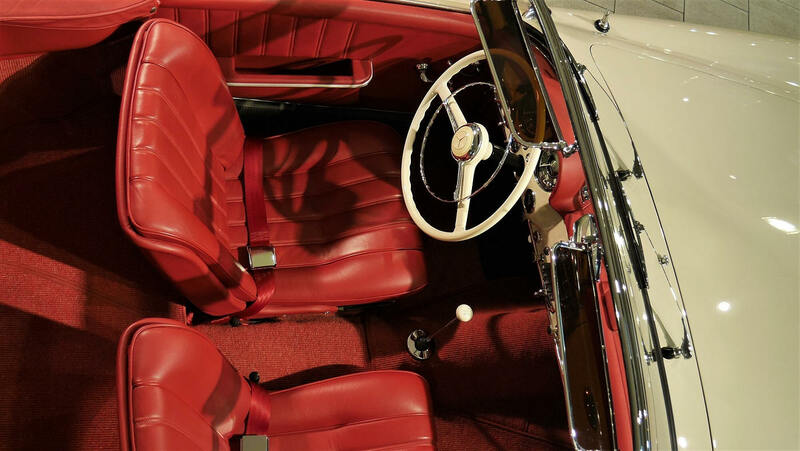 A freedom of design, never seen, left to the engineers has resulted in a real toy car, with a mastery of technology far ahead of its time; and the stylists have outdone themselves with rare inspiration and accuracy. The amazing doors are electrically retracted into the side. 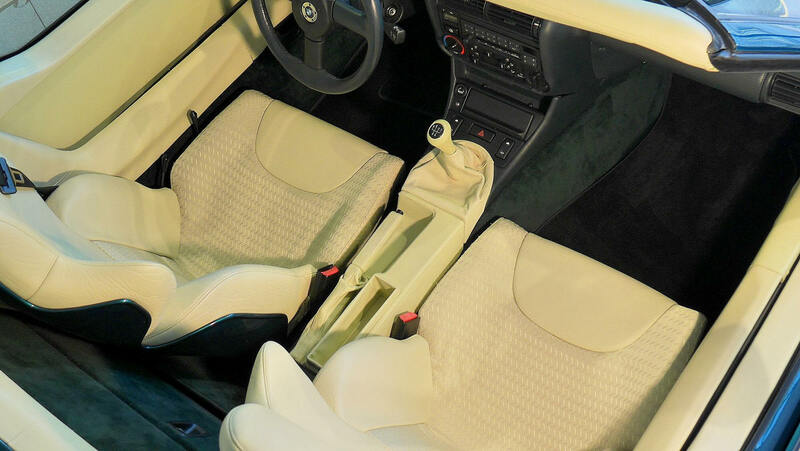 This unique feature in history, allows driving "open doors" and gives the Z1 an irresistible charm, and this is just one of the many innovations developed on this car. 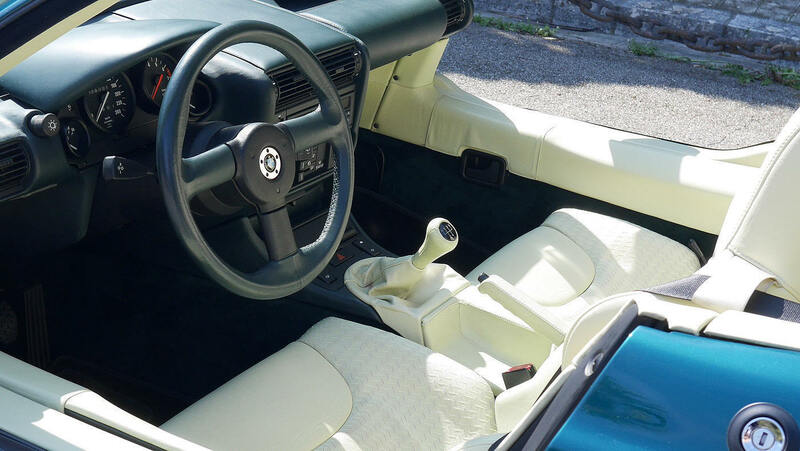 The design of the chassis is avant-garde, and every technical choice or detail design holds the attention and seems natural, excluding unnecessary eccentricities and stylistic overloads. 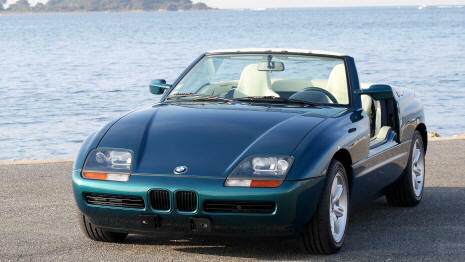 The build quality of the Z1 and its durability over time are exemplary, the six-cylinder in-line engine is creamy and perfect; the Z1 is a no-fault and simply one of the most extraordinary creations of BMW. 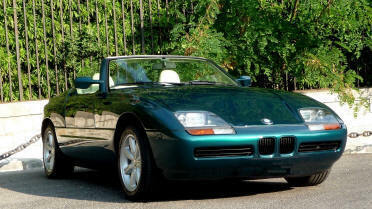 This magnificent Z1 comes in the most desirable color scheme, which fits best in the out-of-the-ordinary spirit of the project, a rich and deep metallic green for the bodywork, on a leather interior and straw-yellow fabric (only 967 have been delivered in this scheme), its condition is exceptional. 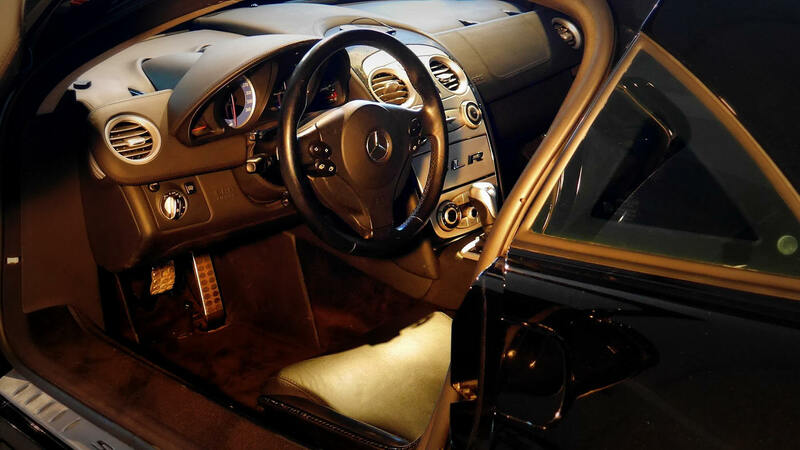 At the wheel, you feel the singular feeling of driving a new car. 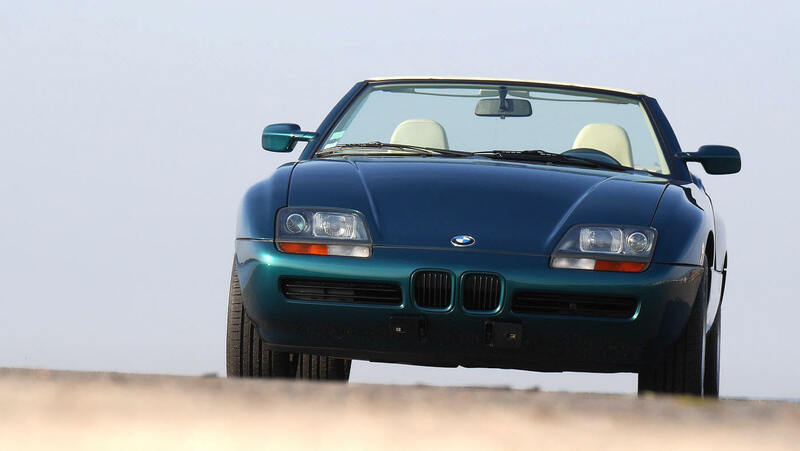 Looking after thirty years, the Z1 proved to be one of the brand's masterpieces (with the M1 and 507), and it still surprises the most connoisseurs. 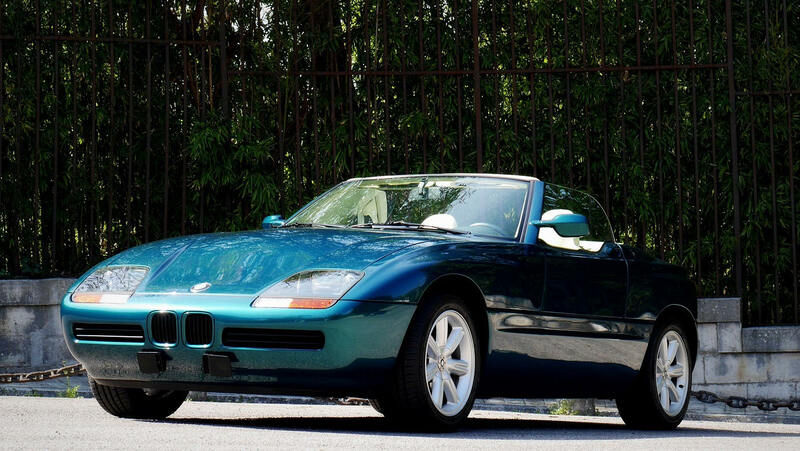 Because this collector's BMW is truly unique: intrinsically modern, driven by its ever-exciting 6-cylinder engine, it combines the unprecedented technicality and stylistic choices of an experimental car, with the ease of use of a today's model car. 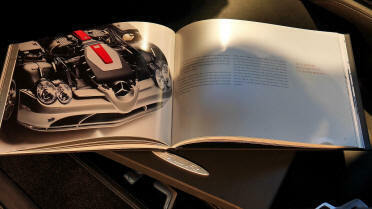 Naturally it is more and more coveted and as always, making the right choice is decisive; faithful to our habit, we have selected one of the finest copies available. Our Z1, incredibly preserved, in this most sought after color scheme is the best choice to invest in the model. 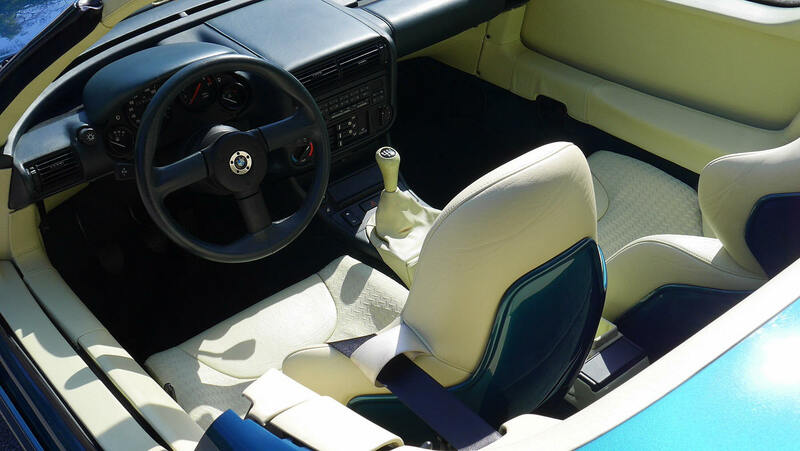 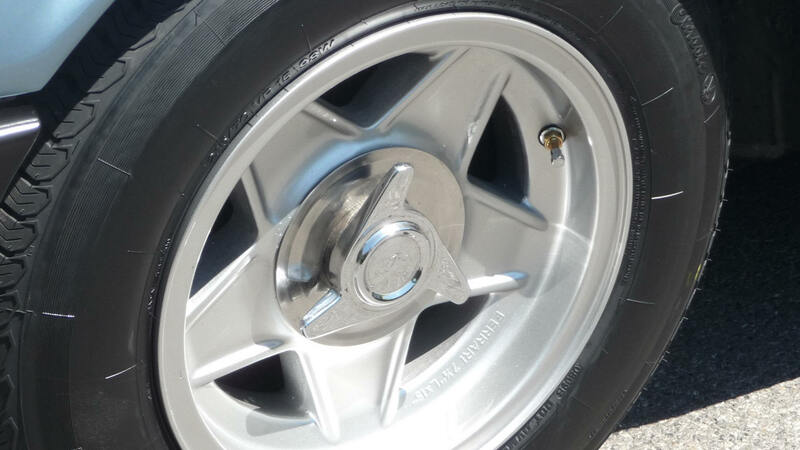 A collector's item that we will not tire of and that asserts itself as a major classic BMW. 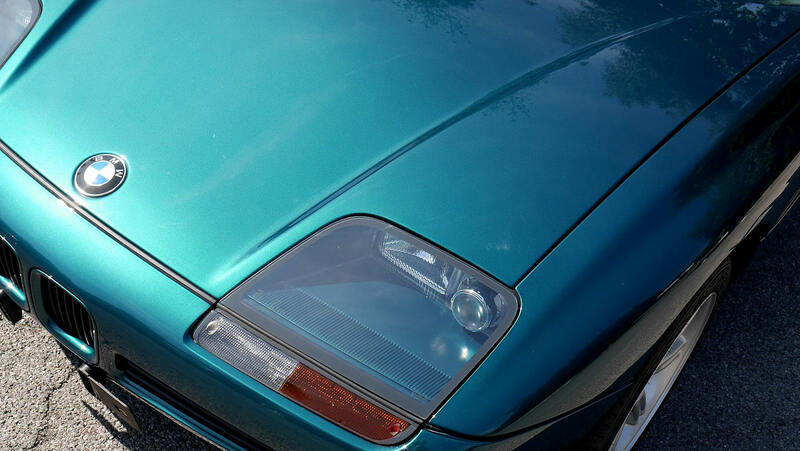 1991 - 18 000 km. 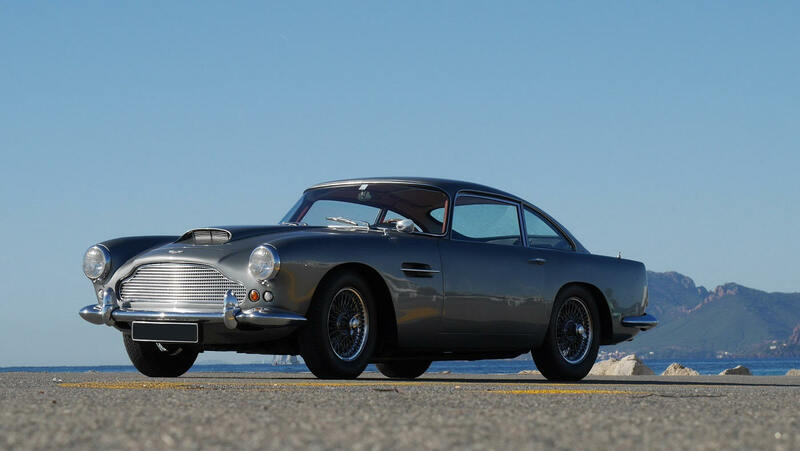 In the 1960s, after the glorious double of Le Mans 1959, accompanied by a title of World Champion, Aston Martin became the British equal of Ferrari in the field of Grand Touring, with however an additional component, a romantic aura; This unique character would make this mark a legend. 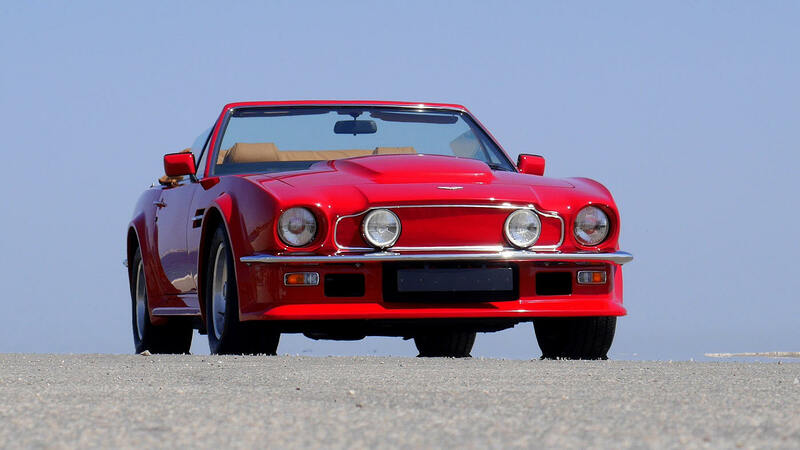 The V8 Vantage "X Pack Volante" is the highlight, a mythical automobile; It is rightly considered as the ultimate Aston Martin Classic. 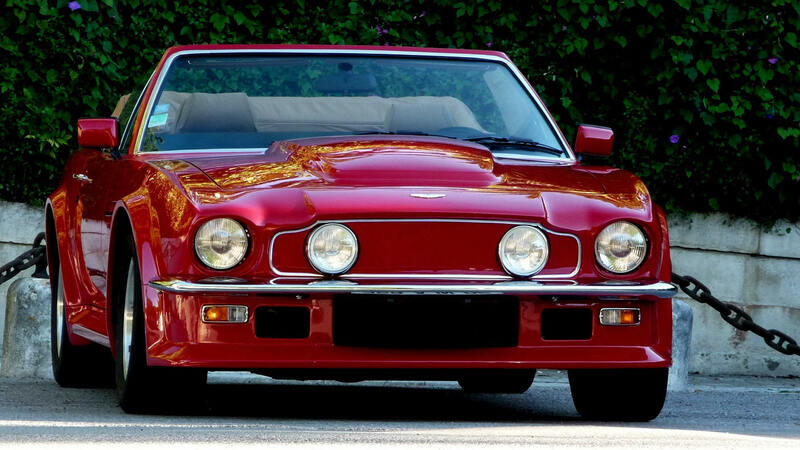 The Vantage X Pack, very different from all the other Aston Martin V8, enjoying the famous V 580 X engine over 420 hp. Is already rare as a coupe version, when to the convertible, called Volante, it is almost impossible to find; The emblematic version with a mechanical gearbox was built in only sixteen left-hand drive models [out of a total of 27]. 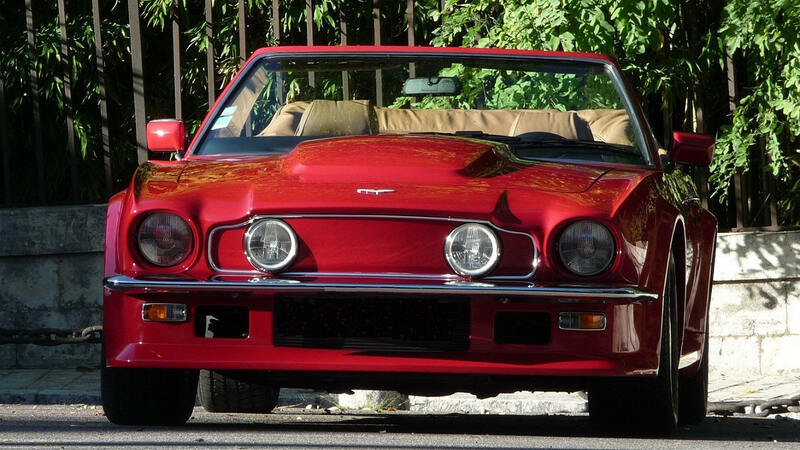 These sixteen automotive wonders are jealously preserved and virtually never offered for sale. 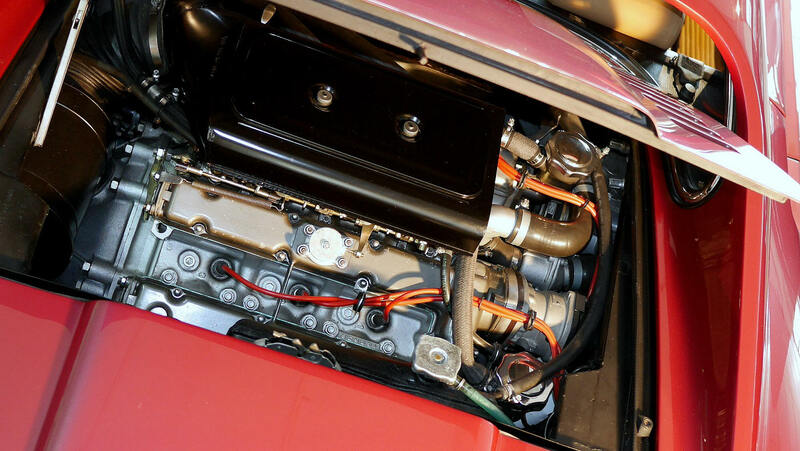 Few have been lucky enough to see it, their conduct is the privilege of a tiny minority; An inaccessible jewel. This copy is a miracle, with only 1570 km, and incredibly preserved, it is in an unsurpassable condition. 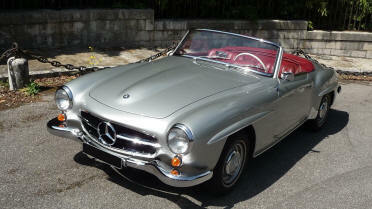 Here, no restoration, the car is still like new, it has been preserved as a treasure. 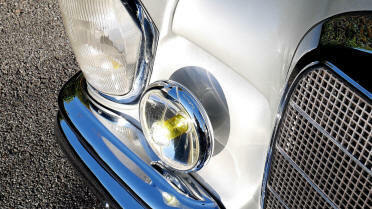 A witness of a world that was believed to be gone has miraculously withstood time. 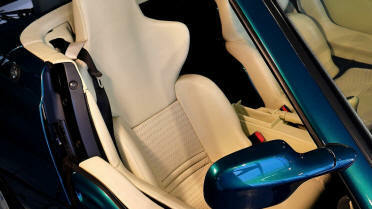 The visual and sensual impact is striking, solar. 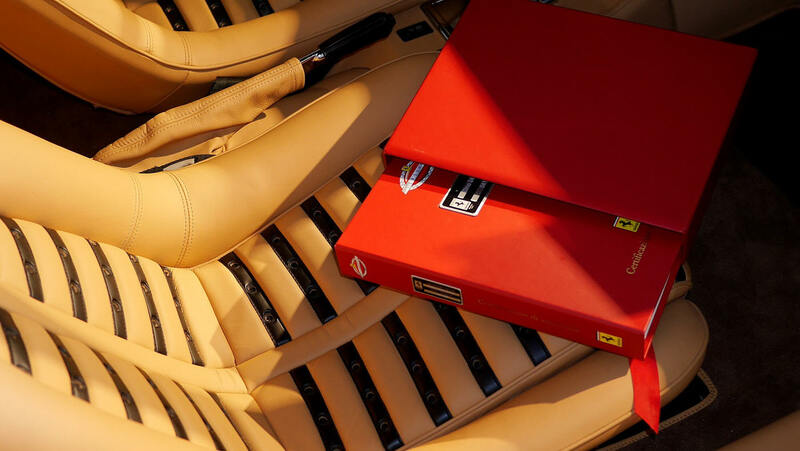 It imposes an incredible presence, a paradox that combines brutal power and sublime refinement, still exacerbated on this copy by a lacquer of colors Suffolk Red provocative. In the midst of simple cars, this jewel, meticulously built to unity seems to radiate power, and magnetizes the gaze of all around. 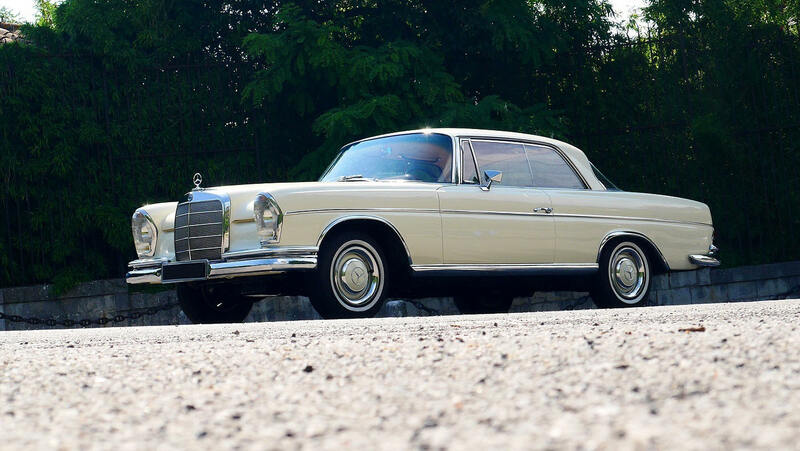 Having traveled less than 1600 km, and presenting today an incredible state of still originally new, this copy is undoubtedly the most beautiful existing in the world. 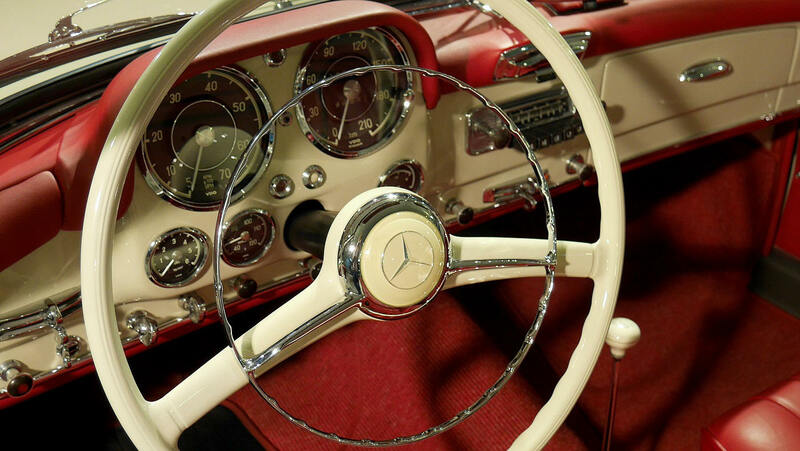 It is known that the preservation of the original state intact surpasses the most expensive restorations, it is about anything else, incomparable, priceless, the condition dreamed by the most demanding collectors, which can not be reproduced, whatever the price is. 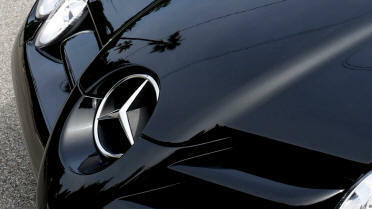 There is nothing beyond that. 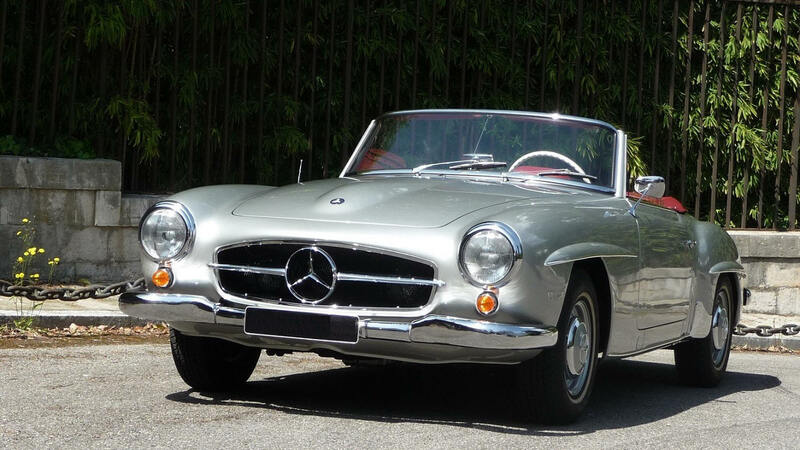 The MERCEDES 190 SL is beautiful, it has an eternal charm, a familiar presence and more, Classic reference, it is present in all major collections. 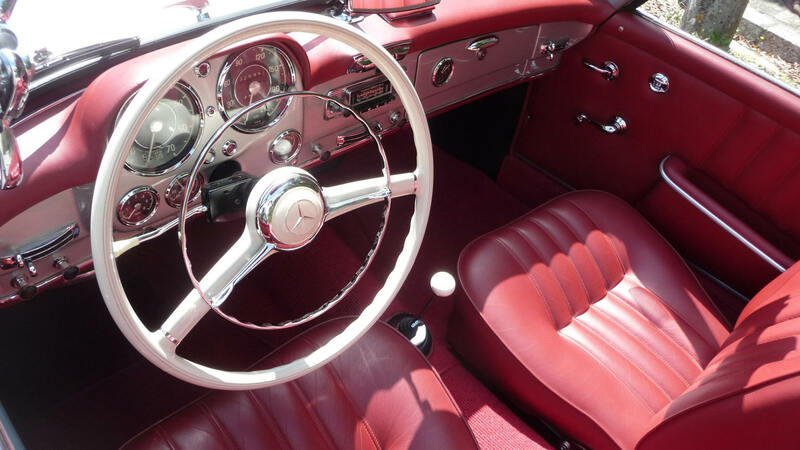 Inspired and contemporary of the legendary 300 SL, it imposes its own beauty with different arguments, it is a major classic automobile. 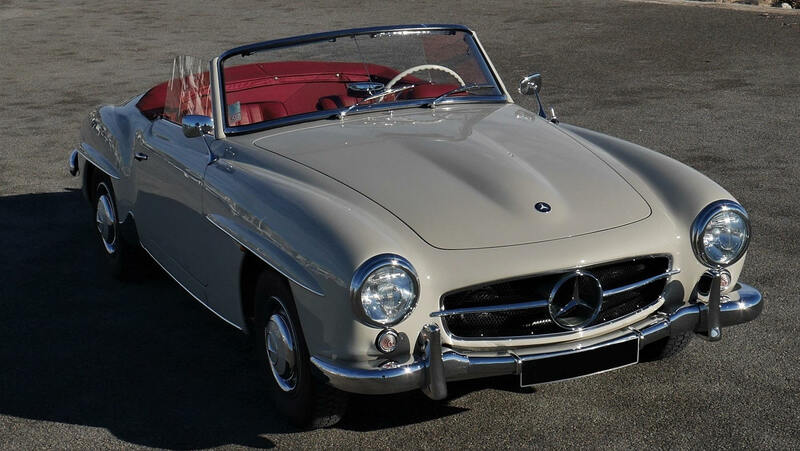 The one we offer is exceptional, one of the first built, in 1955, which gives it a special value, it was the subject a total restoration of very high quality. 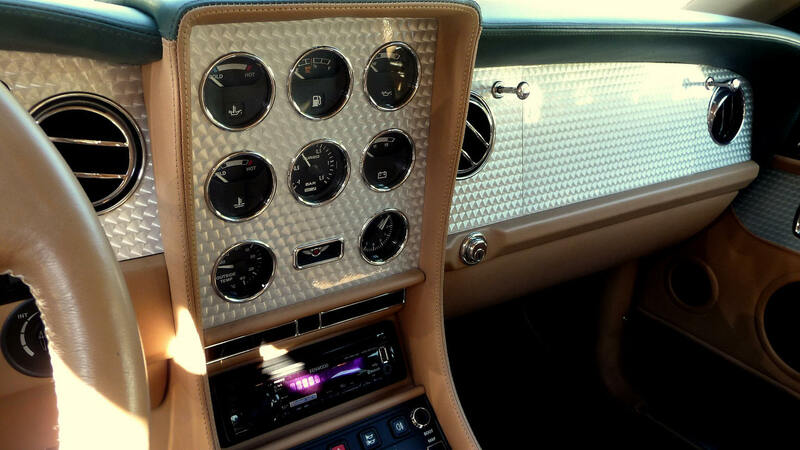 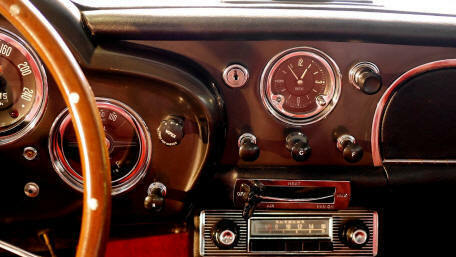 The dashboard is a work of art, drawn, carved and evocative, the incomparable charm of historic sports cars is under our eyes, a pleasure to contemplate. 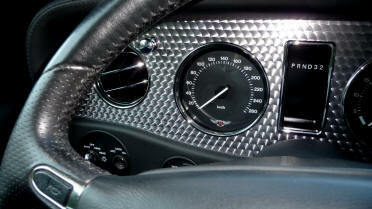 The beautiful chrome metal circle serves as an alarm and its rotation activates the turn signals. We can note the wraparound seats, similar to those of the 300 SL, or the splendid transparent sunshades smoked, two specificities peculiar to the first models. 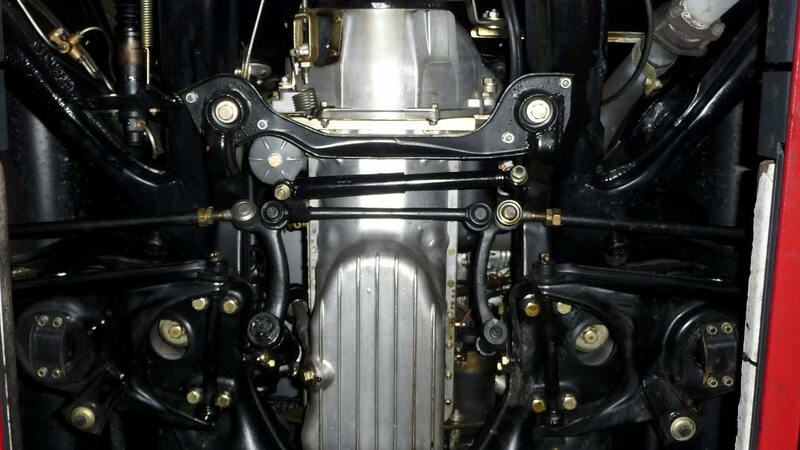 Beyond what we can see, a quality restoration must include a flawless operation; we checked it, its behavior is exciting, a treat. 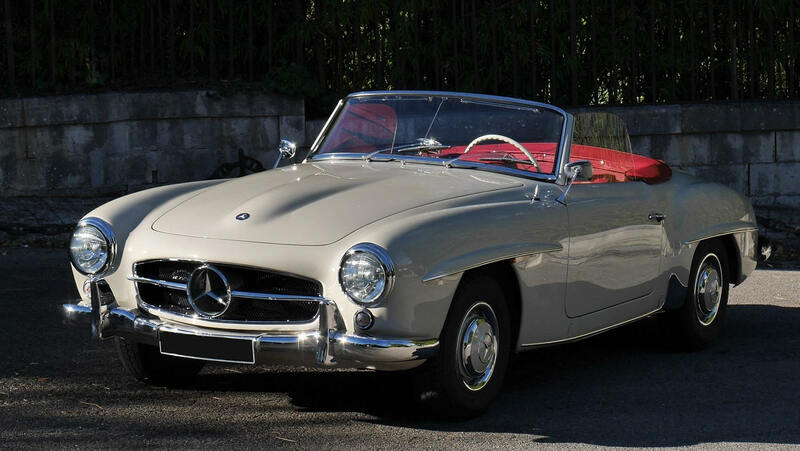 This Mercedes 190 SL of the first year of production, is one of the most beautiful that can be acquired, the choice of the copy is always the most important. 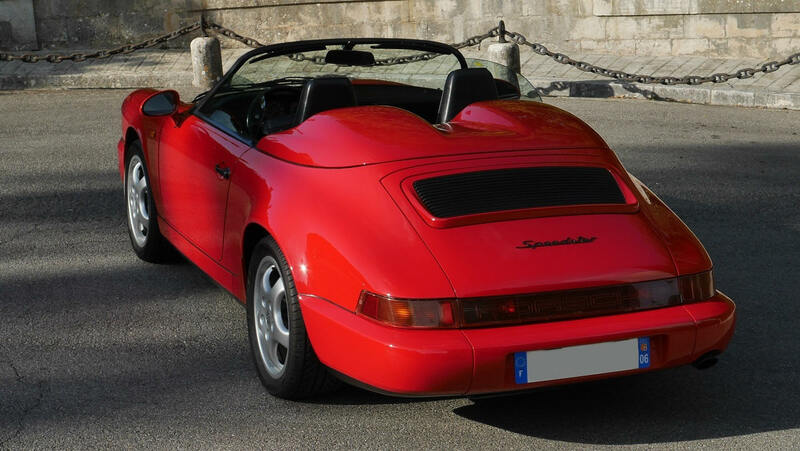 The Speedster is a symbol of Porsche's pure sport, which has been available since 1954 in three all-mythic series, 356 / 3.2 L. / and 964. 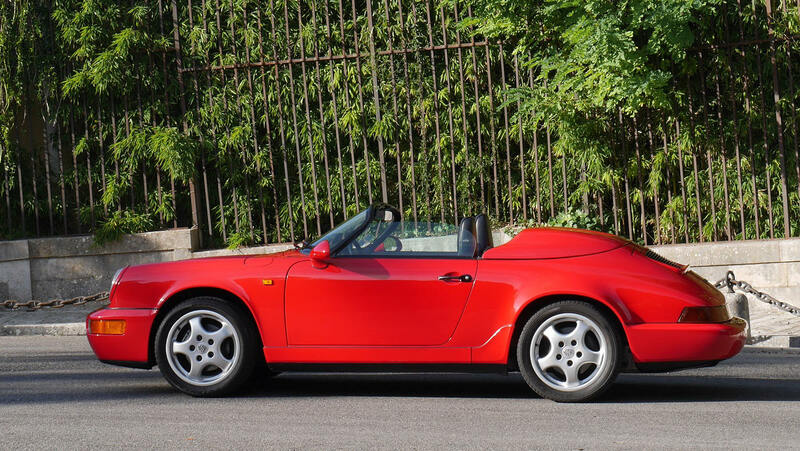 The latter, the Carrera 2 Speedster, is a complete success, the ideal outcome of the lineage, a perfect design, it is also very rare, only 936 specimens have been built, of which less than half in European configuration. 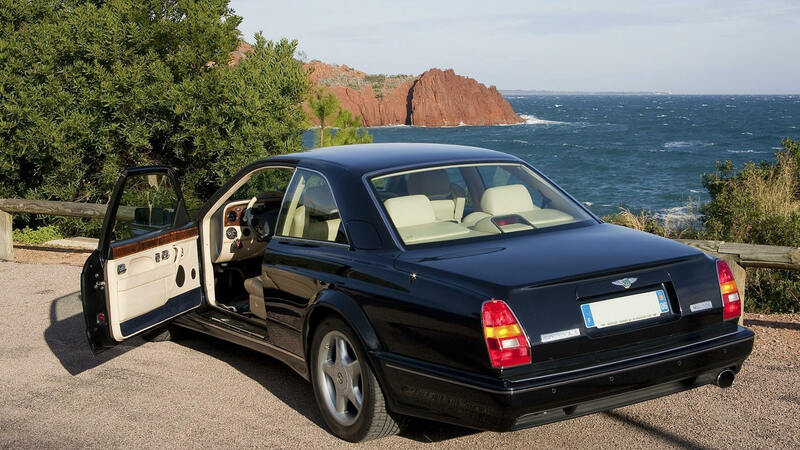 This very beautiful model was delivered new in France, with options electric seats and silver metallic painted rims , preserved in excellent condition, and with perfect behavior, its odometer displays only 58,500 km. 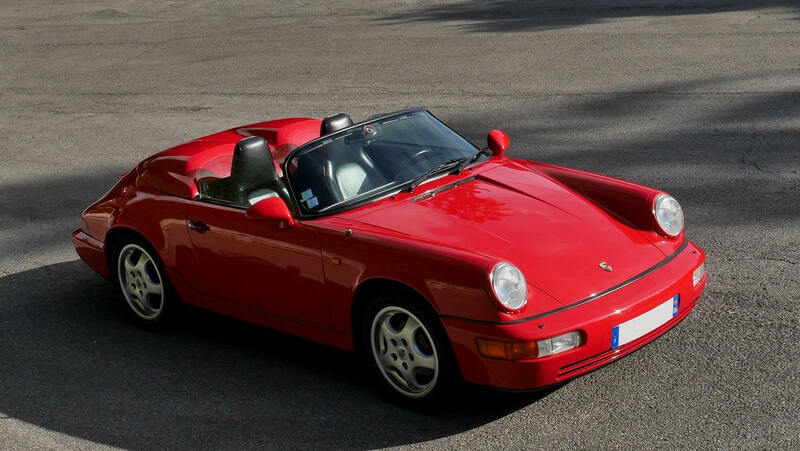 This Carrera 2 Speedster is an ideal choice for Porsche collection, an iconic and rare automobile offering, in addition, a pleasure without reserve and in all circumstances at its wheel. 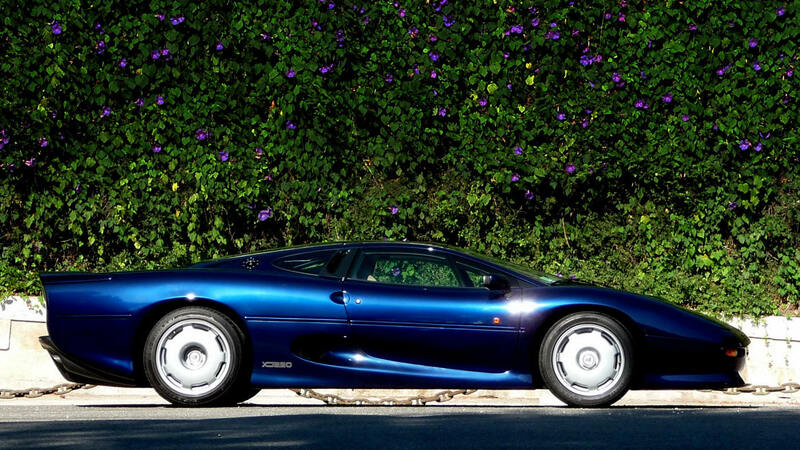 The purity of its design is a perfection and our eye is captured by its fascinating beauty, because the JAGUAR XJ 220 is not a simple automobile but an authentic work of art. 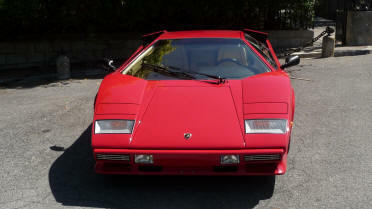 At the end of the eighties, before the weight of world standards were imposed on the manufacturers, and while maximum profitability and the conquest of market shares did not make the law, some of the more extraordinary automobiles ever created, in a surge of power of speed and creative inspiration liberated. 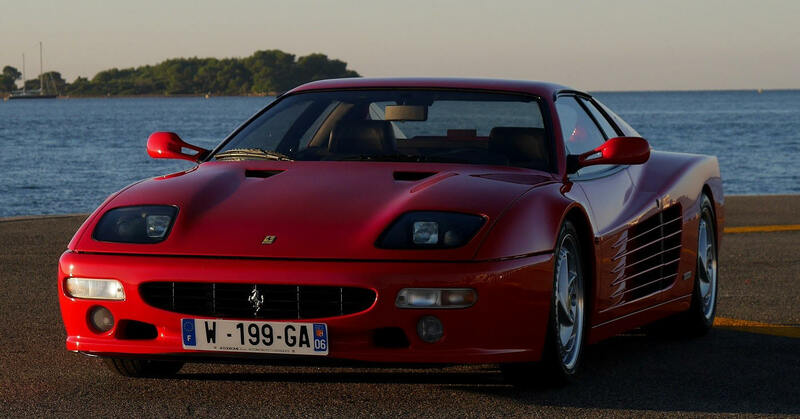 Each can be considered as a masterpiece; they are named Ferrari F40, 288 GTO, Porsche 959, Bugatti EB 110, McLaren F1 and Jaguar XJ 220. 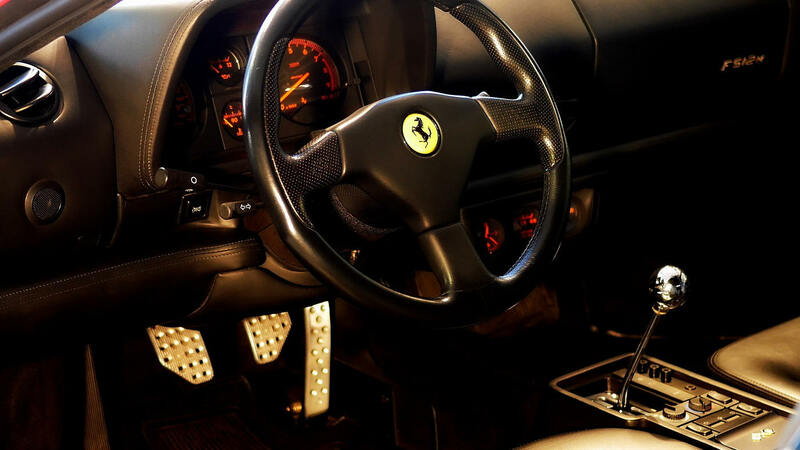 These mechanical sculptures with racing car performances remain in history as the first authentic "supercars". The refinement of its manufacture is incomparable, its body is made of aluminum, Jaguar choosing the nobility of the metal formed, instead of the composite materials, molded in series. 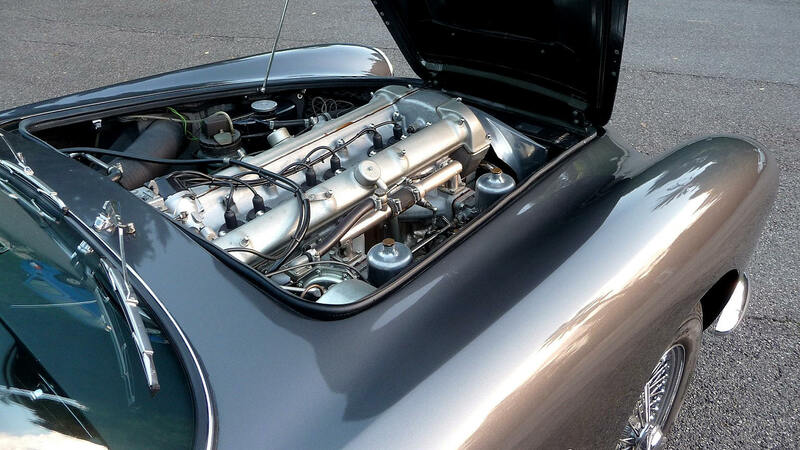 The Jaguar X J 220 integrates the technologies of racing cars of its time in the spirit of grand tourism, pressure on the accelerator transforms this beauty into a missile. 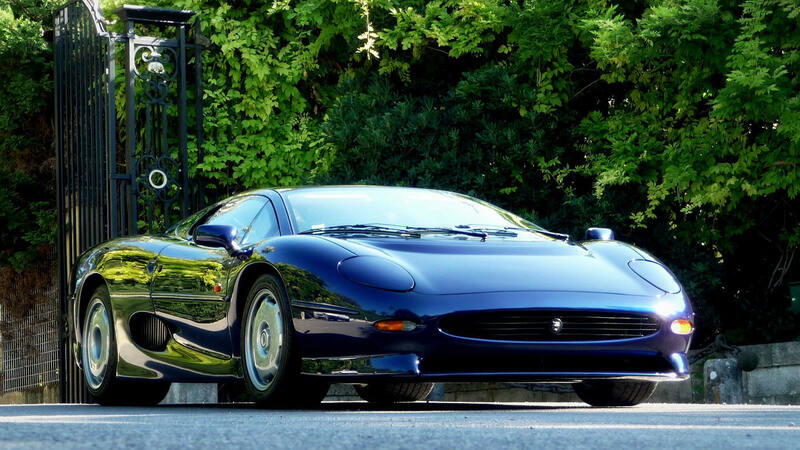 Only 280 units have been built, a number as limited as that of the Porsche 959 and much lower than those of the Ferrari F40 and F50, which it surpasses all in performance, beautiful breathtaking, sovereign in its haute couture dress, the JAGUAR XJ 220 is the secret treasure of connoisseurs. 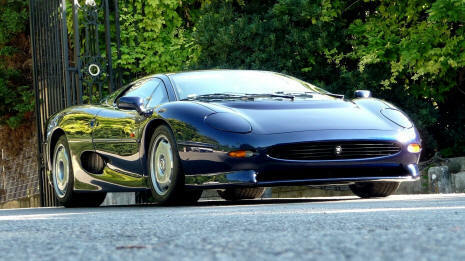 This XJ 220, is finished in its ideal color, Bleu Le Mans, covered only 1000 km. 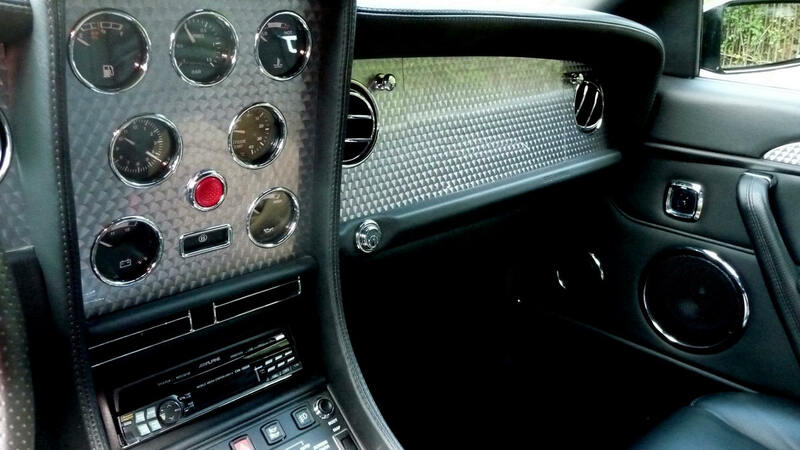 The phenomenal SLR is the result of the combination of the Formula One team Mc Laren and Mercedes the impressions on board, driving this machine are simply indescribable. It was from the association between Mc Laren and Mercedes that was born the phenomenal SLR which was also built in and by Mc Laren. 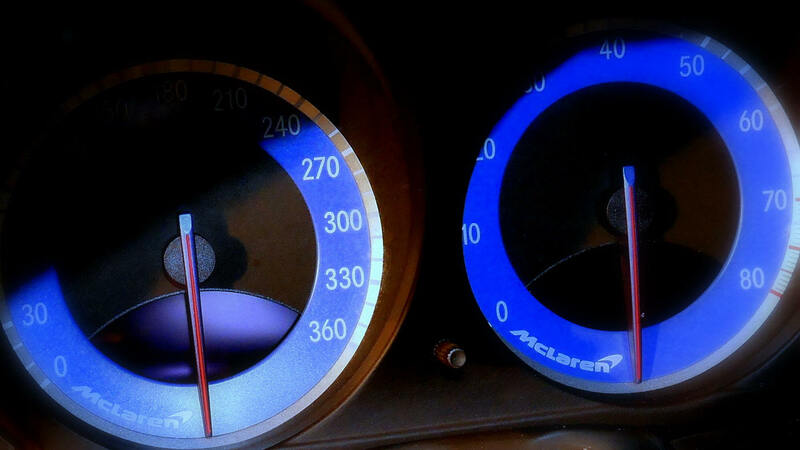 Since no more than fifty McLaren F1s exist, the SLR has settled in the wake of its glorious elder destined for enthusiastic connoisseurs eager for a superior technology, a mechanical jewel bearing the same signature ... 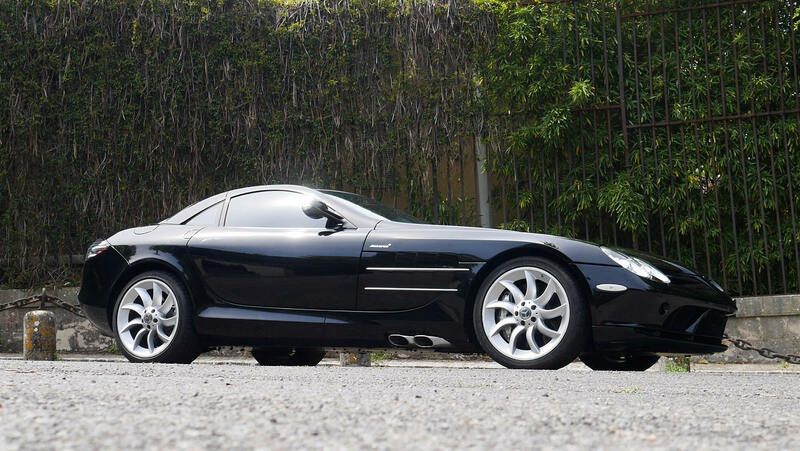 But It is also imbued with the immense legacy of the Mercedes SLR racing. 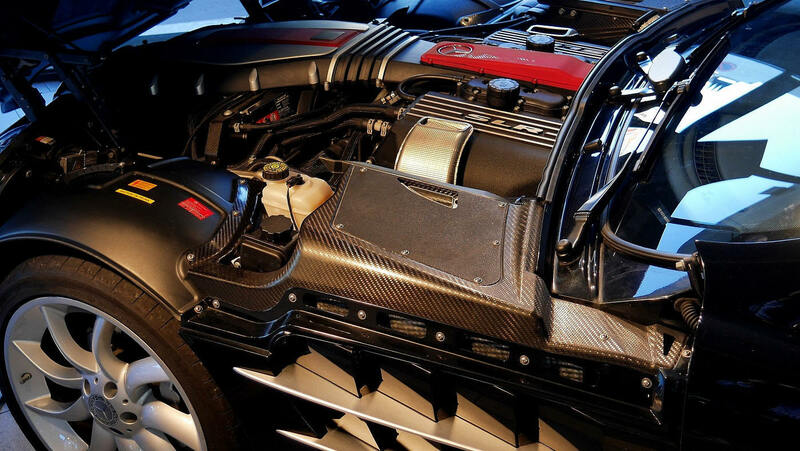 The structure of the SLR is a monocoque in composite-carbon, a technique also used for its bodywork; The mechanically powered V8 engine, which is centrally located in front, delivers nearly 80 Nm of torque at 3200 rpm. 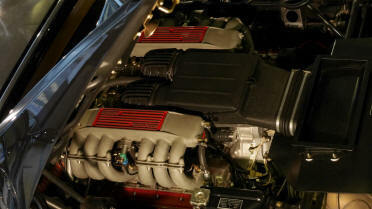 And a power of 630 HP. 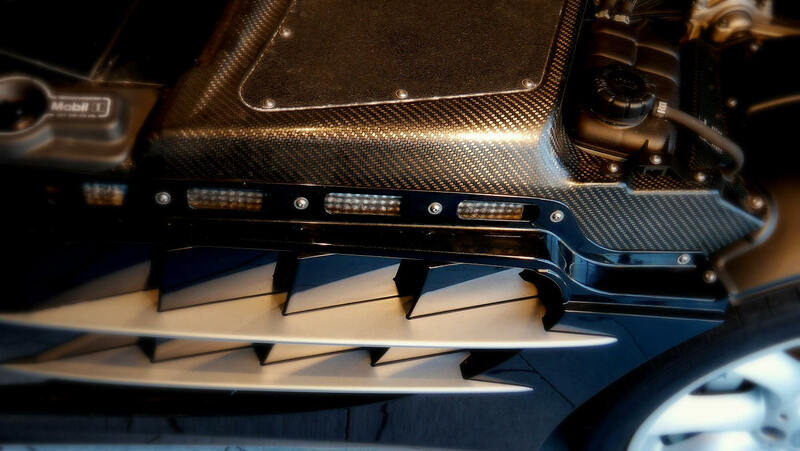 The braking system is intelligent, piloting eight-piston calipers and a spectacular airbrake bearing the chromosomes of the arrows of Silver Le Mans. 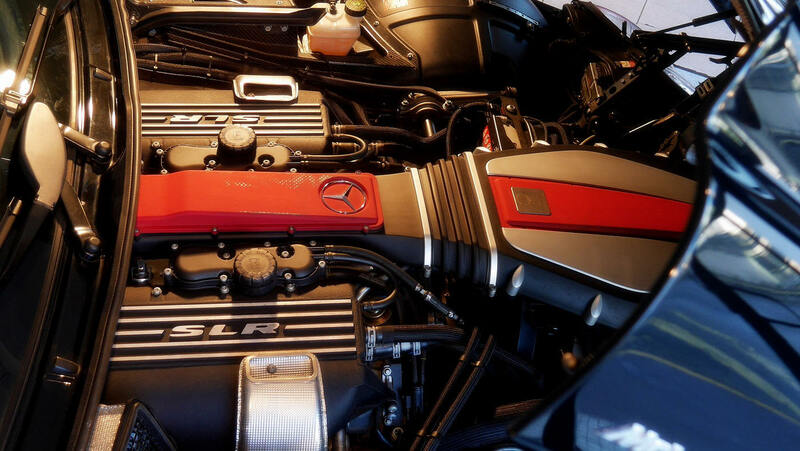 A breathtaking line, like its stunning thrust up to 335 km / h. Its presence suggest to be prudent, but it is a Mercedes, and the only Supercars, usable on a daily basis. 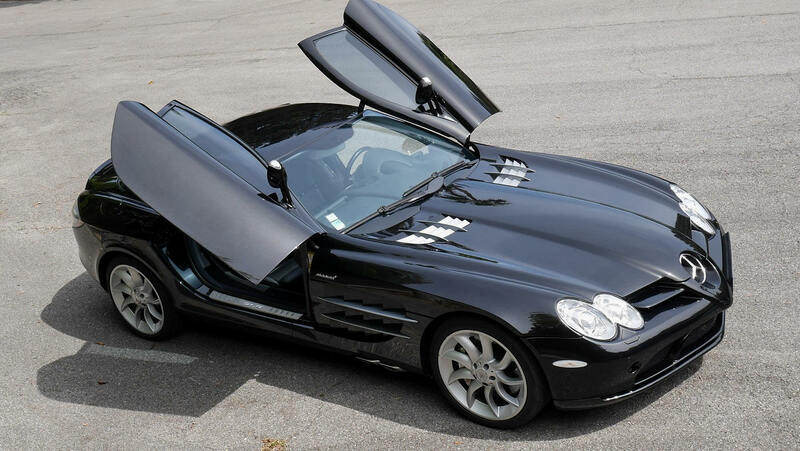 This SLR of 2007 is one of the rare new delivered in France, chosen Black Crystal, with an interior in assorted leather, it knew only one owner, who used it regularly. It has always been driven with respect and perfectly maintained by the workshops of the Mercedes network, its odometer displays 130 000 kilometers, which do not even seem to have touched it. 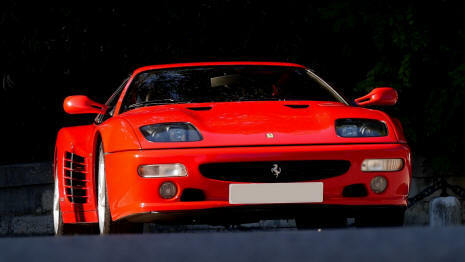 This car we offer is a unique opportunity to have access to the exciting and exclusive world of supercars for a price without competition. With its perfect, low and dynamic shapes, its evocative line turns heads, the Dino is one of the most beautiful Ferrari, an indisputable piece in the greatest collections. 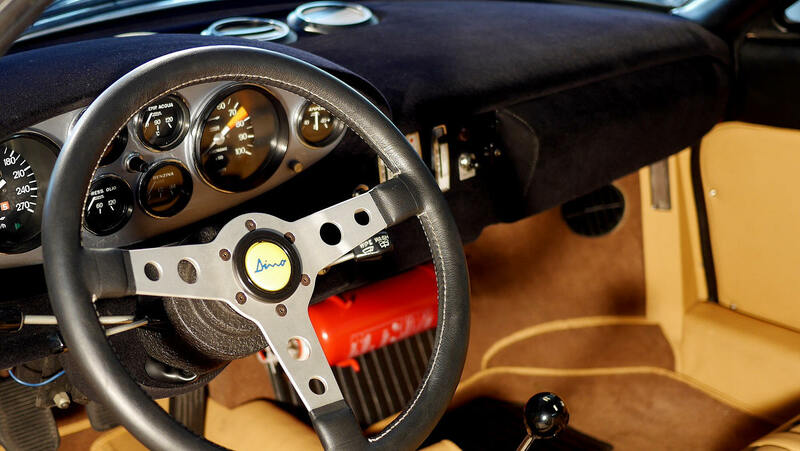 The Dino is inspired directly from the racing prototypes of the sixties of the brand by adopting for the first time for a road car at Ferrari, the "mid-engine" implantation. 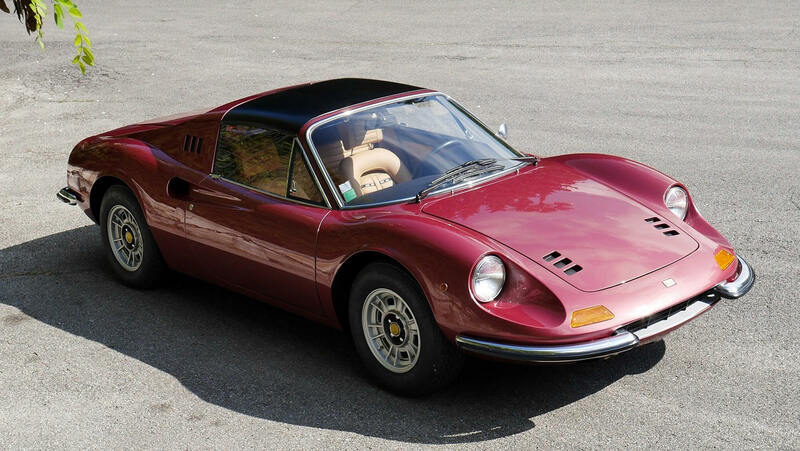 This Dino 246, in GTS's unveiling version, is finished in its original color ("Rosso Rubino metalizzato"), a rare shade that greatly enhances the curves of the bodywork. 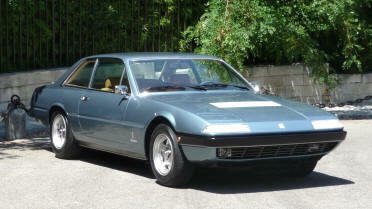 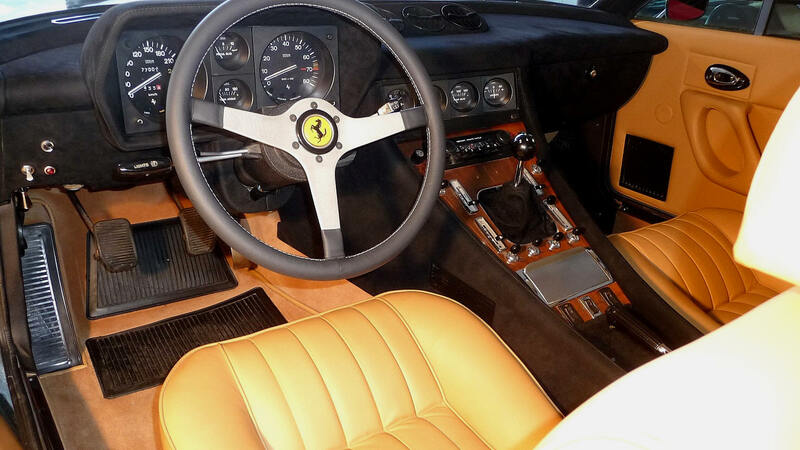 After a high quality restoration, in Italy, this car has been certified by the Ferrari Classiche department of Maranello. 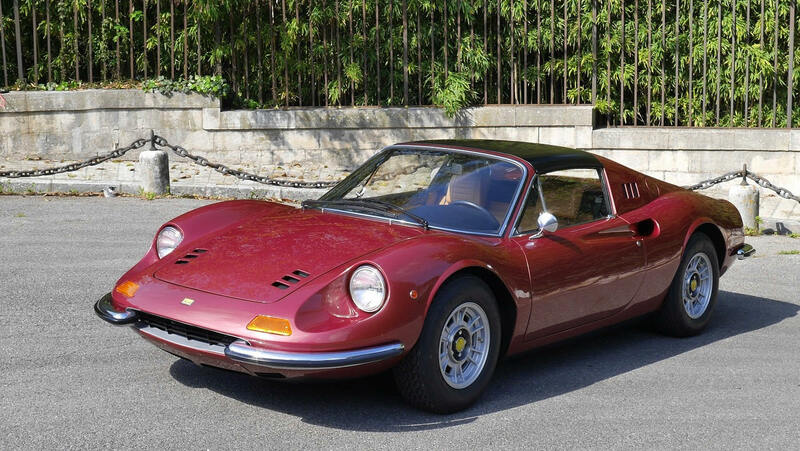 No need for superlatives: she has nothing to prove, eternal youth of a masterpiece, there is nothing to withdraw, nothing to add: the Dino was born child-prodigy, unanimously admired. Its name, only, symbolizes the filial relationship with Enzo Ferrari. 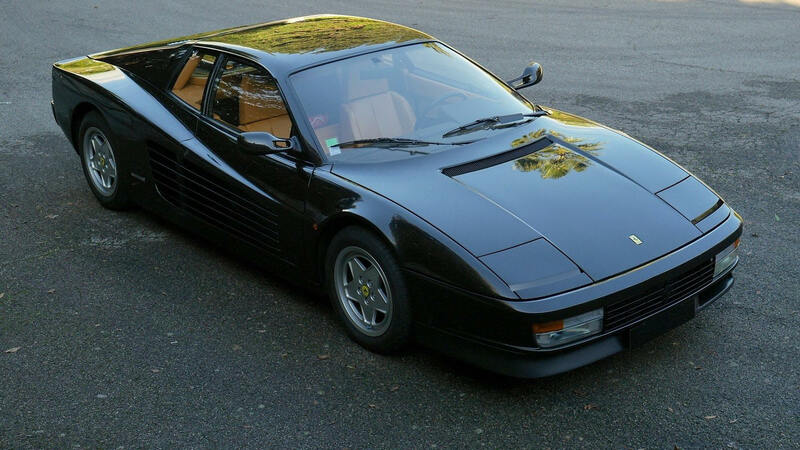 The Ferrari Testarossa has been forgotten by the general public for years, this time is gone. This magnificent machine holds its revenge today, it is actually the ultimate twelve-cylinder engine designed and produced by Ferrari during the life of Enzo. 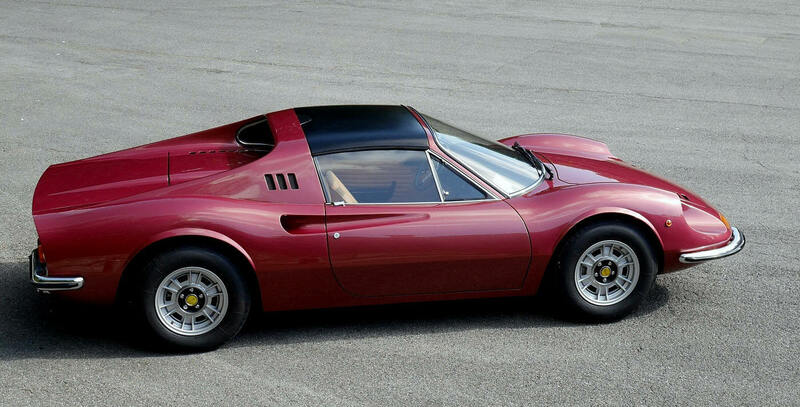 Its design, low and sculptural, has made dream a whole generation, these sports proportions, disappeared after it, the modern Ferrari will be in their drawings, more conventional and higher, in order to adapt to a wider clientele. 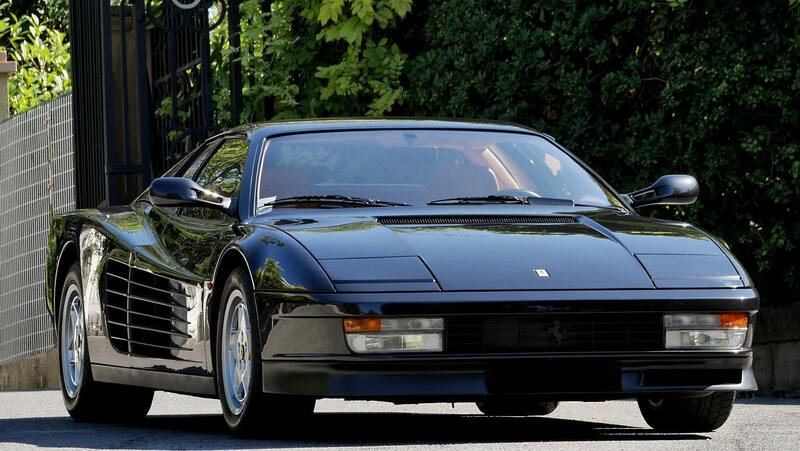 This line-up (with the 512 TR, then the confidential 512 M) is the last configured with a V12 placed in the center-rear position, apart from its Supercars and its V8 models of access to the brand, Ferrari returned to the engine placed at the front. 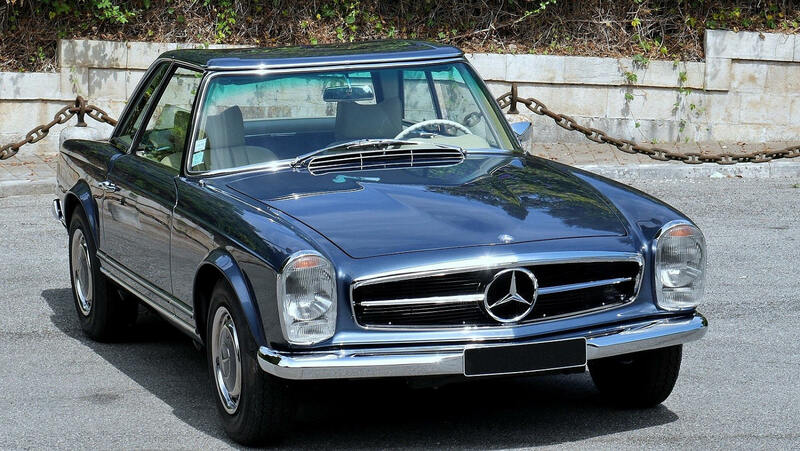 Cars in good state of origin are always the best choice, but there is at the top a category apart, those which, very little used, were able to cross the time miraculously preserved and intact. 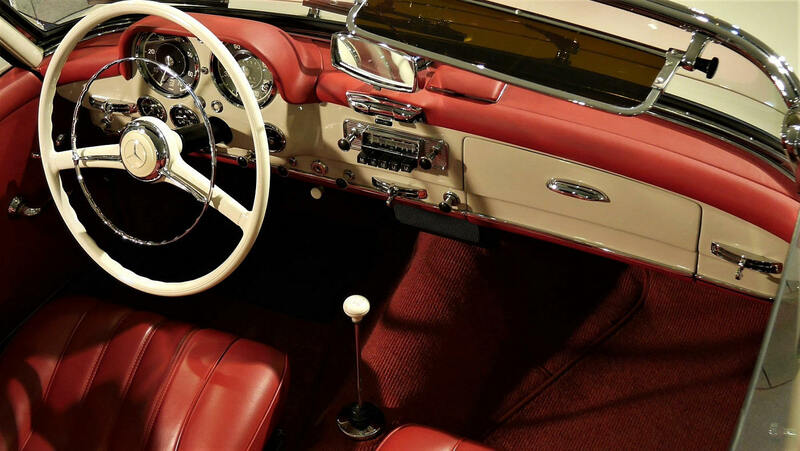 These are the rare references, offered confidentially or stars of the biggest auctions, they beat price records, coveted by well-informed collectors, these opportunities, obviously do not show up twice. 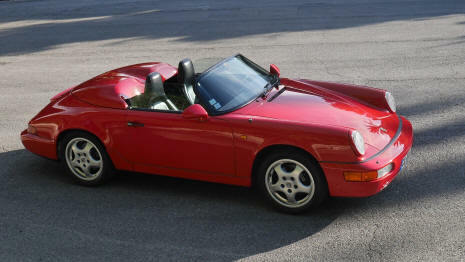 1991 - 8 660 km. 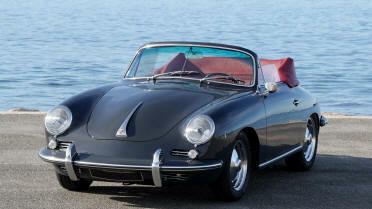 Few old cars have such power: those who drive a Porsche 356 no longer need words like "memories", "past", "history" ... The car is so strongly linked to half a century of legends , To the collective memory, that it establishes a magic bridge between the past times and our tomorrows. This continuity is revealed by the mere look at it: for the soul has never ceased to move us, to touch our senses. Driving this car today is like embarking in a space completely sheltered from the passage of years - and nothing is more precious. 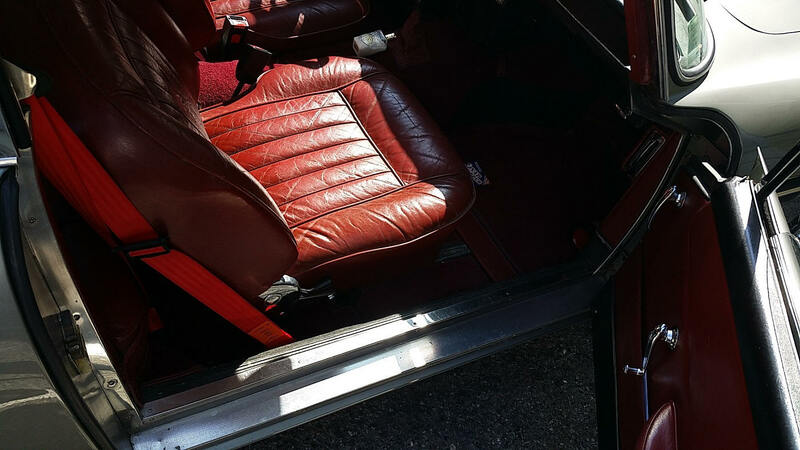 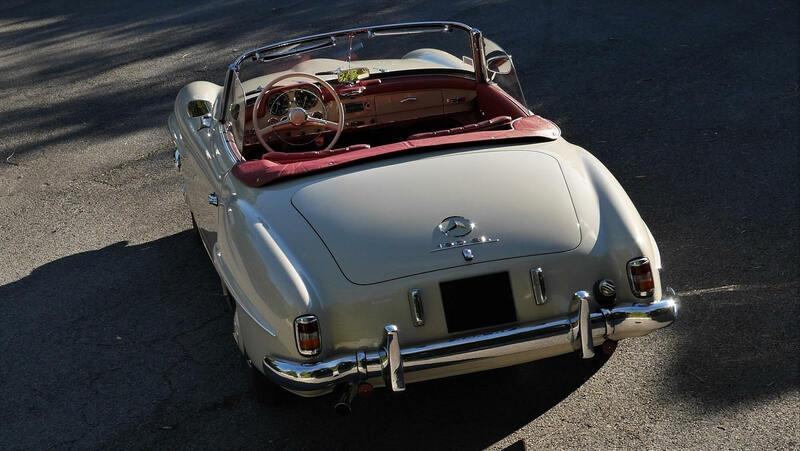 This 1600 S Cabriolet has been restored perfectly, and since then has been maintained by an expert mechanic, it is felt immediately from the start and the first hundreds of meters driven. 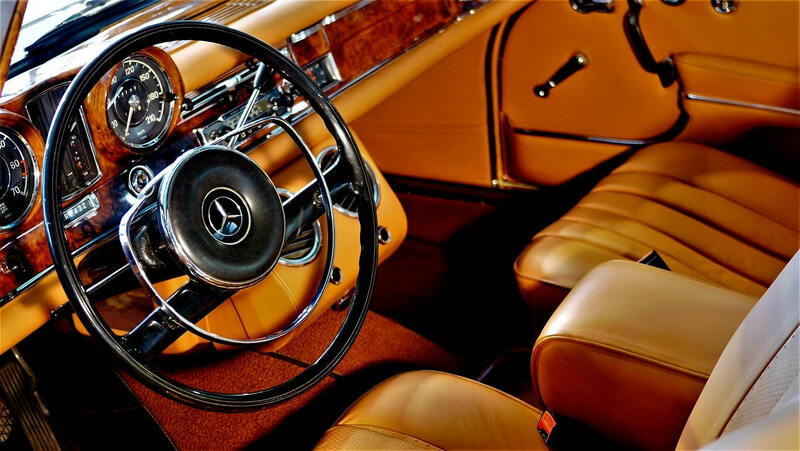 Bright performance or luxury do not really matter when an automobile contains so much truth, perfectly shaped material with this inspiration. 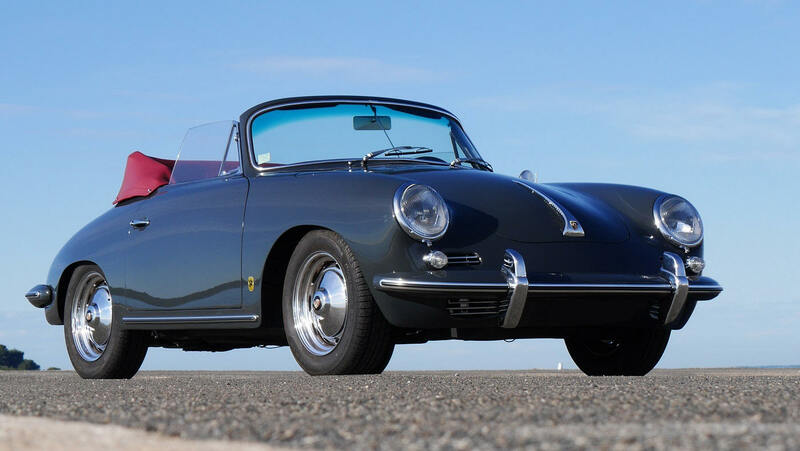 Ferry Porsche signed, without knowing, a work of alchemist: unusual combination of beauty and function, simplicity that borders on genius. 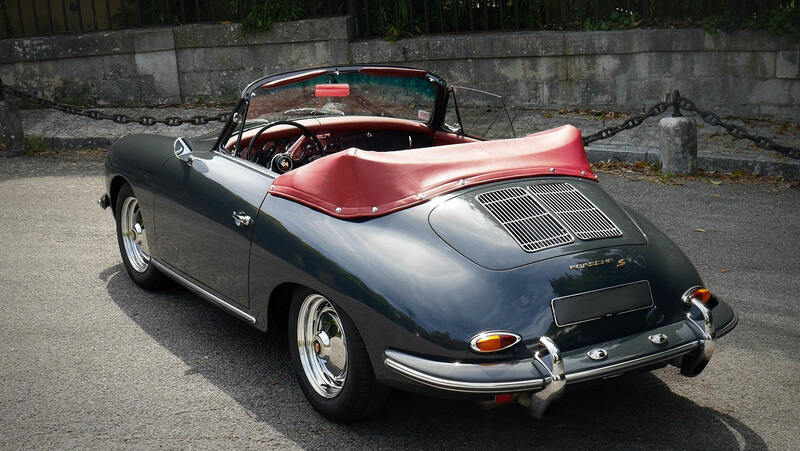 Each 356 is unique, and represents a fraction of an eternal heritage, enchanted by a special spark. 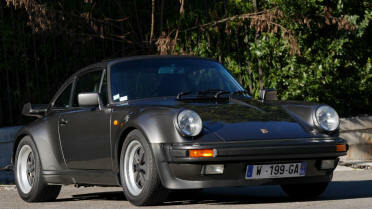 For some, a 911 is conceived only in two-wheel drive, the savages GT2 is the ultimate expression. 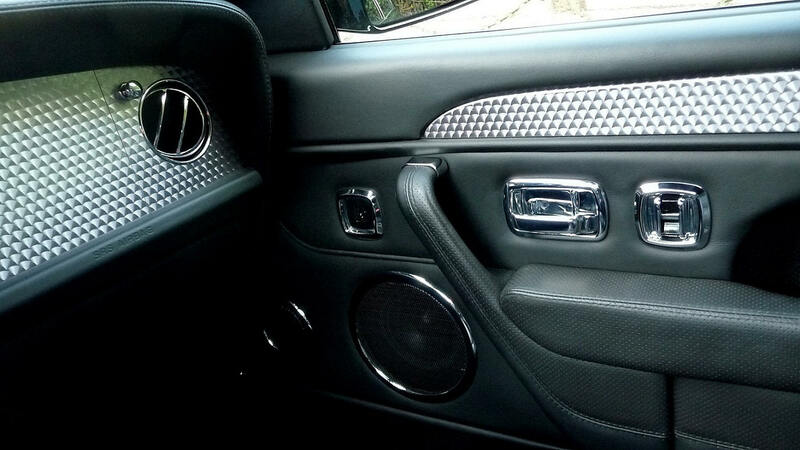 This one is terrible. 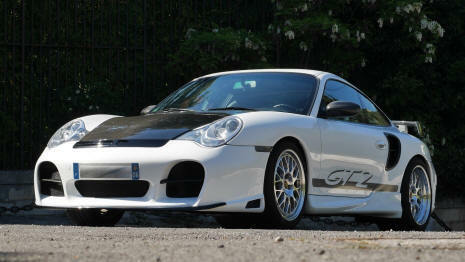 Intimidating and provocative, this 911 GT2 by Ruf, is certainly not to put in all hands, nearly 560 hp. 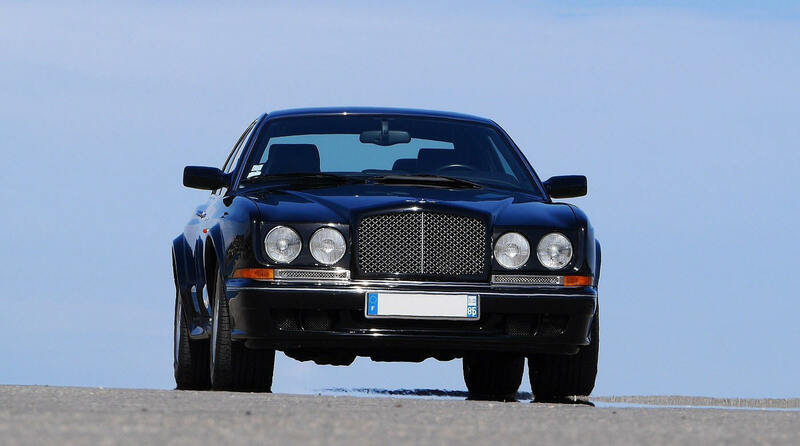 740 Nm of torque, 345 km / h, and do not expect any "driving aid", it's up to you to play. 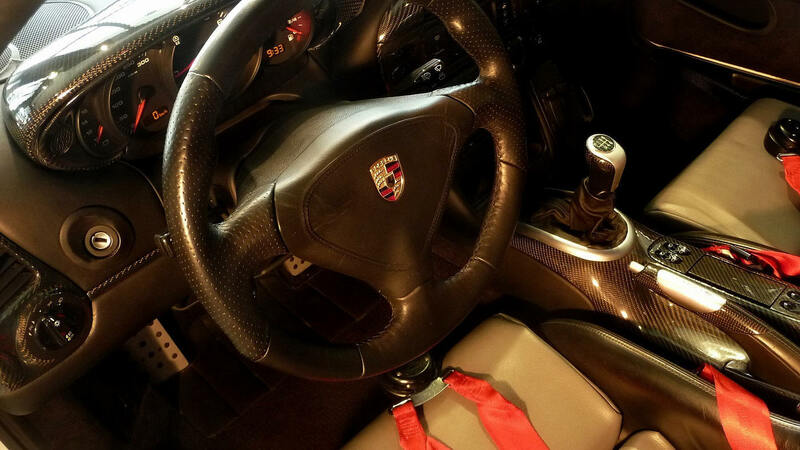 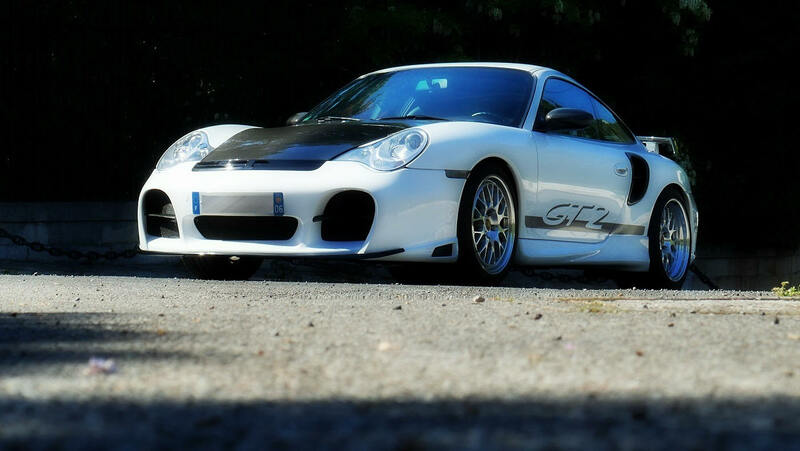 This Porsche GT2 comes from the Porsche France network and was put into circulation in 2001. 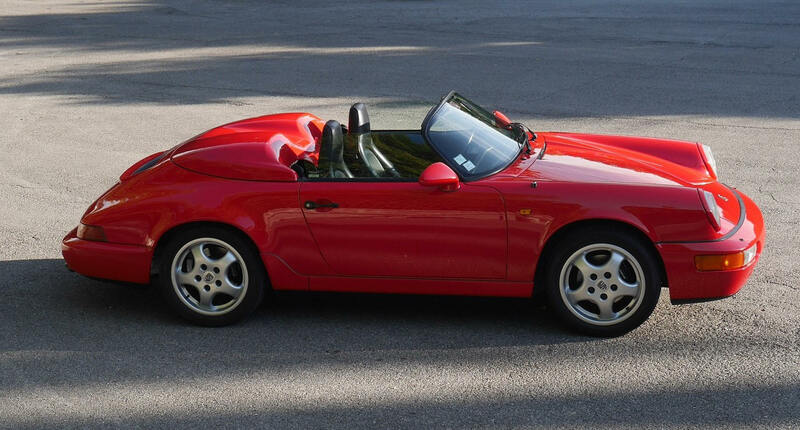 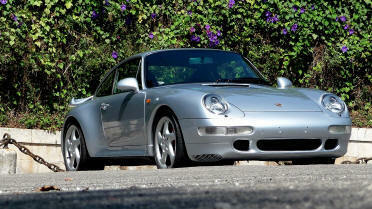 Hardly delivered, its owner had entrusted it to Ruf, Germany, it came back diabolical. 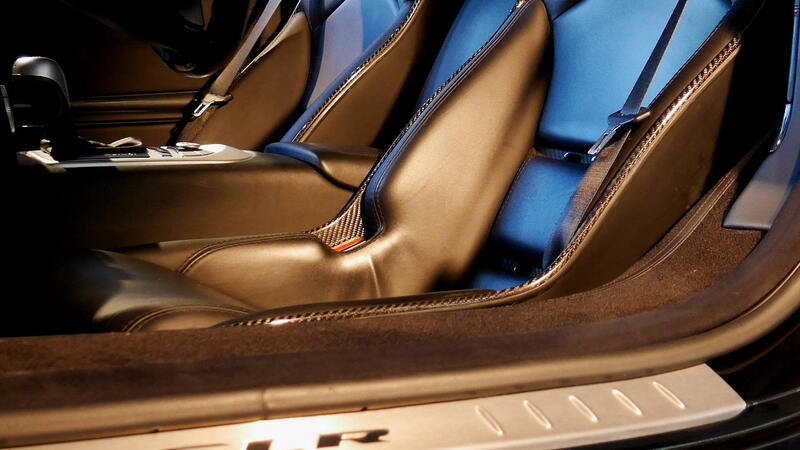 In the cockpit, the perfect finish combines beautifully crafted carbon fiber with leather, creating an ideal ambience, combining the spirit of racing with the pleasure of luxury. 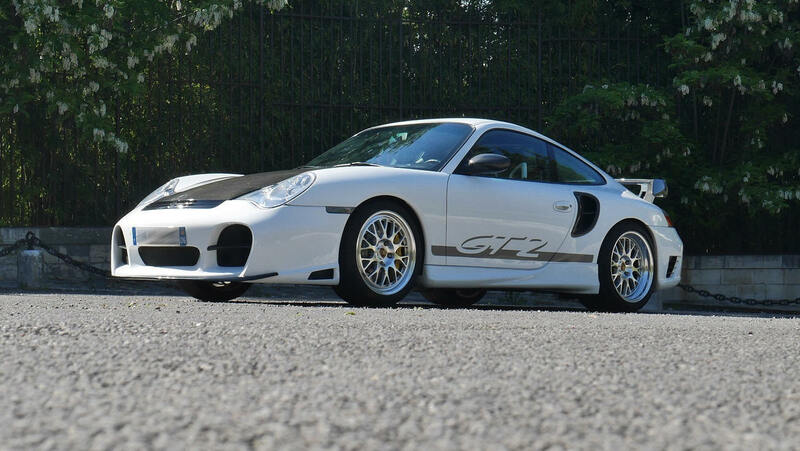 The GT2s, regardless of their model year, are at the top of the Porsche range [with the exception of supercars, with very limited use]. Maximum power, lightness, and character of fire, they represent the dream of any amateur of the brand. 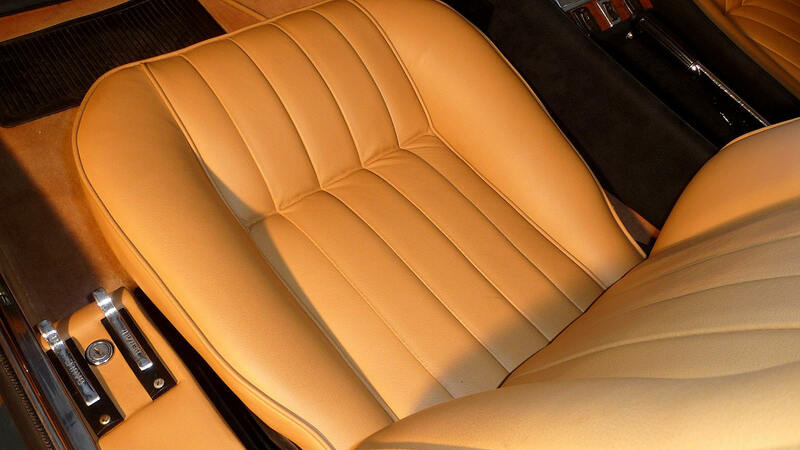 One of the most beautiful Ferrari 4 seats, certainly the most timeless, it is terribly attractive and yet still the most affordable of the mythical lineage of Ferrari classics V12. 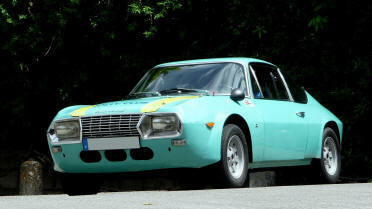 This relative very close to the legendary Daytona, is not to be confused with the 400 and 412, which succeeded. 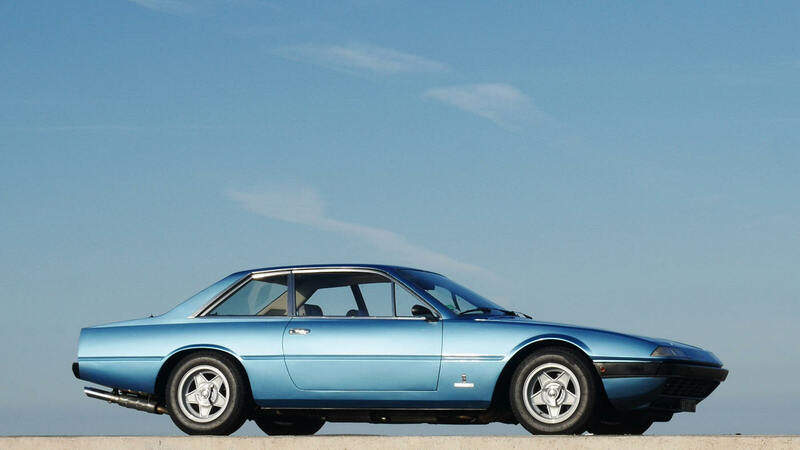 The 365 GT4 2 + 2 is very rare: barely 525 copies of these treasures were built, only 288 in Left Hnad Drive... Forty years later, it is difficult to know how many of these wonderful cars, sometimes misunderstood by the general public, have survived. 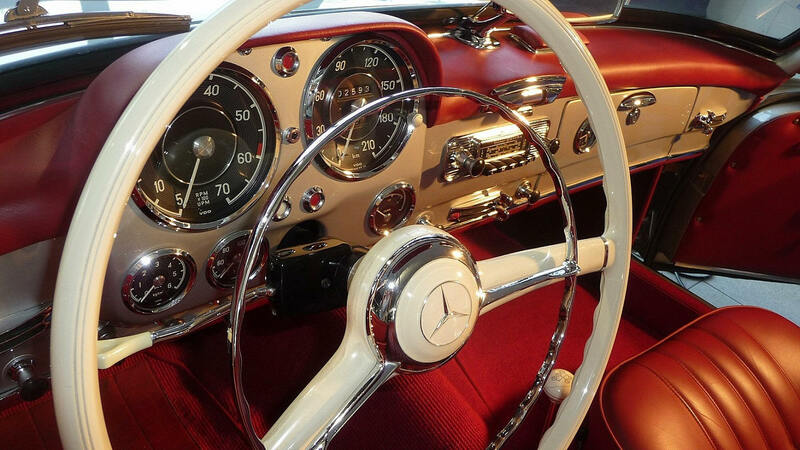 Classical masterpiece, it is only at the beginning of its history: Time reveals its nobility. 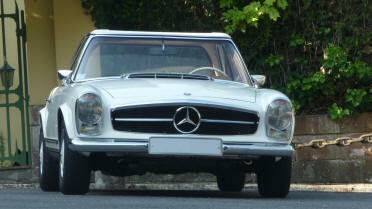 This very beautiful 365 spent most of his life in Switzerland, before his arrival in France in 2008. 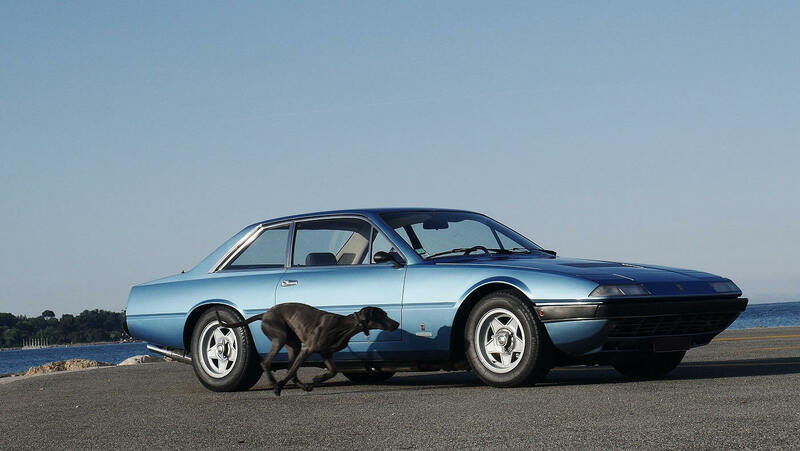 The overall quality of this car and its behavior are excellent. 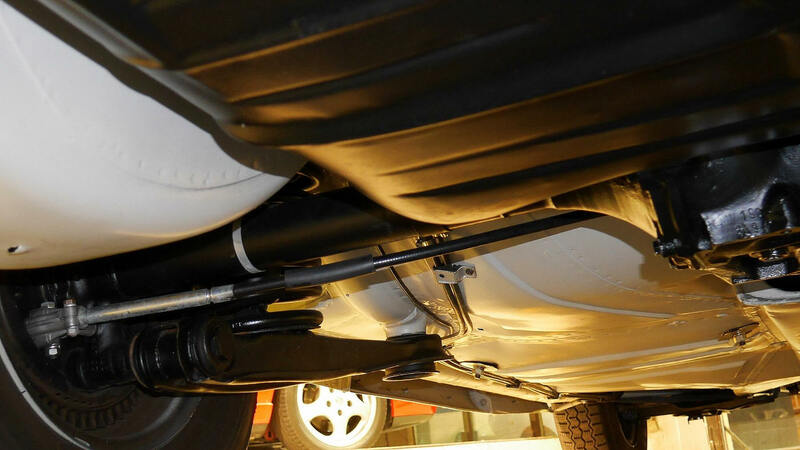 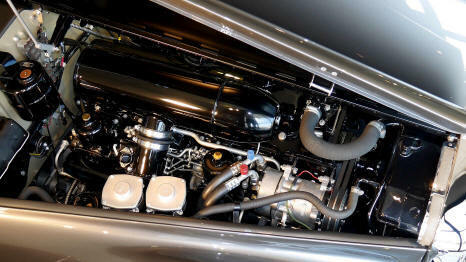 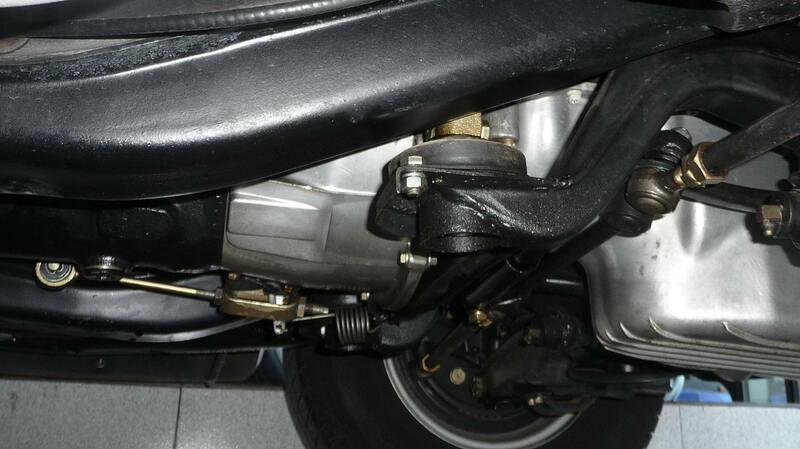 The appearance of the engine and its perfect operation let us think that it has probably been redone, the clutch has been replaced recently, the exhausts are stainless steel, the interior in good original condition. 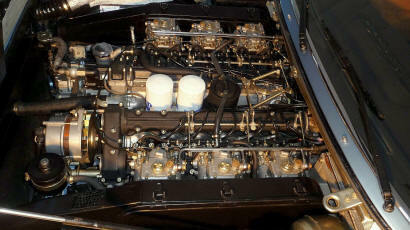 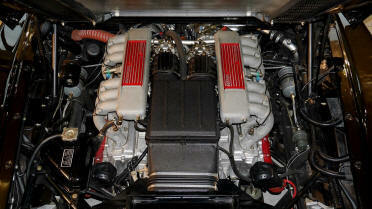 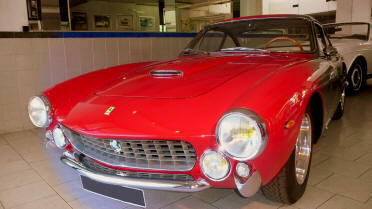 A classic FERRARI, 12 cylinders, is the symbol of the classic car. 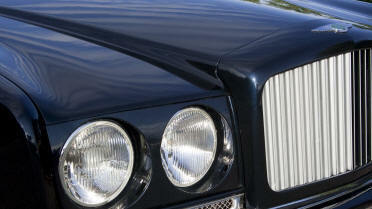 It is simply THE reference, for both enthusiasts and experts. 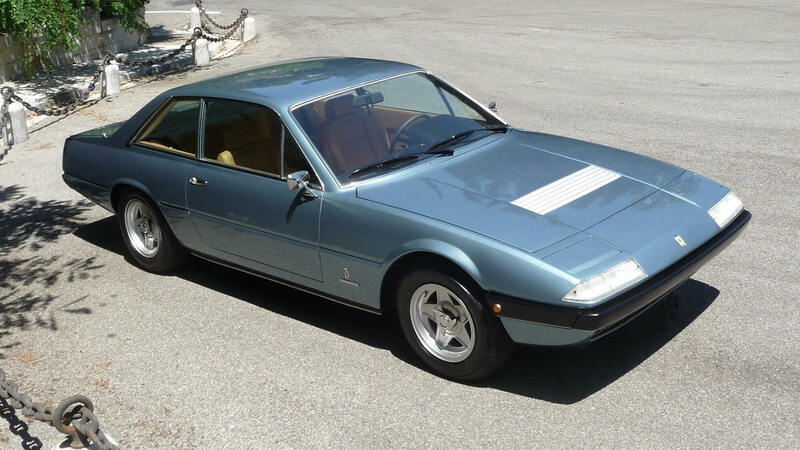 This model, mechanically very close to the Daytona, much rarer, and of an extraordinary beauty, is still very unknown to the general public which makes it certainly the best opportunity, because of a price still shifted compared to its true value, to access the dream territory of all car enthusiasts. 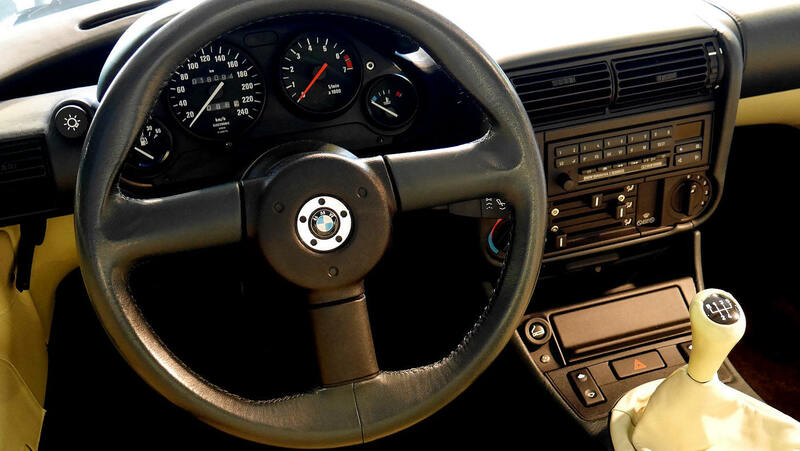 1997 - 55 500 km. 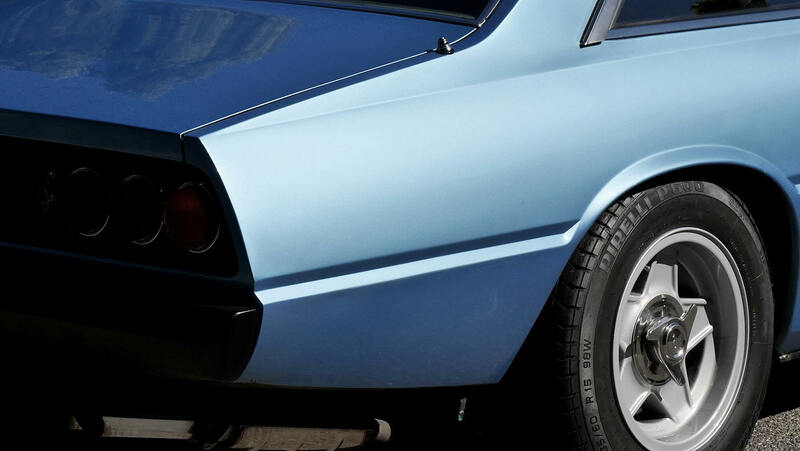 The brand has built its legend on the extraordinary history of six victories at the 24 Hours of Le Mans, looking for nearly a century, a timeless alchemy, beauty, refinement and extreme performance. 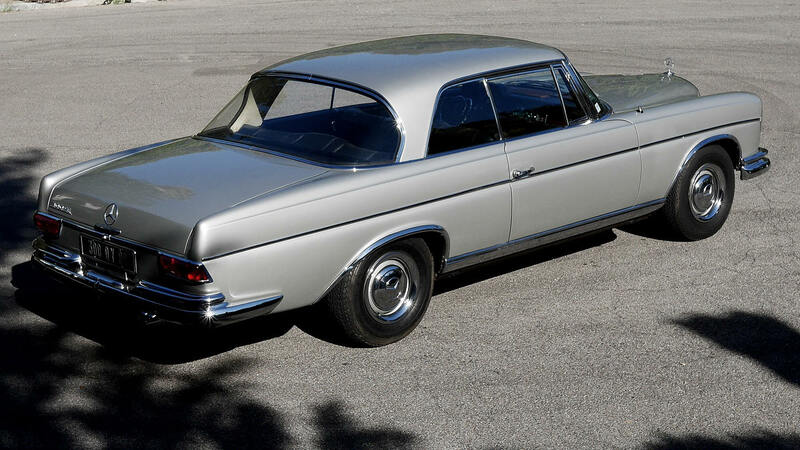 The Continental Coupé T, is the final signature, There are just over three hundred of these treasures [including only 217 driving left], which for some time have found their place among savvy collectors . Since the fifties, Bentley and Rolls Royce shared their models, the Continental R, presented in 1994, it will be exclusively Bentley, it finally takes the torch, beautifully. 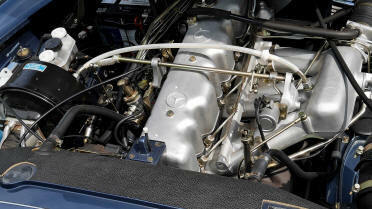 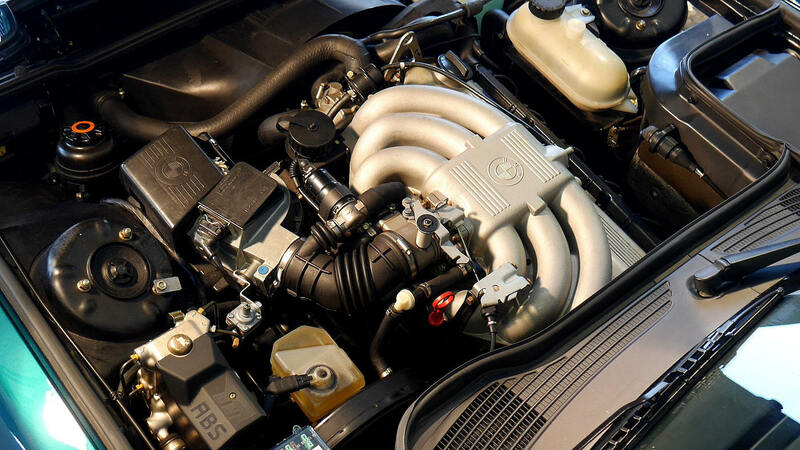 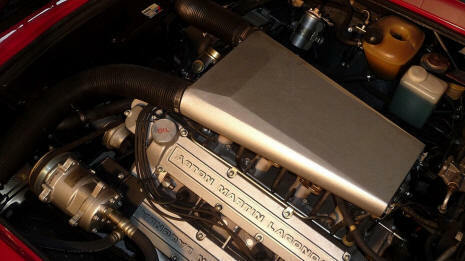 This great cup is an exemplary success, a dynamic line, suggestive but in restraint, a mechanic of nearly 400 hp. with a record couple to cross at 250 km / h, in silence. 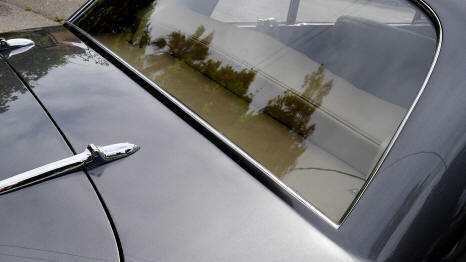 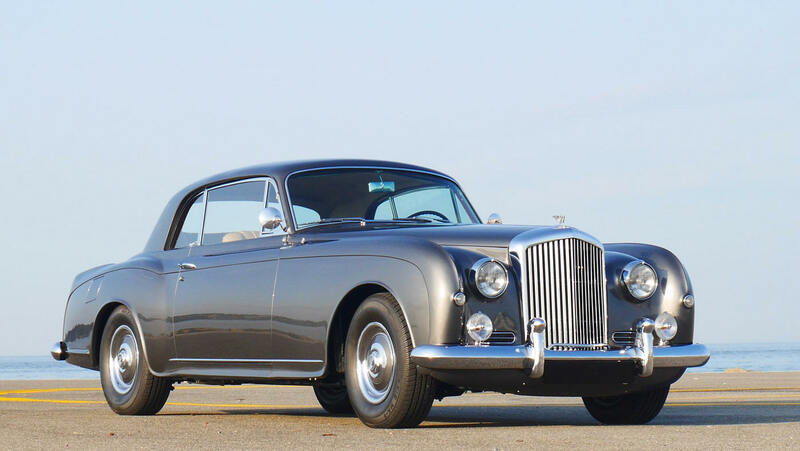 The search for perfection led Bentley to go further, the Continental T was presented. 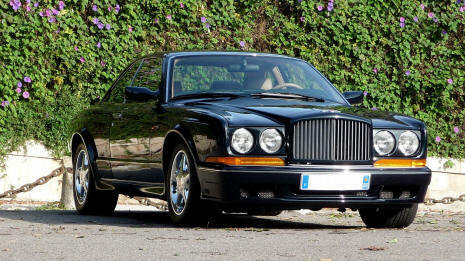 The proportions change, its wheelbase is shorter, the roof is lowered while its tracks are widened, its engine V8 of 6.75 liters supercharged, more powerful (426 ch.) Develops even more torque (89.2 mkg to 2200 tr / min). 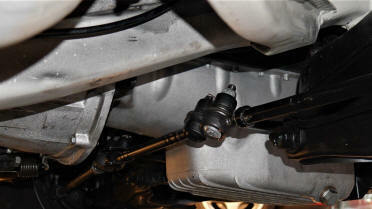 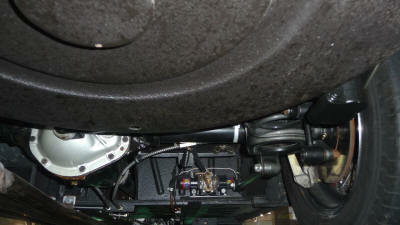 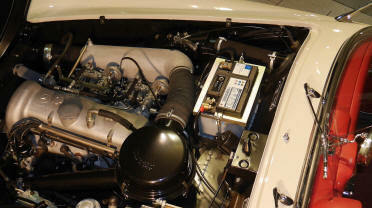 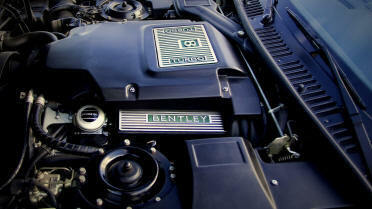 We know that long before the maximum power, the low-end torque is the secret of driving pleasure ... 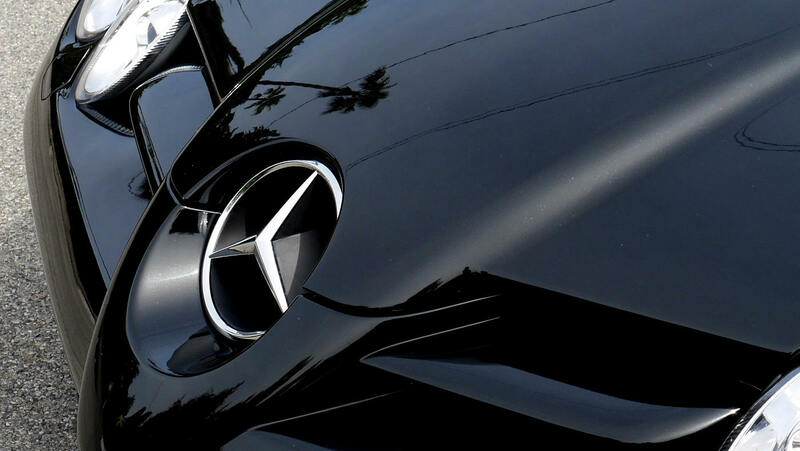 The performances fly away, the top speed reaches nearly 275 km / h. The design of the body, more aerodynamic and muscular is successful, iconic. 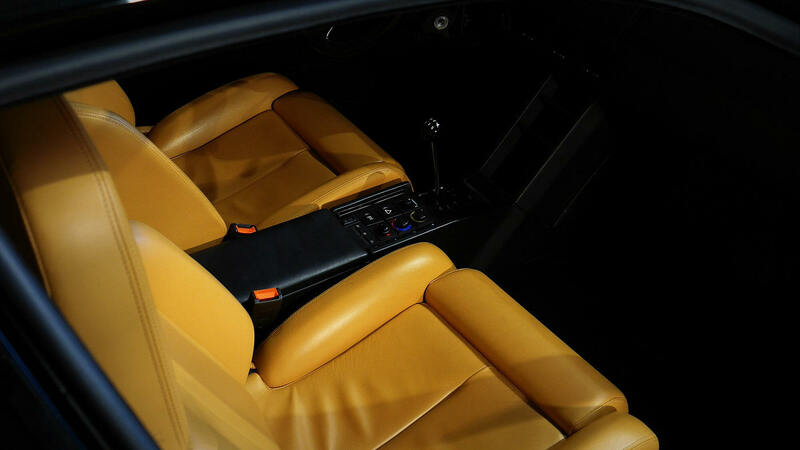 Once inside, you can contemplate the interior, the harmony of chrome, leather and worked aluminum offers a particular architectural beauty, a mixture of racing machines and planes, in the fragrance of a time gone . It's a treat all the time. 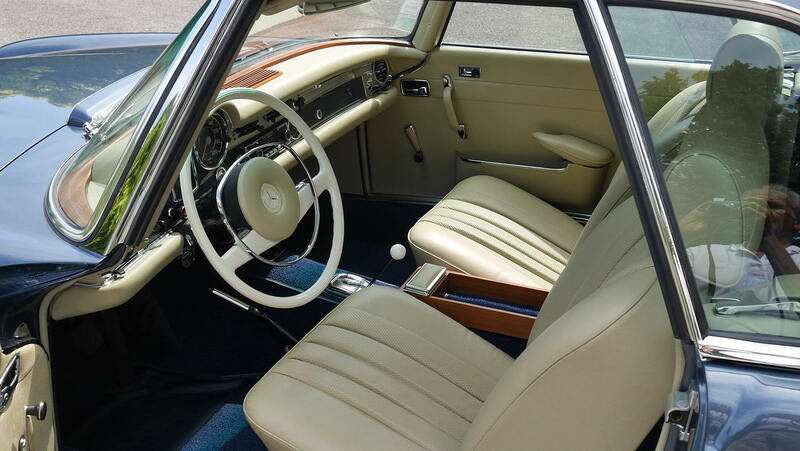 This beautiful Continental T is finished in "Black Emerald ", an extremely dark green, appearing deep black, and illuminating with emerald highlights under the lights, the upholstery is beige accented with dark green matching. She has traveled a little more than fifty-five thousand kilometers. 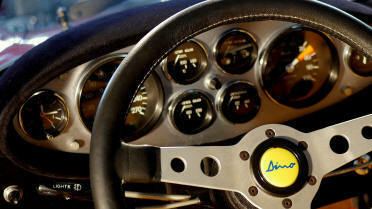 The opportunities to acquire and enjoy one of these masterpieces are rare, for many, there will soon be only regrets. 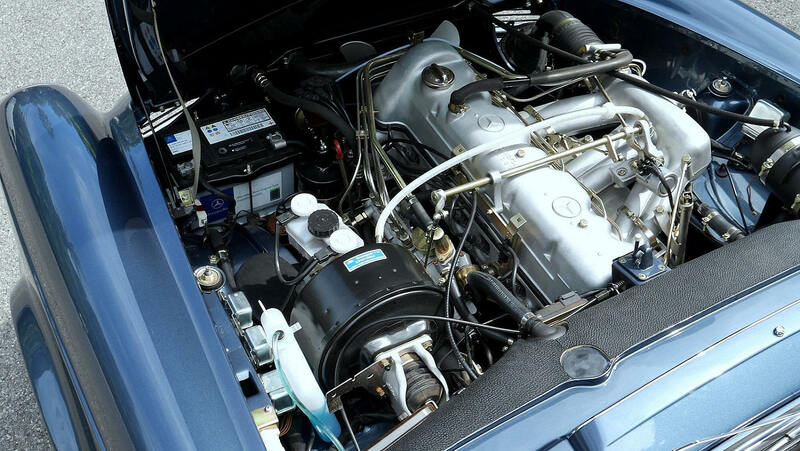 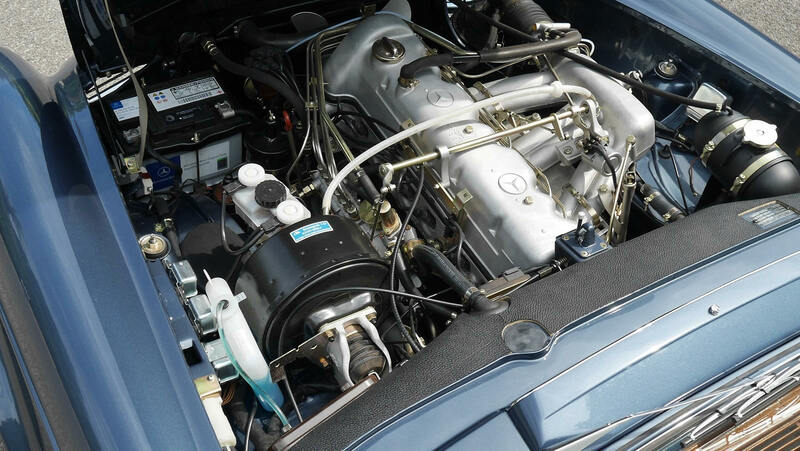 This Mercedes 280 SL, in European version and automatic transmission, with a soft top and a hard top is the ideal configuration, this model has been the object of a total restoration of very high quality. 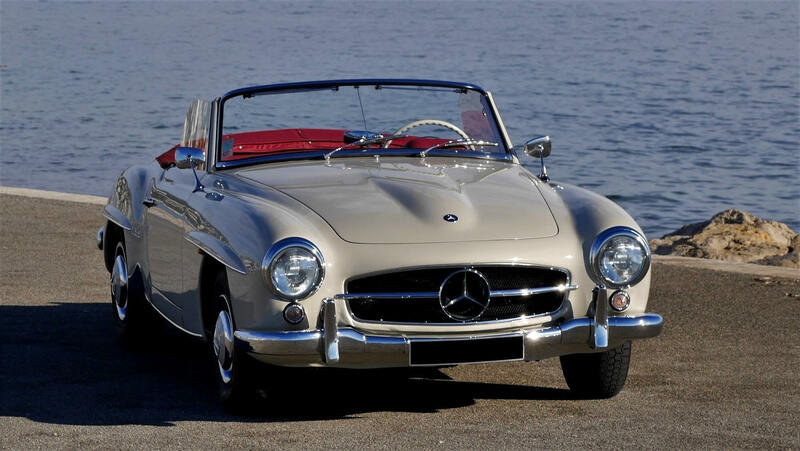 Introduced at the 1963 Geneva Motor Show, the new SL convertible represents a major achievement in the history of Mercedes-Benz. The refined and sporty modernism of his drawing - by Paul Bracq - was immediately unanimous. 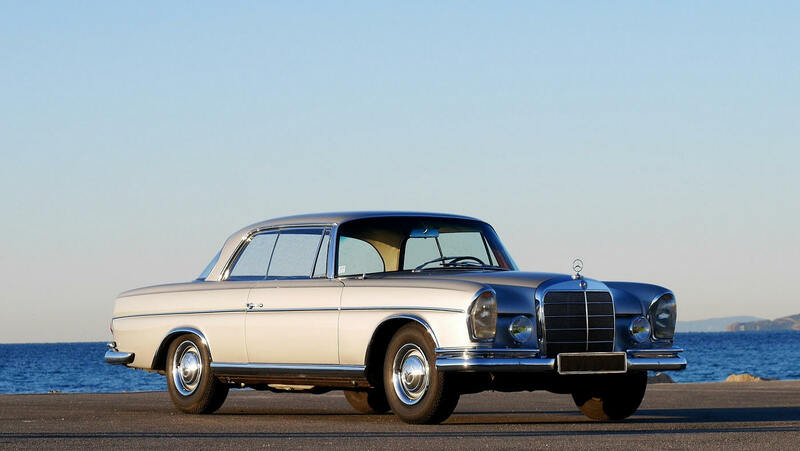 Millions of motorists have dreamed of owning one, and well beyond the circle of collectors, this is still the case today. 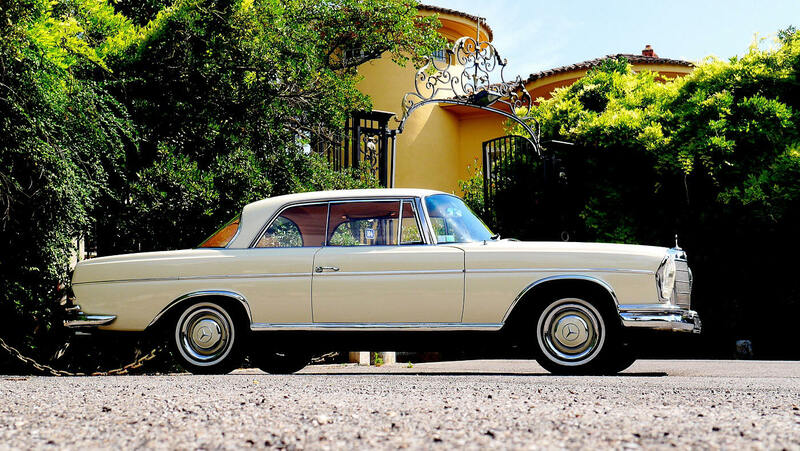 Ahead of its time, the line of the "Pagoda" is timeless and touches perfection, obviously very beautiful, but especially absolutely insensitive to more than 50 years since its presentation. 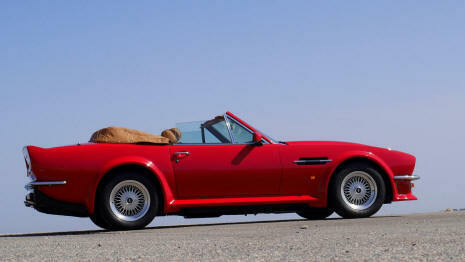 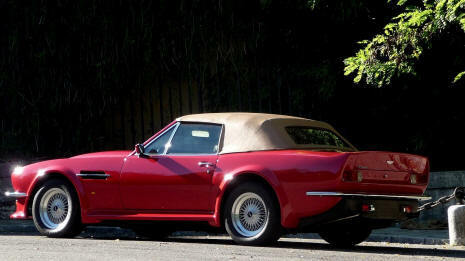 This is one of the most popular classic convertibles, its success is not random. 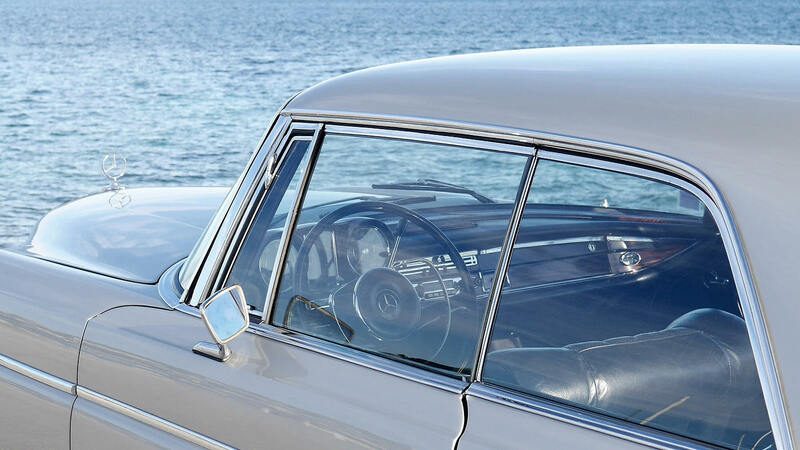 The astonishingly modern line, its historical importance, the pleasure of driving, its reliability and ease of use and maintenance make it one of the safest values ​​on the market. 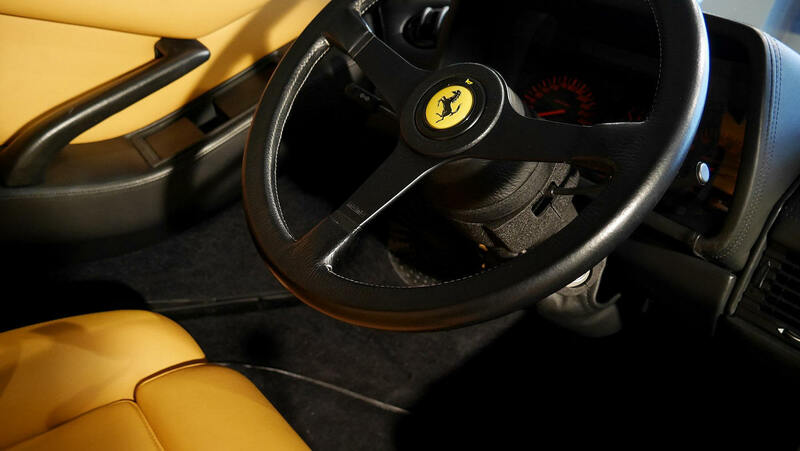 However, it must be known that the versions are numerous, and of unequal value, according to the motorizations, 230, 250 or 280, the automatic or manual gearboxes, while passing by the "California", devoid of soft top .. 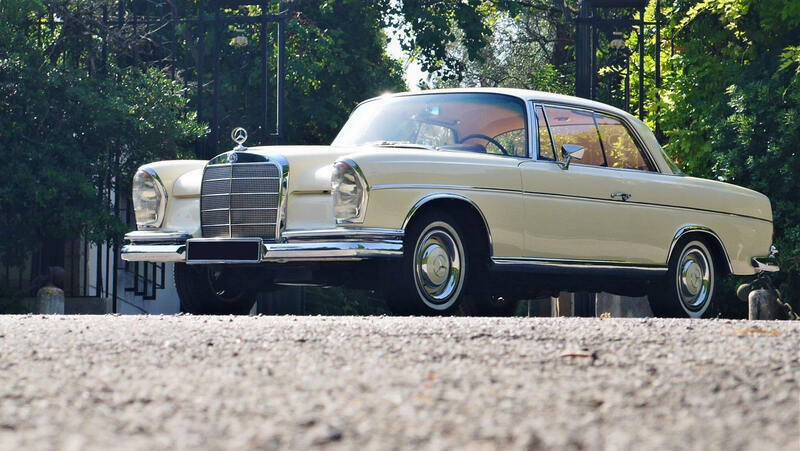 It is also necessary to make the difference between cars in "European" configuration and those intended for export to the United States, finally, the history, known or not, of each copy will be decisive. 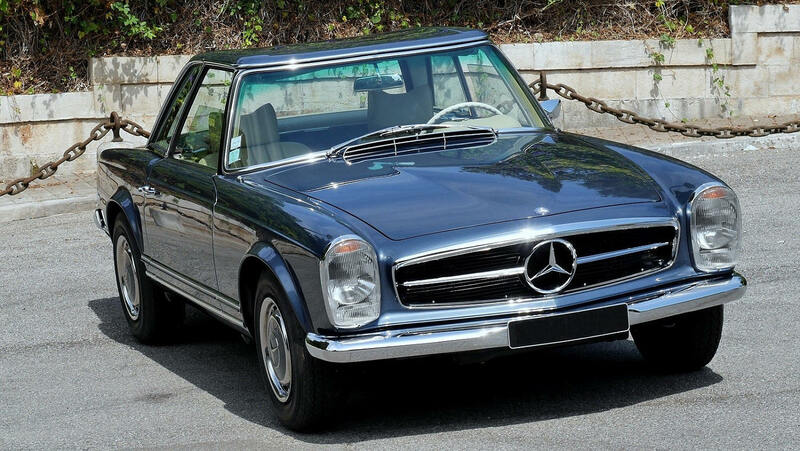 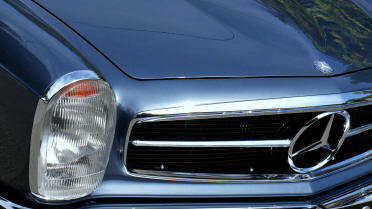 The Mercedes 280 SL, automatic, crowns the different versions of these iconic cabriolets. A must-have classic car. 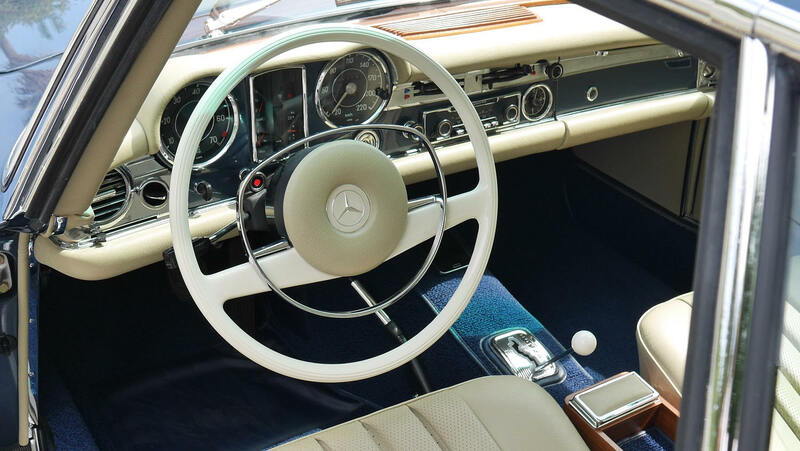 Very famous, and even symbol of a certain art of life, the Mercedes 280 SL Pagoda offers an incredibly easy and modern driving, small and light (the doors and hoods are made of aluminum) its comfortable and efficient behavior, the power steering, very nice and the six-cylinder 170 hp. 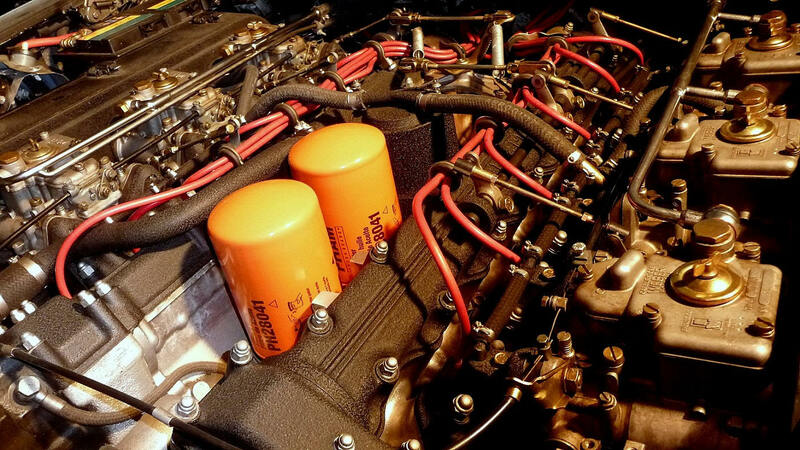 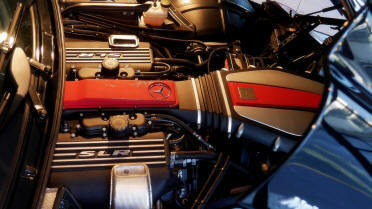 ensure a current car liveliness. 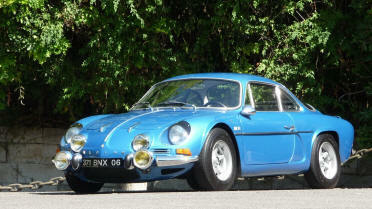 Owning and being able to drive this extraordinary collector's car is a satisfaction at all times. 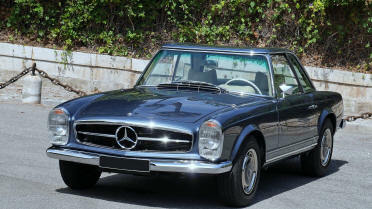 The Mercedes 280 SL Pagoda is a reference in the classic car, it is one of the most beautiful that can be acquired. 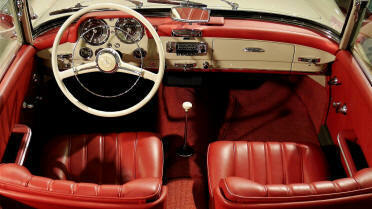 The perfume of the past, the cars in those days, it was really different. 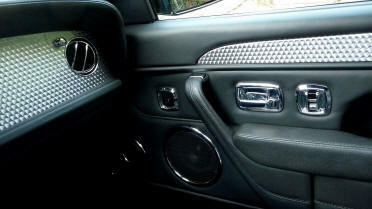 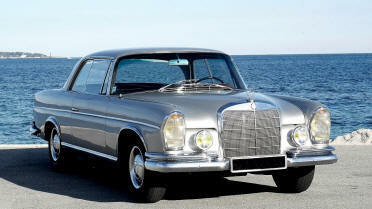 The great Mercedes Coupes are characteristic of this golden age, they were both sign of good taste and wealth. 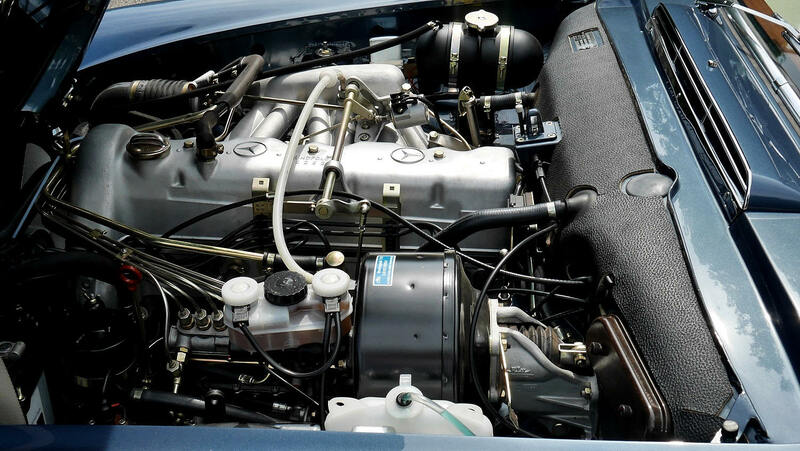 The elegance of their lines crosses the decades as a perfection, the quality of manufacture and refinement of their six-cylinder in-line mechanics, suffer no criticism. Few classic cars can transmit this perfume of old with so much authenticity. 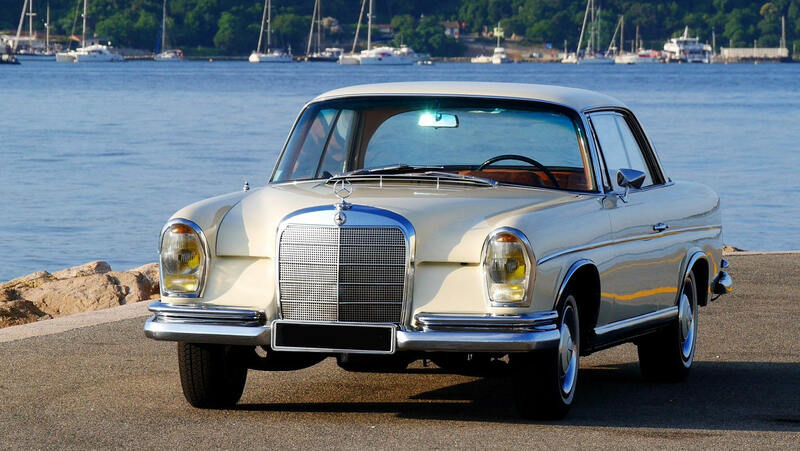 Their charm has never disappeared, almost in secret, they are the delight of connoisseurs, different versions of these wonderful cars with extraordinary beauty, were proposed, but the 300 is apart and the most refined. 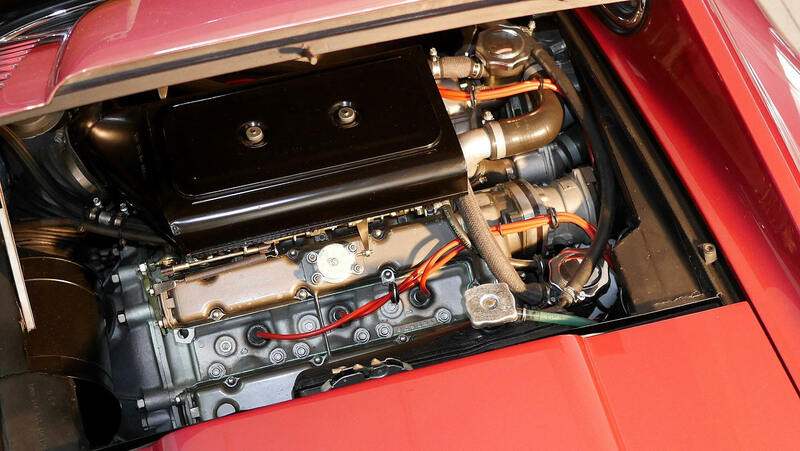 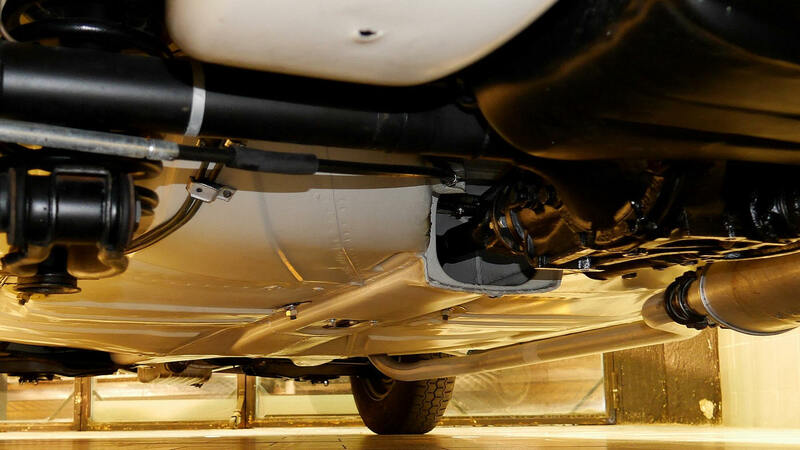 Its pneumatic suspension, which it shares with the fabulous 600, its 3-liter inline six-cylinder engine, close to that of the 300 SL "Gullwing", its rarity and the luxury of its finish put it well above other versions. 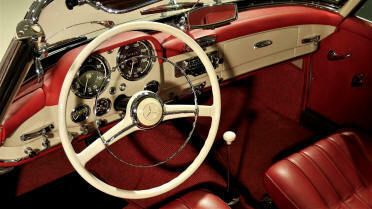 Contemporary and very inspired by the legendary 300 SL, the MERCEDES 190 SL is a major classic car. 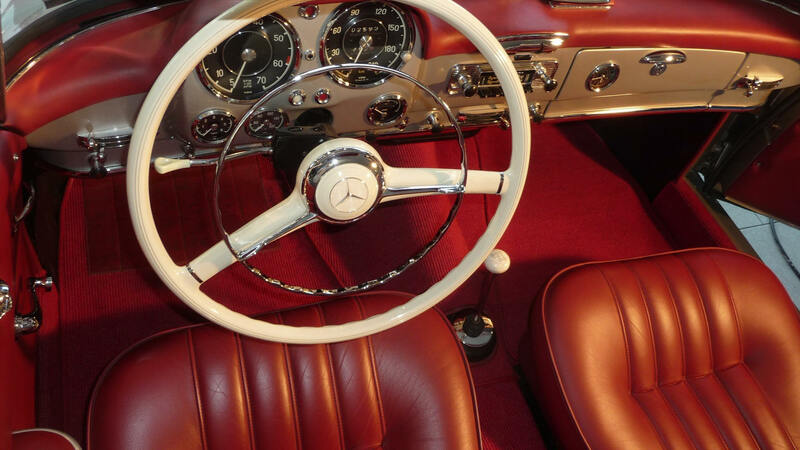 The choice of a very good copy will always be the best, this Mercedes 190 SL, fully restored, is irreproachable, one of the most beautiful available. 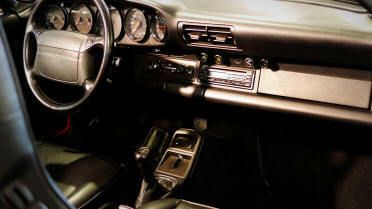 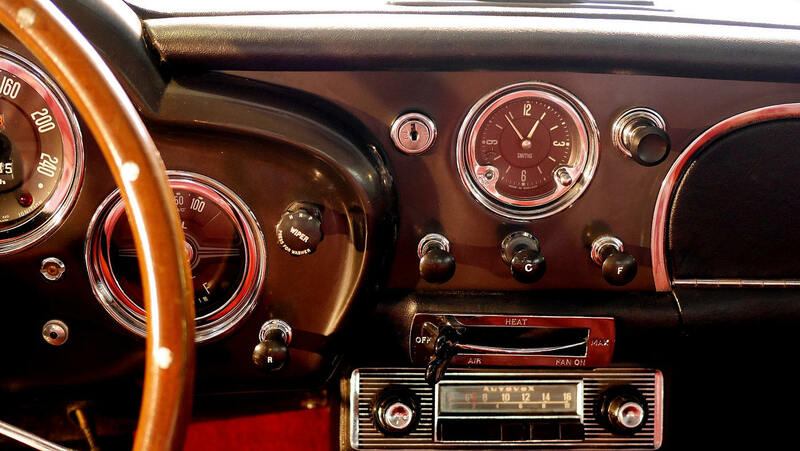 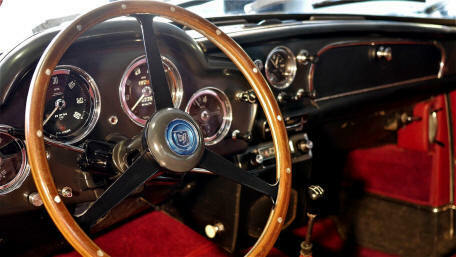 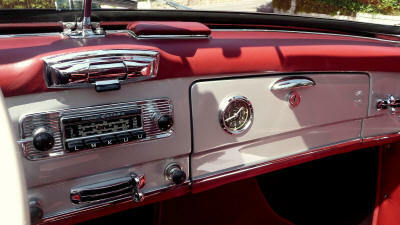 The dashboard is a work of art, drawn, carved and evocative, the incomparable charm of the sports cars of the sixties is before our eyes, even at a standstill. 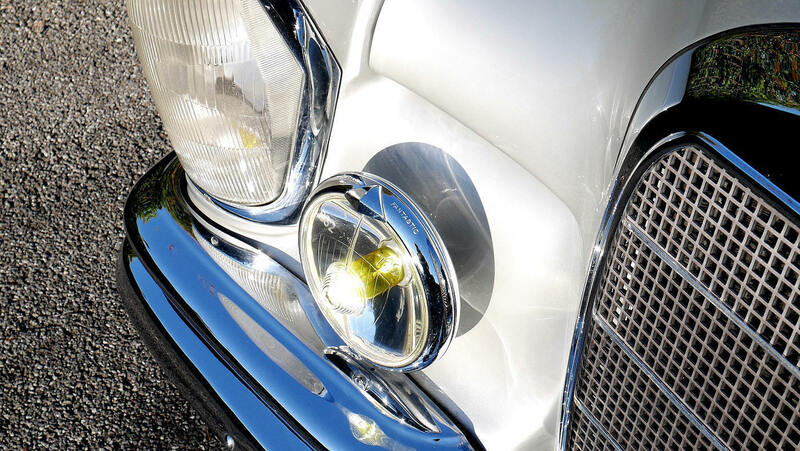 The beautiful chrome circle serves as an alarm and its rotation, activates the turn signals .. 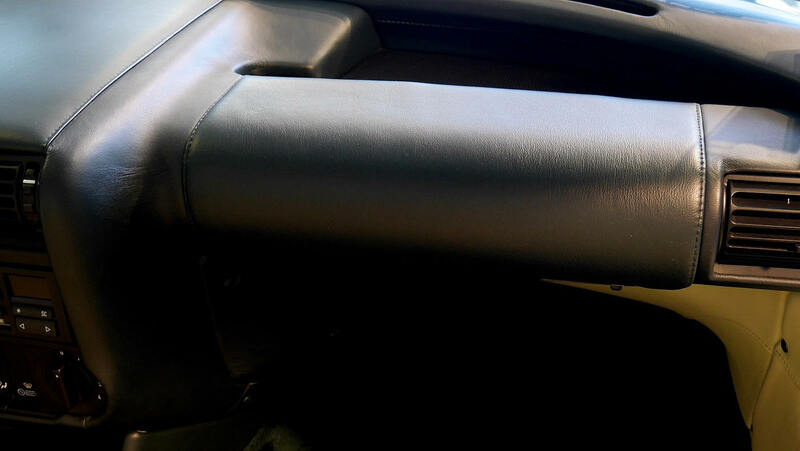 The watch, on the cover of the glove box, is mechanical winding. 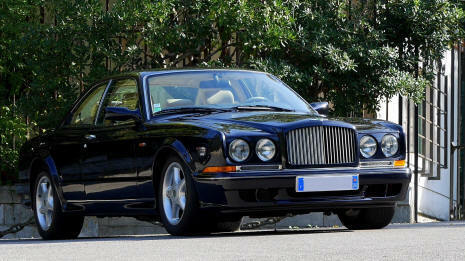 2001 - 46 900 km. 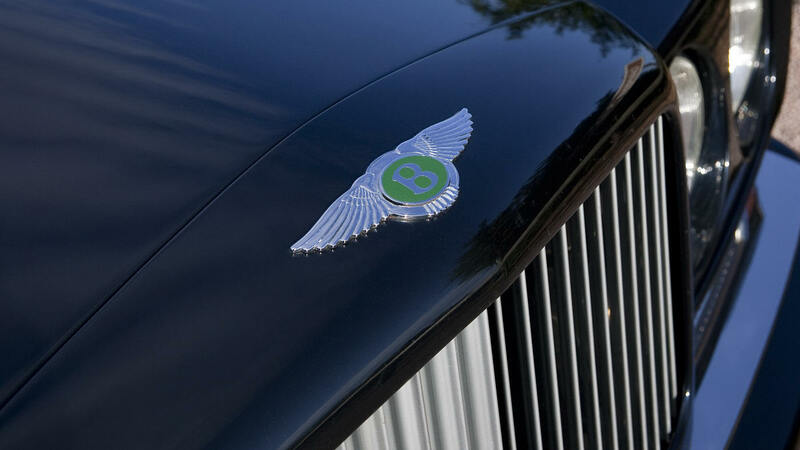 Fifty years later, it's the same inspiration and for the last time, which guided Bentley, the qualities and performance allowed by modern engineering here join the timeless spirit of Bentley, this car is comparable to zero other. This was undoubtedly the swan song of a legendary story. 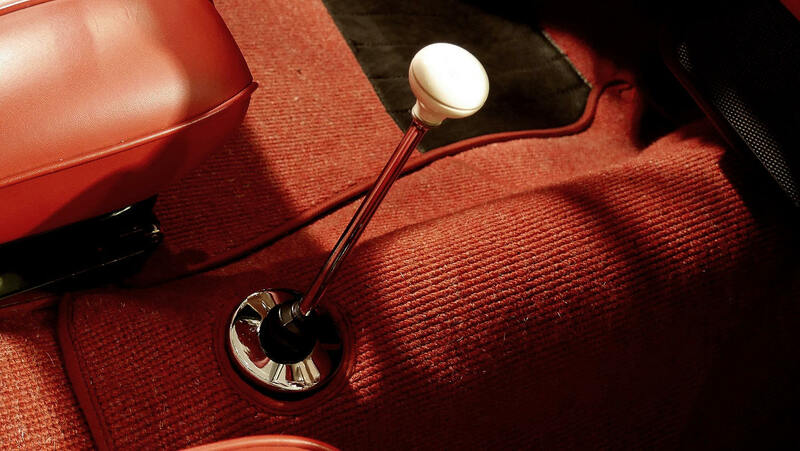 There are only a little more than three hundred of these treasures, including 217 driving left, enter this very closed club, it is the invaluable privilege to travel in a work of art. 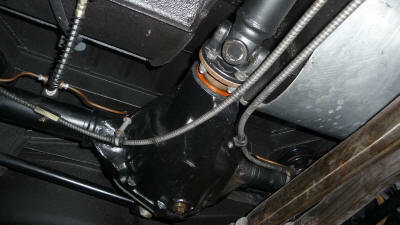 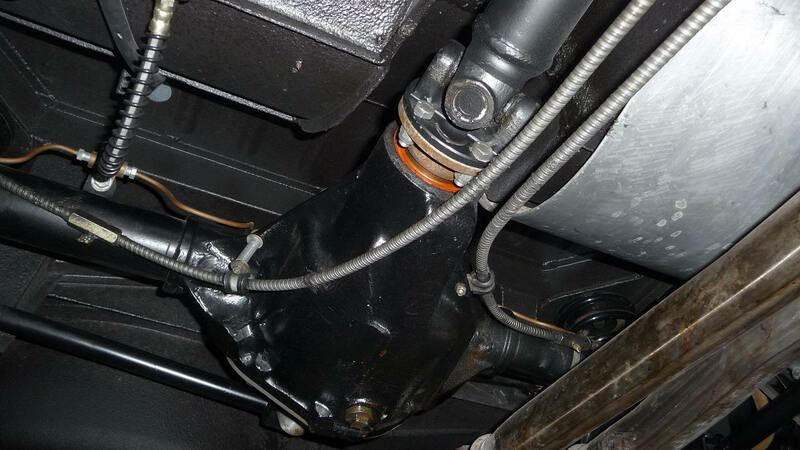 The copy we offer is the most admirable we have seen, it has covered only 46 900 km, perfectly maintained. This Bentley Continental T is finished in a sublime deep black, the slightly tinted windows protect the interior where the matching leather upholstery contrasts with the corked aluminum finishes and the massive chrome pieces, the set is just perfect. Bentley poses with this wonderful Coupé a final signature to his legend, built on an extraordinary epic history of six victories at the 24 Hours of Le Mans, looking for nearly a century, a timeless alchemy, beauty, refinement and extreme performance. 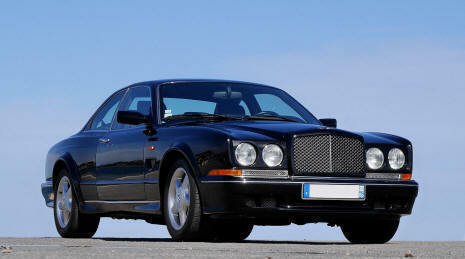 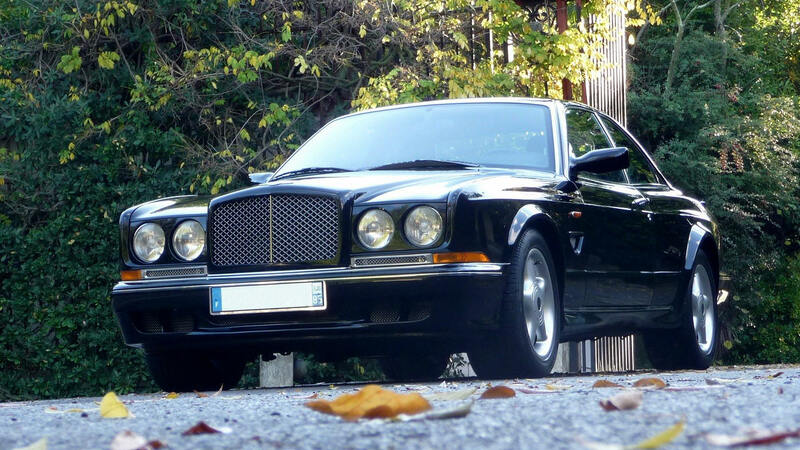 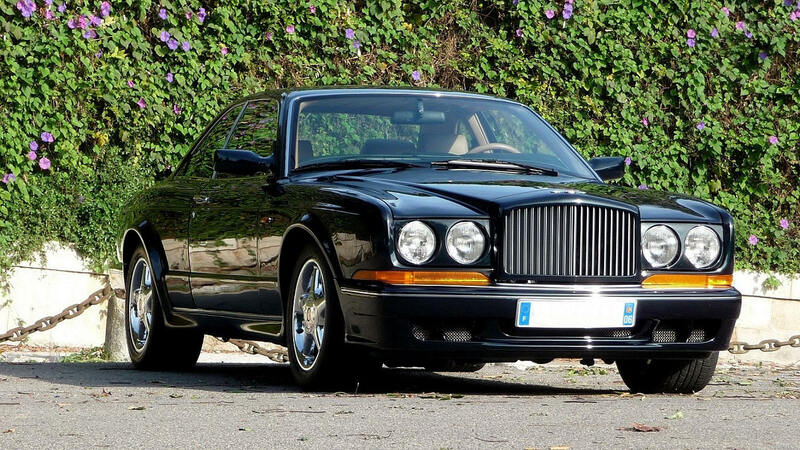 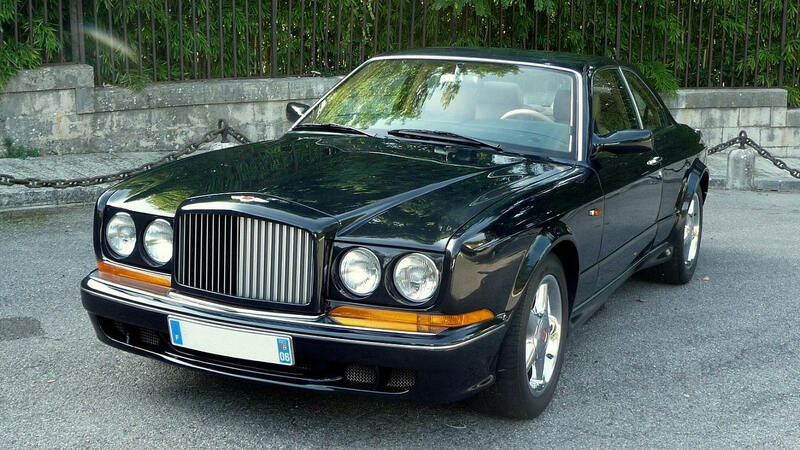 The Continental T will remain as its last masterpiece, and in this spirit, it is definitely unsurpassable. The price on the bill for this car when delivered in 2001, was more than three hundred and seventy thousand Euros, the equivalent today would be worth even more, but it does not exist. 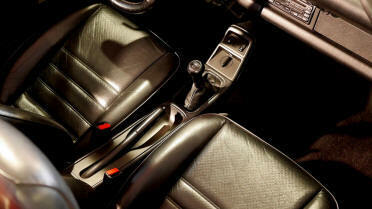 Unfortunately, car production is no longer just a mistake, whatever the level, the maximum profitability, the conquest of market shares make the law. 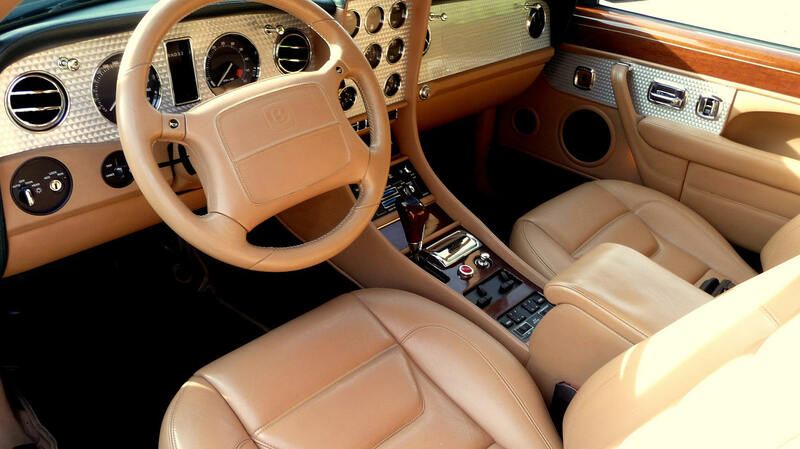 So a Bentley Continental T, will be a choice of pleasure, but also of reason, one of those cars that can be kept forever, unsurpassed. 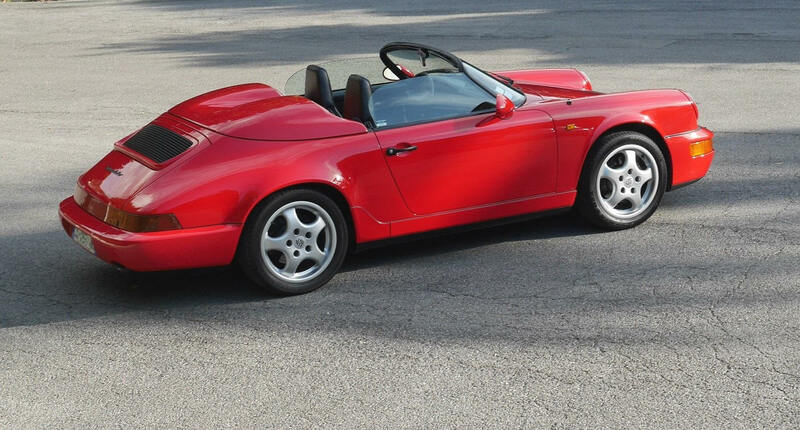 This copy is ideal. 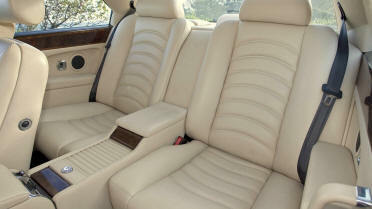 Beautiful model, the Continental R Mulliner provides access to the captivating universe of Bentley connoisseur. 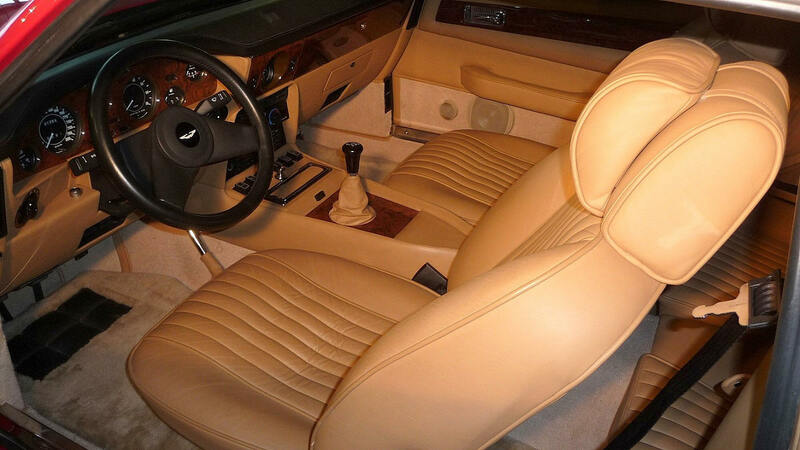 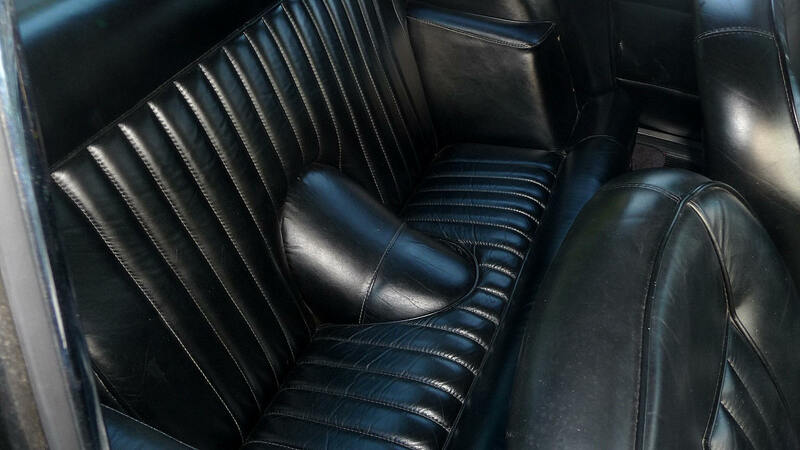 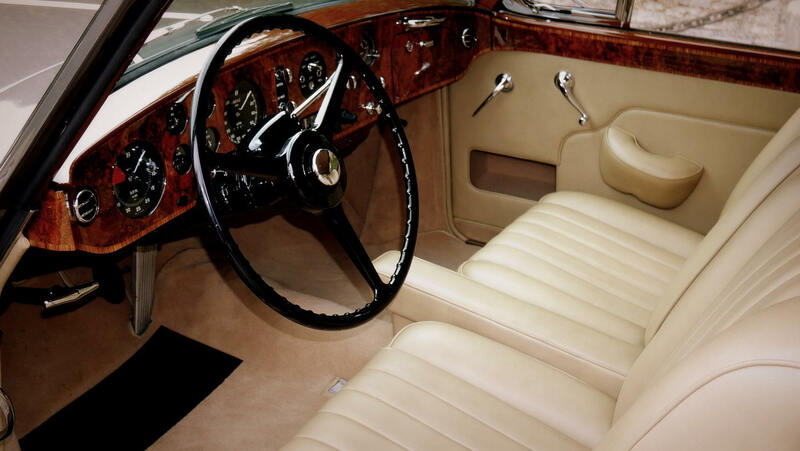 This version, rare (only 85 in left-hand drive out of a total of about 148), proposed the increased power of the legendary Continental T, while maintaining a "long" chassis, for the comfort of the occupants of the rear seats. 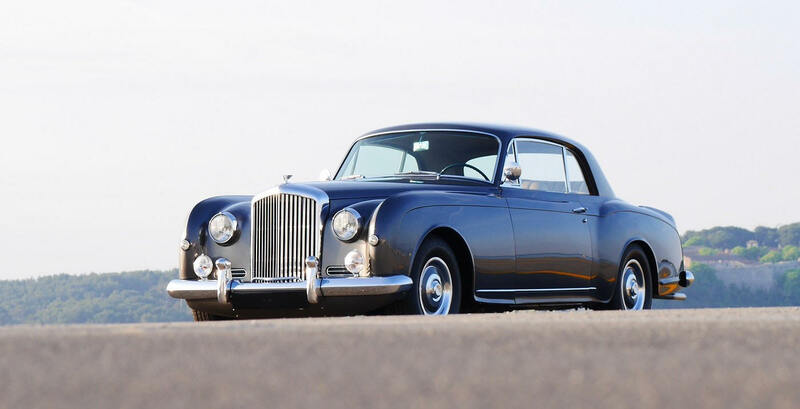 This great Coupé of extreme distinction is one of the most beautiful classic Bentley that can be acquired. 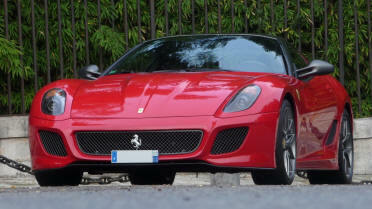 The proposed car was delivered new in Monaco, knew only two owners, by traveling less than 40 000 km. 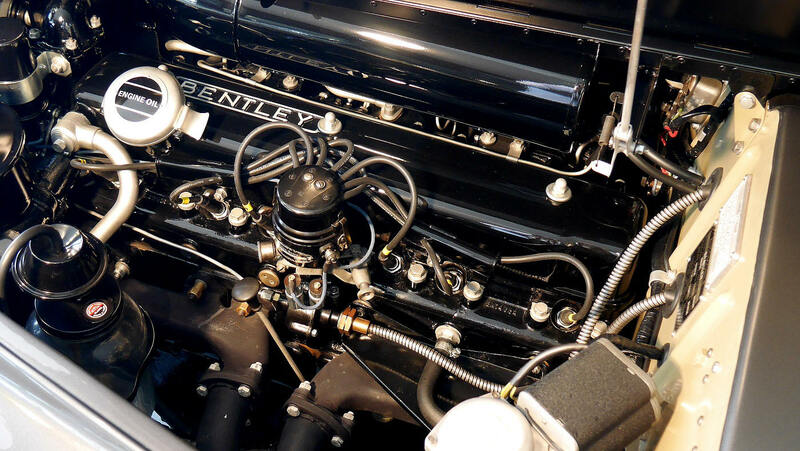 it has always been maintained by the Bentley network. 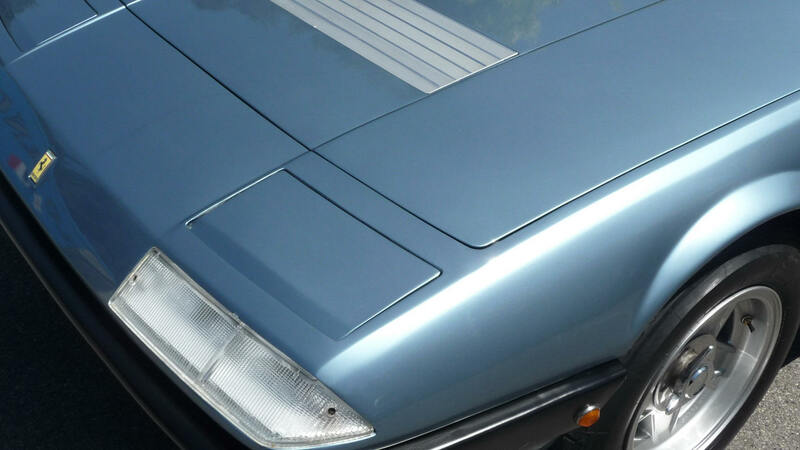 The body is finished in dark blue night. 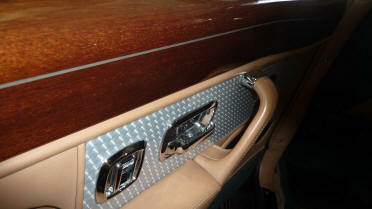 To travel in World of Perfection. The rarity of the model is of course a pleasure to appreciate, but also a pledge of wise investment. 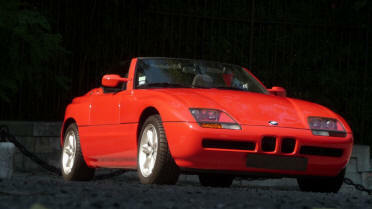 1999 / 40 000 km. 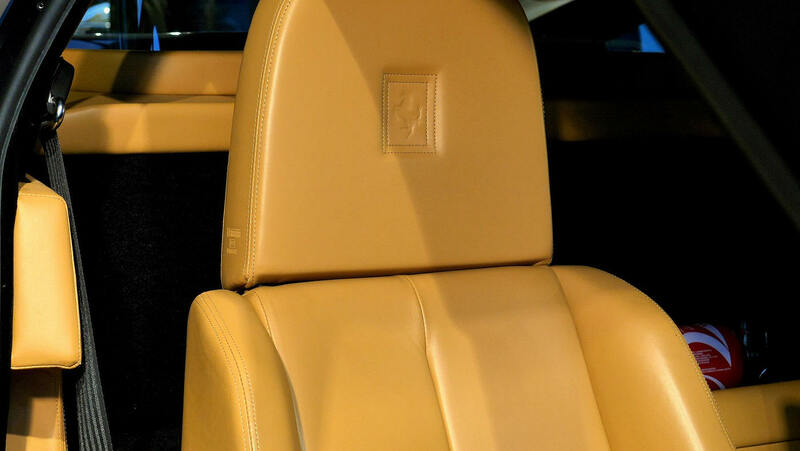 Highest and exclusiv model of the brand, as preserved by a confidential aura, these wonders so rarely seen, jealously preserved are almost never available for purchase. The V8 Vantage "X-Pack" benefiting of the V 580 X engine of more than 400 hp. was produced on order from 1986 to 1989, barely in a hundred copies, of which only 36 left hand drive. 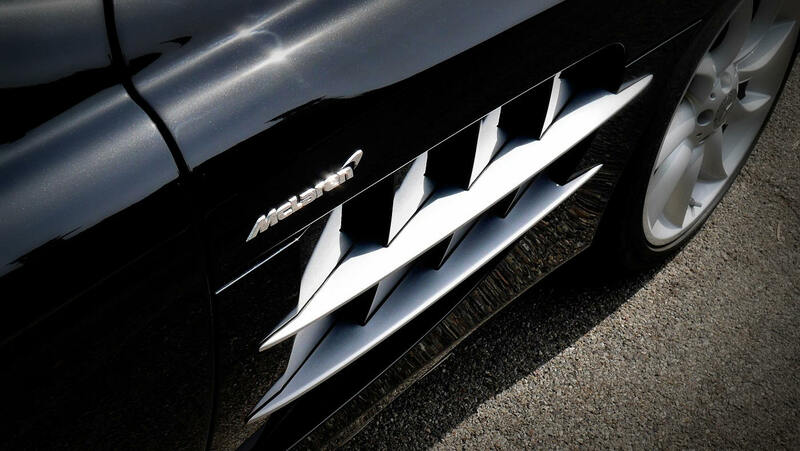 The brutal and classic style catches the eye, the horizontal chrome line is ideally placed, the visual impact is striking; Its unique presence combines power and sophistication, materializing the essence of the brand. 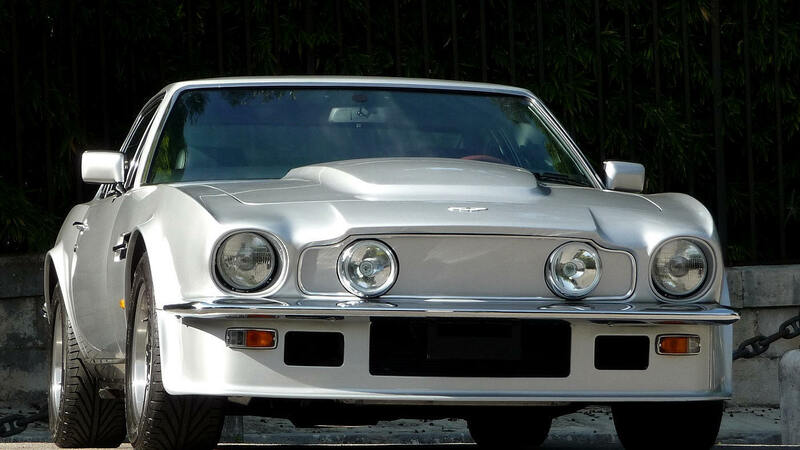 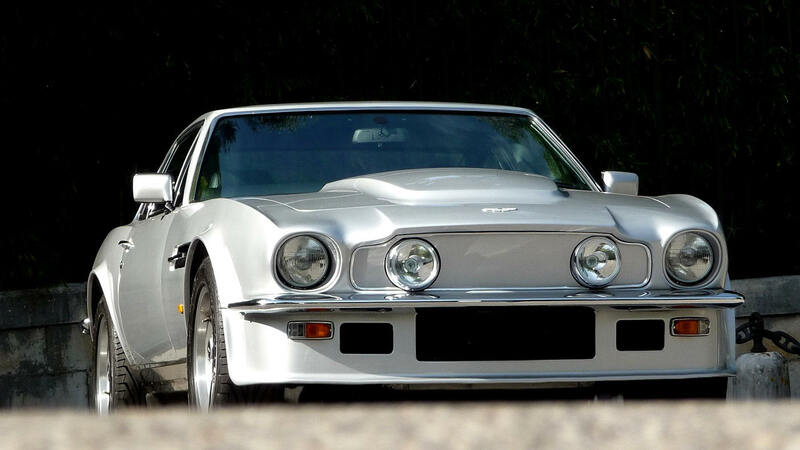 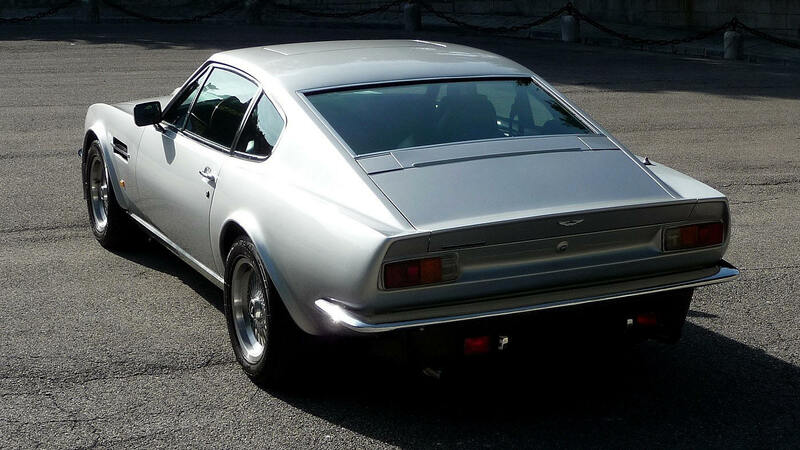 This is one of the rarest and most desirable Aston Martin classics. 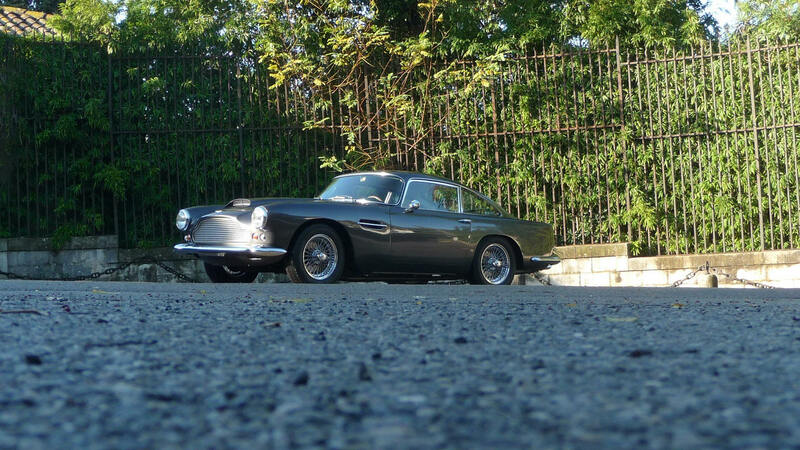 The Aston Martin DB4, jewel of the brand, is one of the most beautiful GT in history. 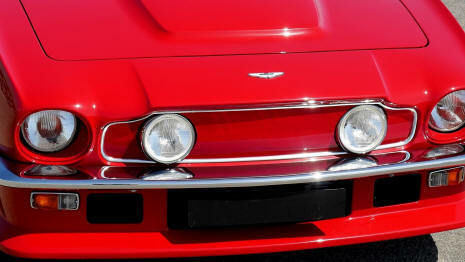 An eternal classic beauty, a presence that flies over the fashions, the unique and unique character of these cars has made Aston Martin a legend. 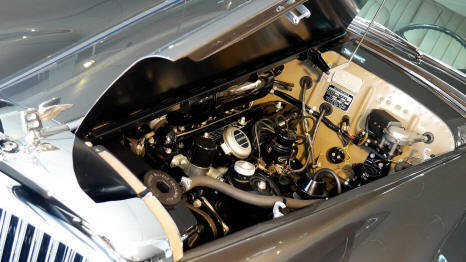 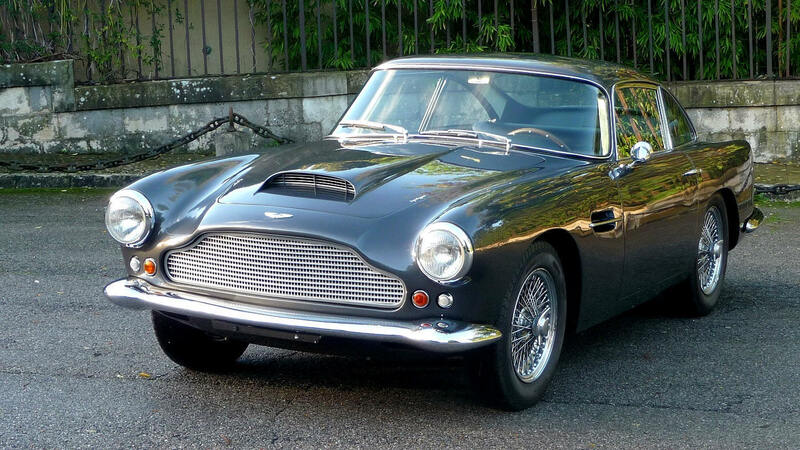 This 1960 Aston Martin DB4 was sold new by the Garage Mirabeau in Paris. Totally restored, in a very good quality, it is an excellent opportunity to acquire one of the most beautiful and iconic classic cars of all time. 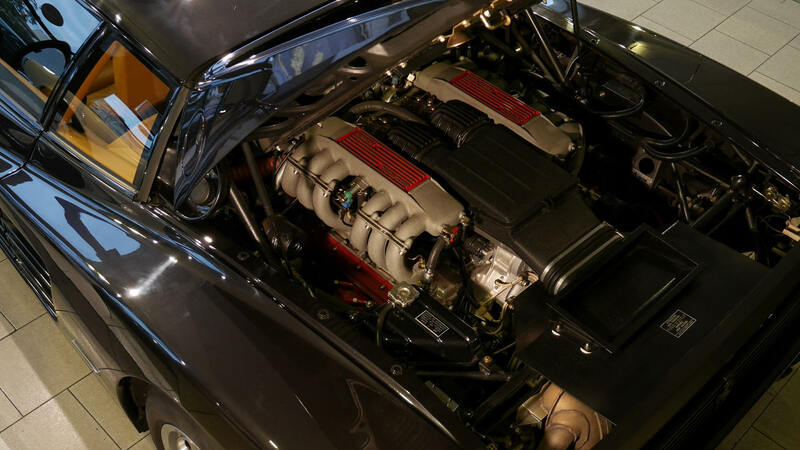 Sharp like a blade, perfect proportions, the 365 GT4 2 + 2 is a grand touring dream, under the hood, the magnificent 4.4 L V12 direct from the mythical Daytona. 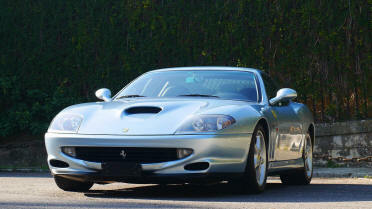 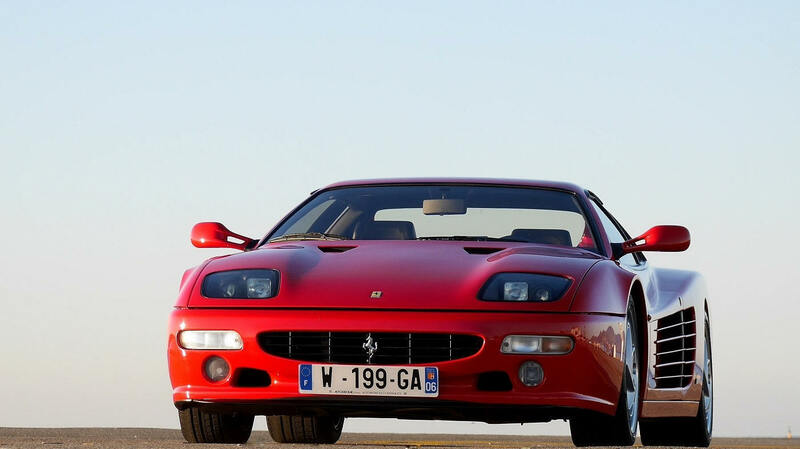 The most beautiful Ferrari 4 seater, terribly attractive, is currently the most affordable of all Ferrari V12. For those who understand, before the supply becomes scarce, and prices change scale.